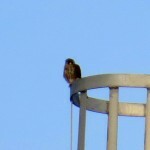 I saw one falcon on my short watch. 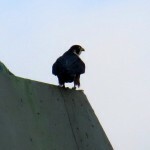 And I’m not sure who it was after reviewing my lousy pics and snippets (due to weather conditions). 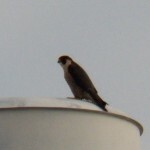 First of all, my tried and true Seneca Towers falcons were no where to be found as I started out at 7:15am-I had to wait for it to get light enough out to see anything. 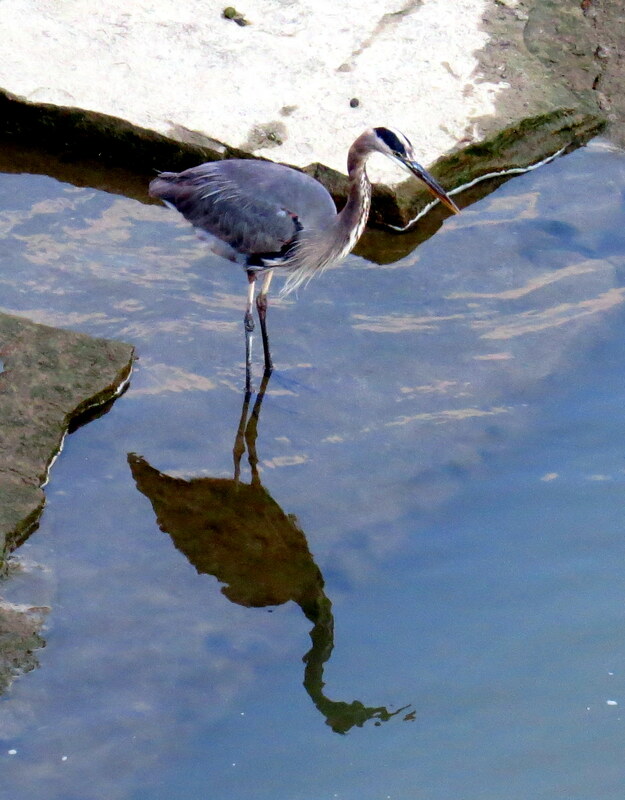 Once downtown I did my usual check from the Andrews St. bridge and saw nobody. 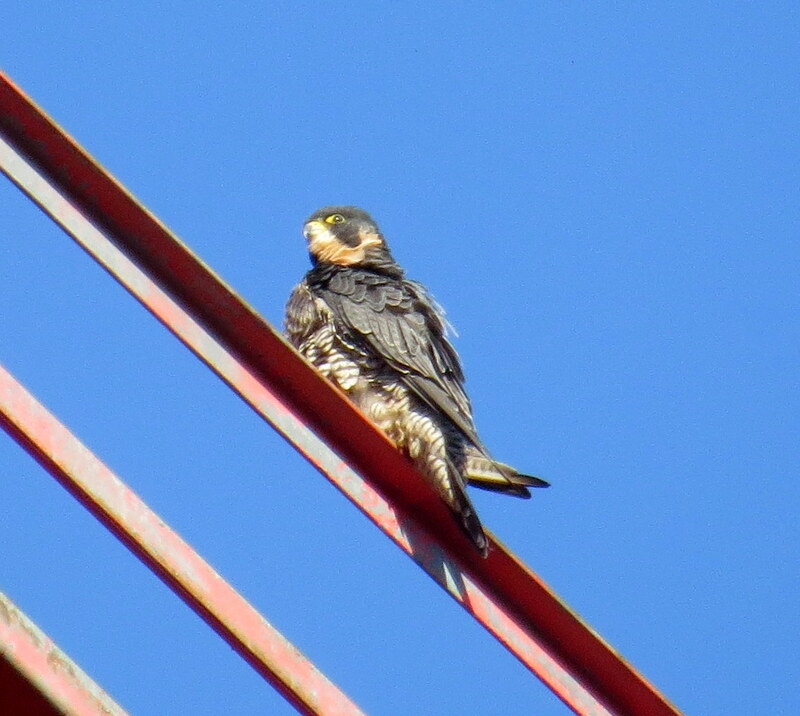 I thought for sure Beauty and/or Dot.ca would be up in the OCSR elevator shaft out of the weather but I didn’t see a falcon up there on either side. 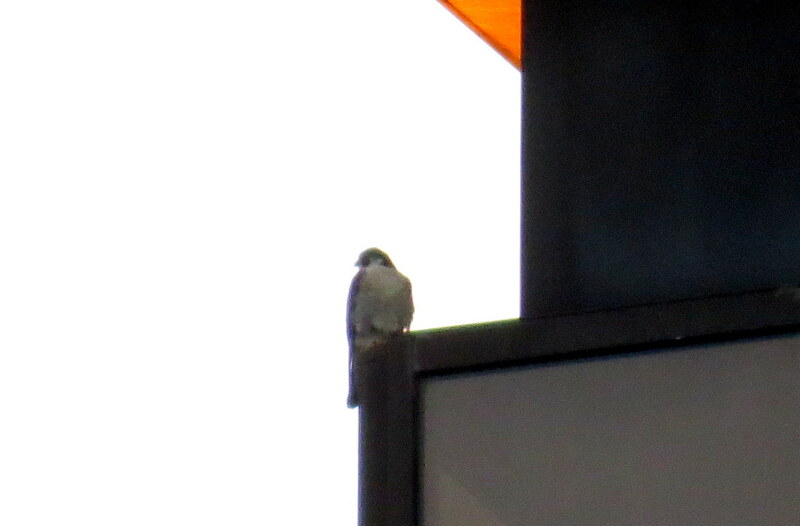 When I stopped on Woodbury Blvd. 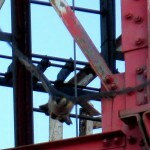 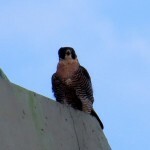 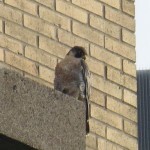 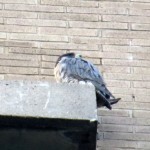 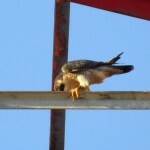 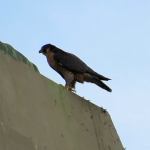 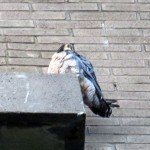 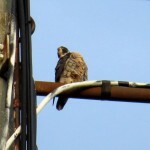 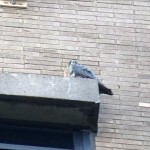 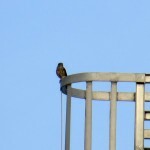 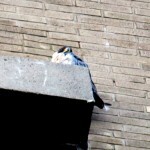 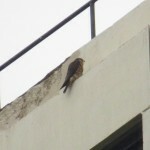 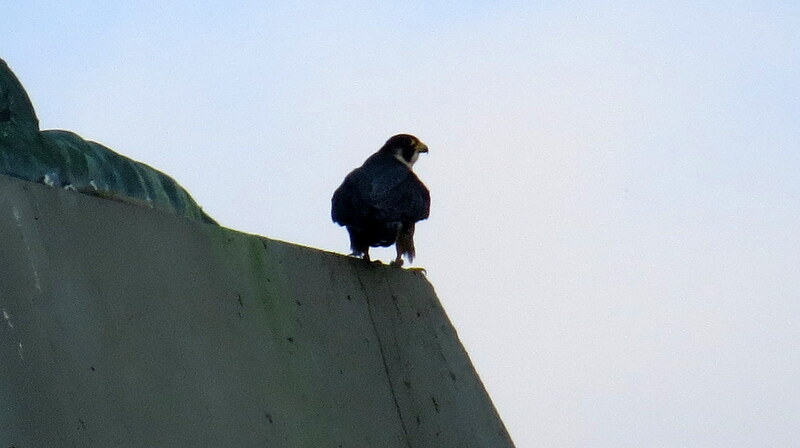 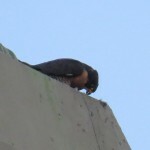 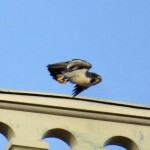 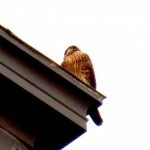 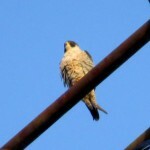 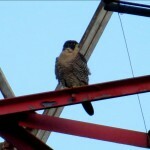 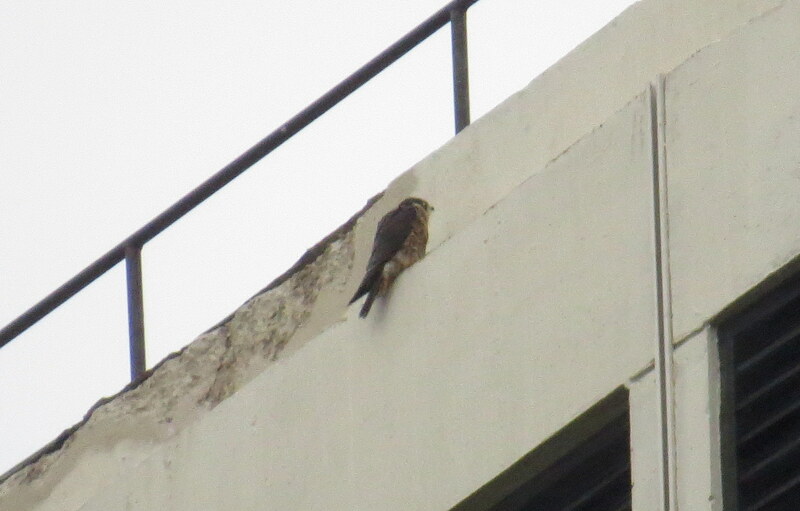 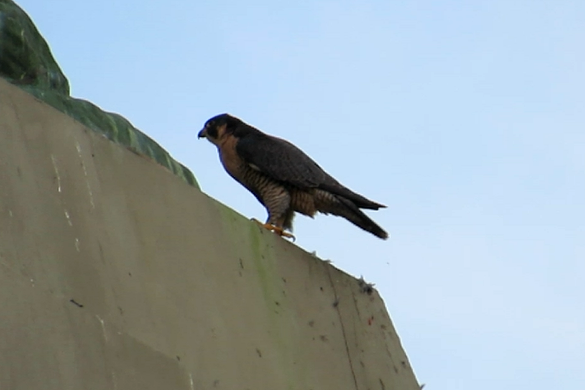 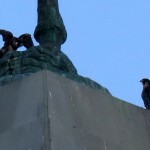 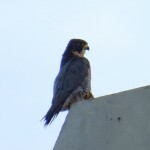 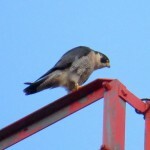 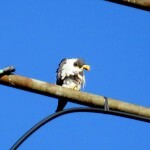 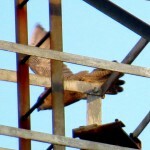 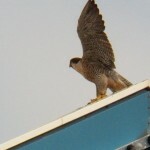 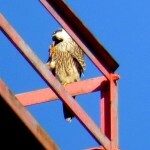 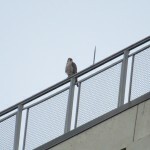 on the east side of the river I spotted a falcon on the east side of HSBC with its back to me. 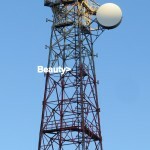 I parked south of Martin Luther King Jr. Park and thought I was looking at Beauty as it had a dark front. 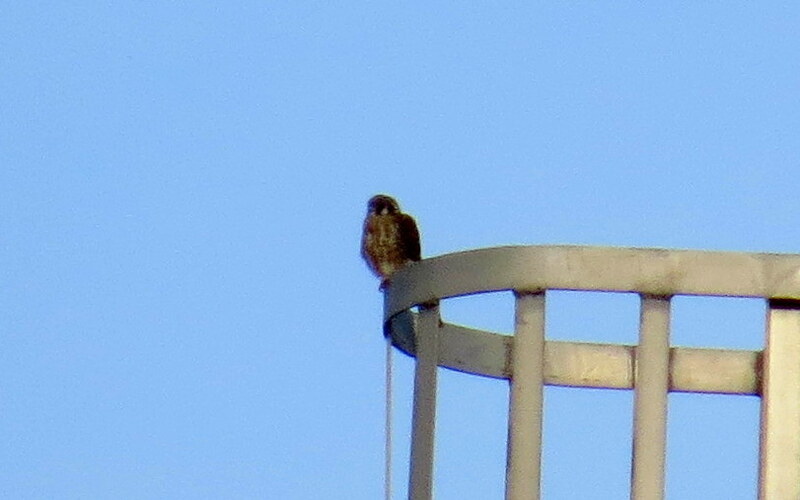 After checking my pics on my computer I now believe it was a juvie as it looks too dark and in the snippets it didn’t really move like the Beautyful one. 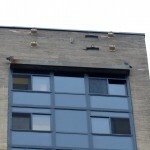 It was probably Genesee. 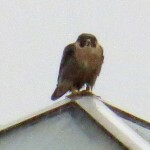 Due to the weather and distance the rest of my pics were really bad. 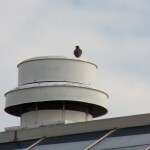 Unfortunately, I couldn’t stay as I had to take a friend to a doctor appointment. 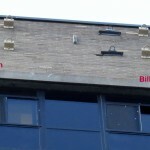 While I was waiting I did a quick check of the Medley Center but there were no PEFA’s there and when I got home to Seneca Towers at 10:10am I didn’t see Billie or Seth on the building. 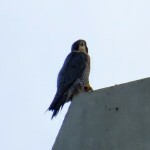 Kind of a dismal watch but I did see a falcon and as far as I’m concerned, a day without seeing a falcon is like a day without sunshine-so there was still reason to smile! 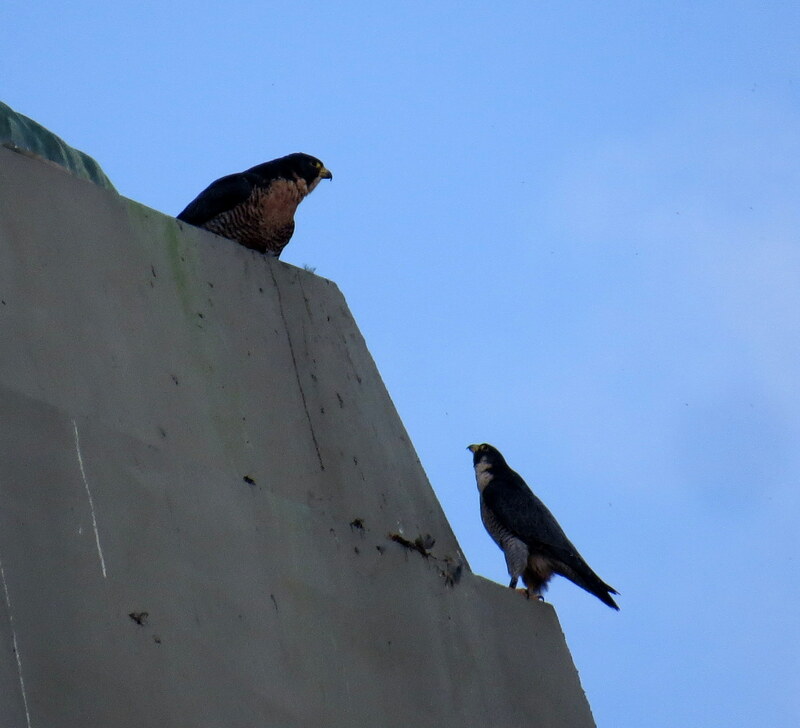 Seth and Billie were on the top north window ledge of Seneca Towers to greet me this morning as they do most mornings now. 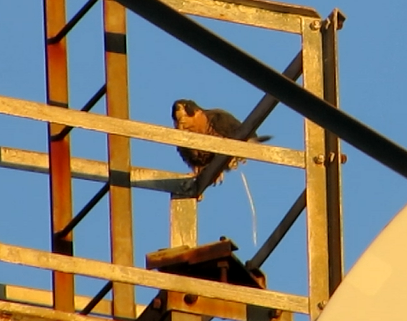 I went downtown after a couple minutes and after one trip around I spotted a falcon on the Mercury money bag (MMB) as I was coming from checking the east side at 7:25am. 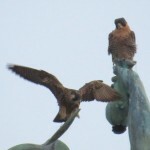 I pulled over on the Broad St. bridge (BSB) to see who it was and ended up with two for one. 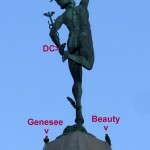 It was Beauty on the MMB and Genesee was on Mercury’s head right next to her. 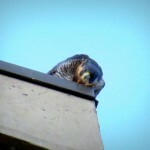 Genesee dropped down to the feather on Mercury’s hat a couple minutes later while the Beautyful one watched-she also was listening as he had a lot to say. 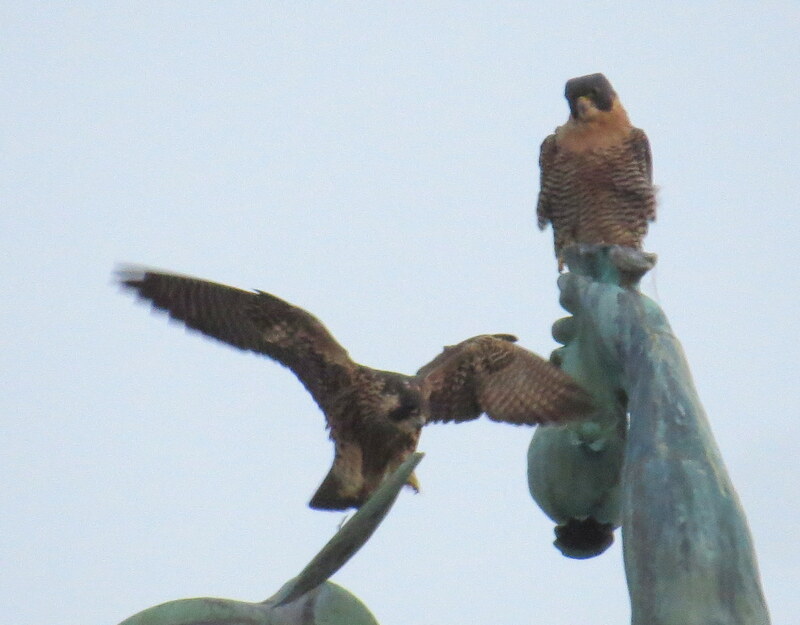 Both DC and Genesee flew east past the Chase tower as Beauty remained on the money bag watching. 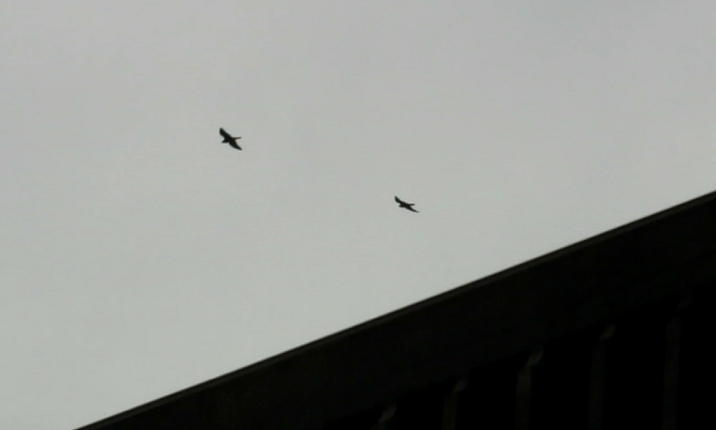 They came back flying west over the river at break neck speed-I couldn’t tell who was chasing who but I could hear Genesee squawking up a storm. 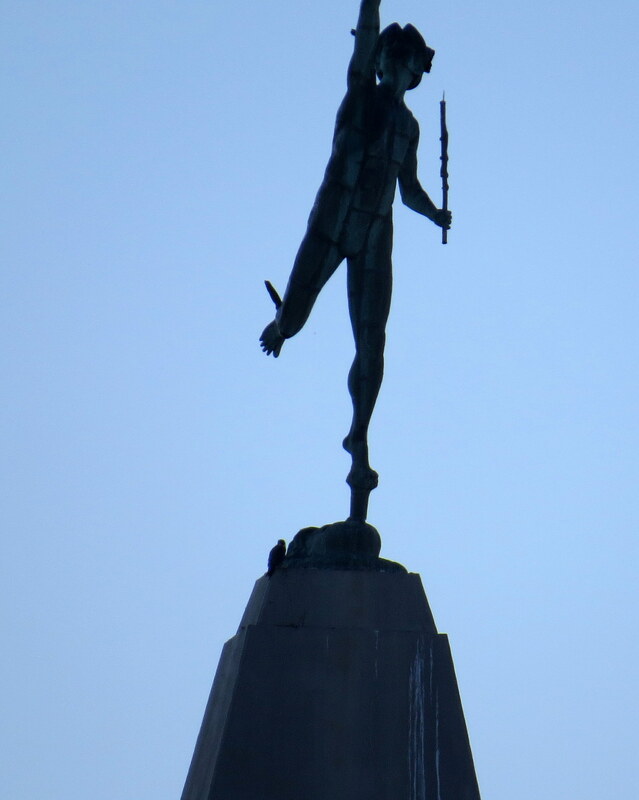 When they disappeared past OCSR I looked up at Mercury to see that Beauty had left too. 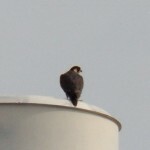 Around 8am I spotted 3 falcons flying above and around Xerox. 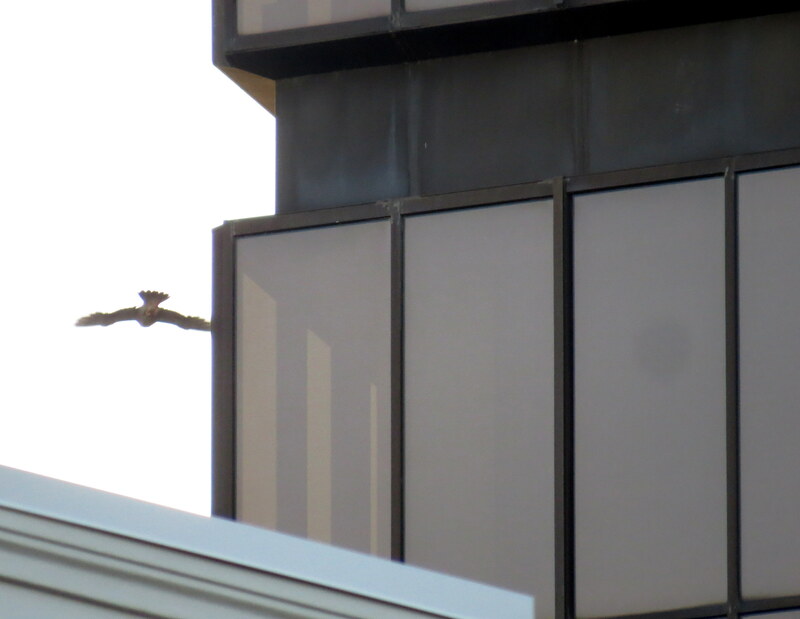 I stopped on the BSB to watch and ended up on Chestnut St. after I lost them. 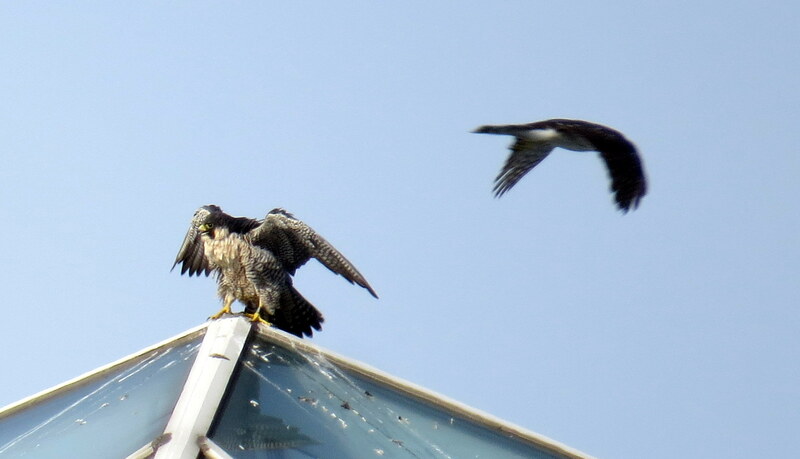 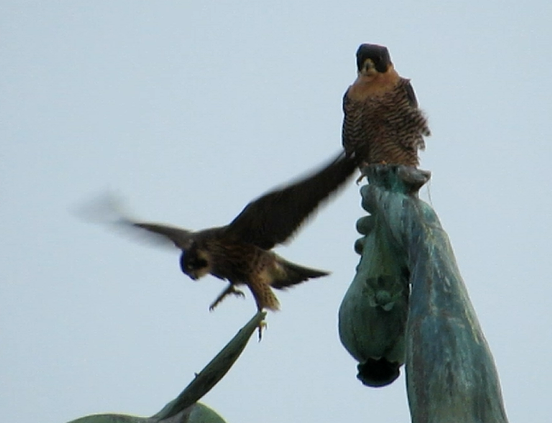 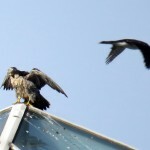 Beauty was hovering above Xerox momentarily as DC and Genesee chased and talon tagged with each other. 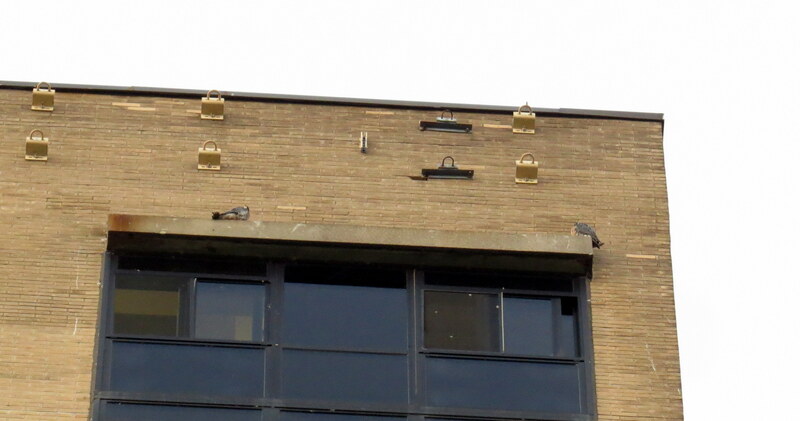 Then they all disappeared. 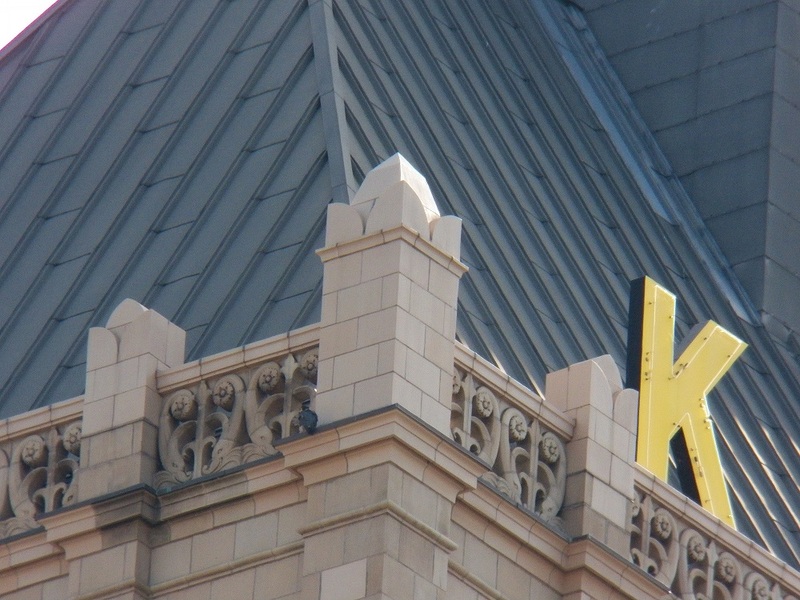 I left the east side and found DC on the east side arch of Kodak Office (KO). 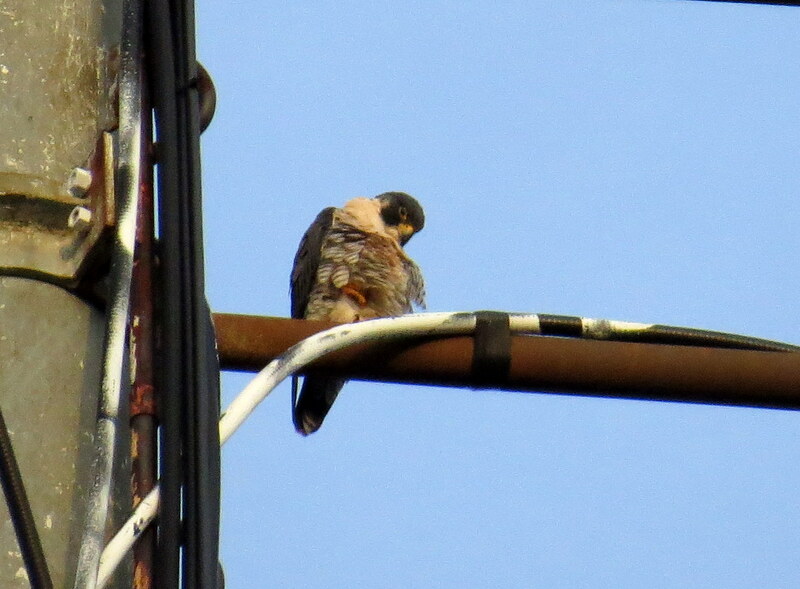 I parked near State and Brown St.-he was in hunt mode and flew off after some small birds only to return with nothing to show for his efforts coming to rest on the northeast corner of the playpen netting. 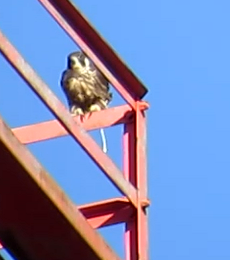 DC took off from there while I was tweeting his whereabouts and landed on the northeast corner of the launchpad with food-not sure if he caught something or had cached food but he plucked some feathers then ate some then stopped and stood there for a bit before walking over to the east side of the launchpad at around 8:20am, he just stood there as well. 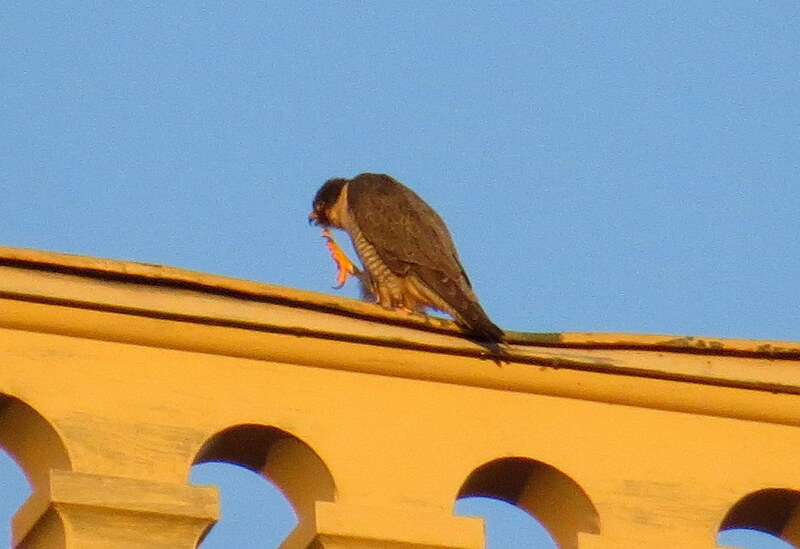 Perhaps he was looking for his son to give him the food. 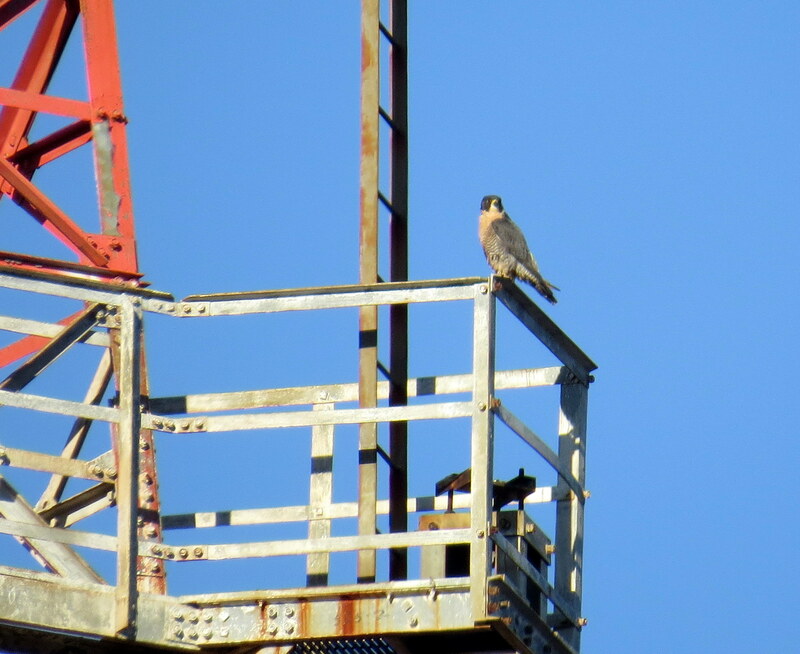 DC eventually turned his back to me-I was going to leave at that time because I had a full day planned but I decided to check the Frontier Communications Tower with my binoculars. I spotted a falcon on the middle arm so naturally I had to go investigate. 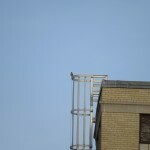 It turned out to be Genesee! 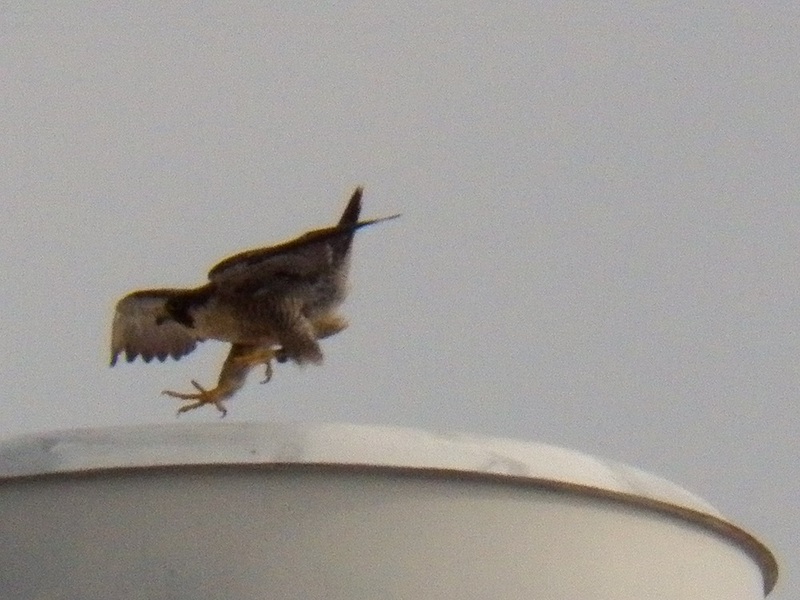 I took a few pics and recorded a video and then I had to leave. 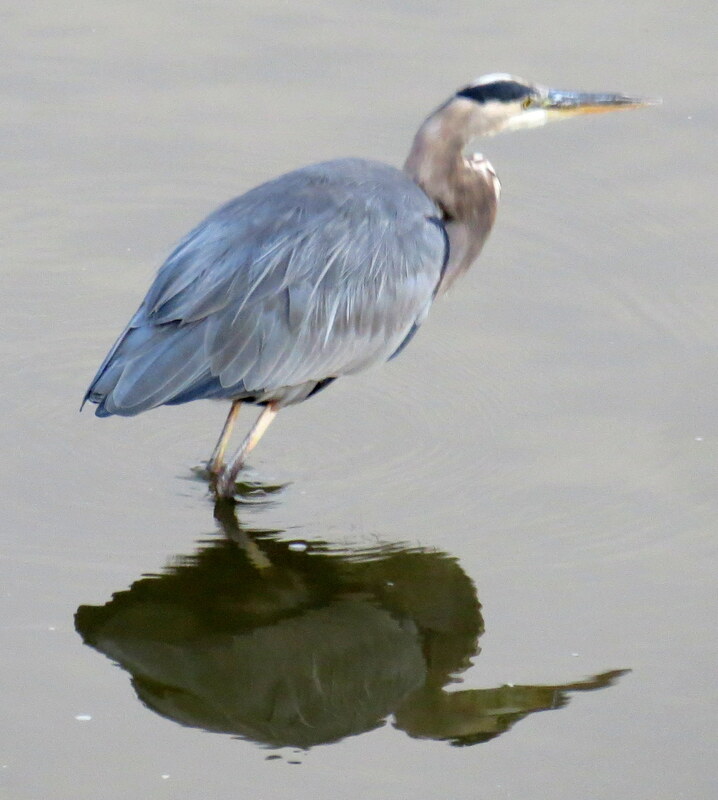 It was 9am when I ended my watch that was spent mostly under rainy conditions, but it didn’t stop me from smiling as Genesee had come back yet again for another visit! 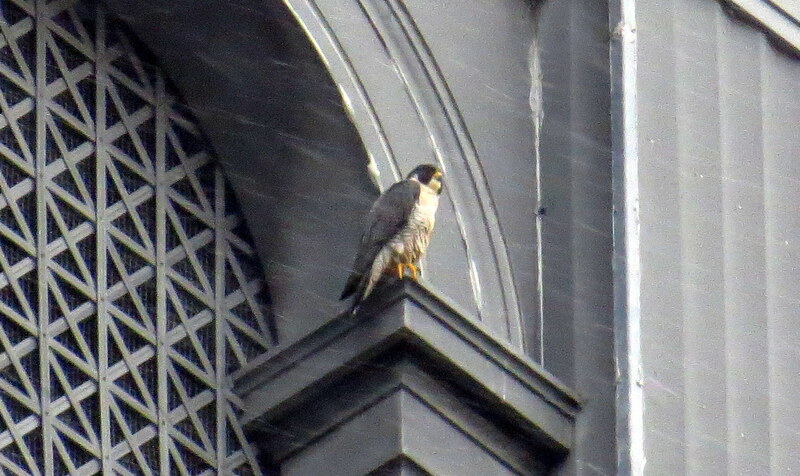 As I got closer to downtown the rain came down a bit harder, but still light. 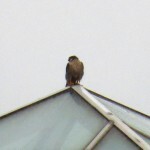 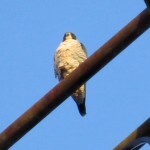 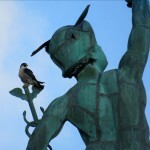 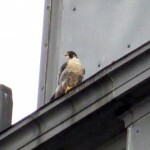 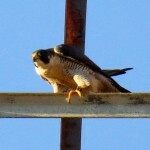 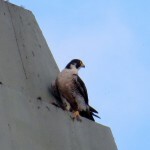 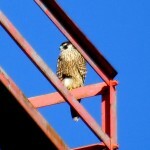 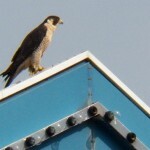 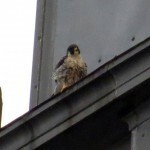 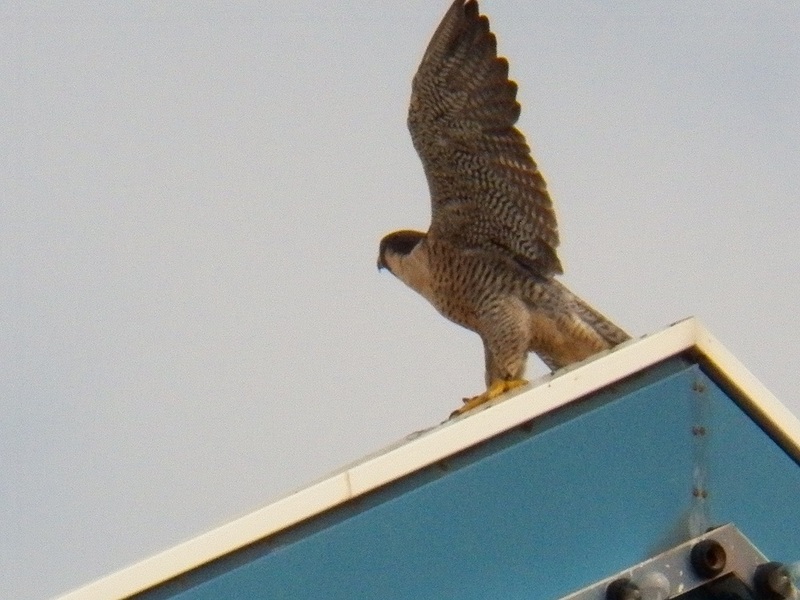 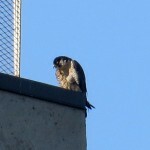 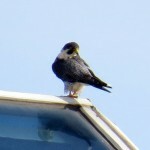 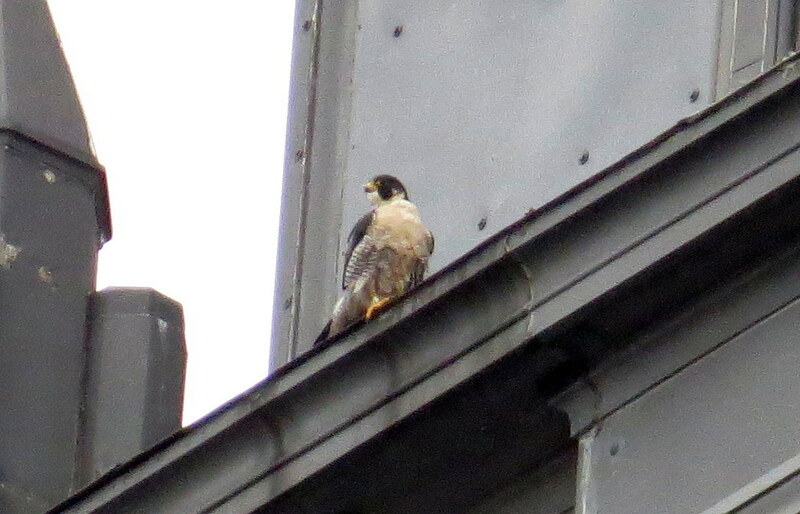 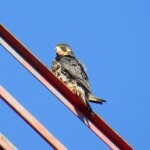 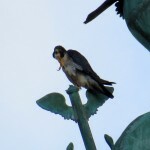 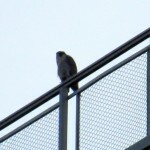 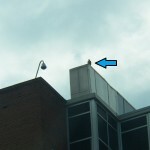 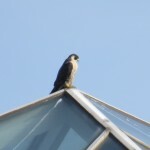 I spotted a falcon on the northeast corner of Kodak Office (KO) from the traffic light at State St. and the inner loop. 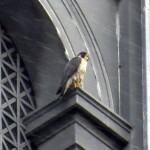 I ended up on State St. just past Platt St. At first I thought it was Beauty due to the darkness and it was wet too. 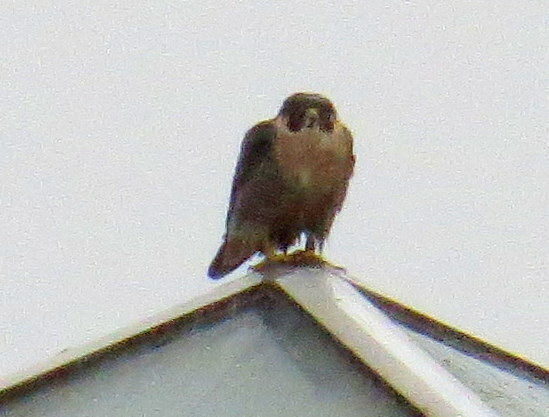 The vertical brown feathers told me it was a juvie. 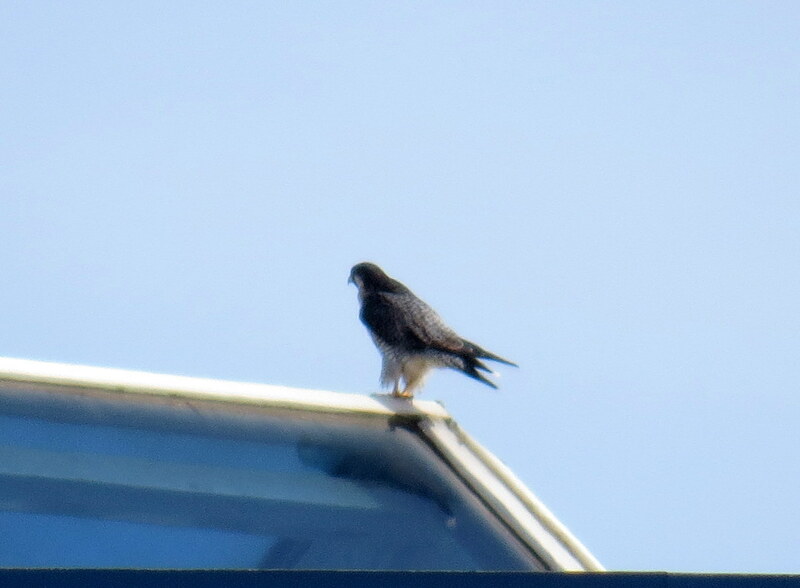 It seemed small like a male, so it could have been Genesee visiting again. 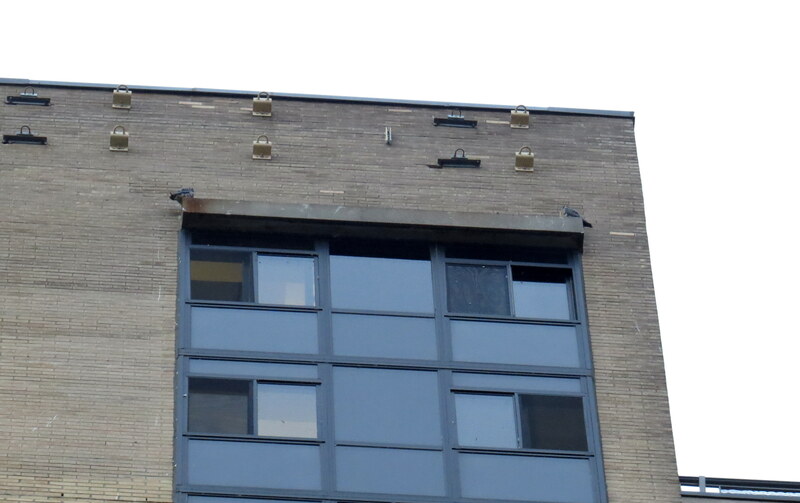 No way of telling for sure. 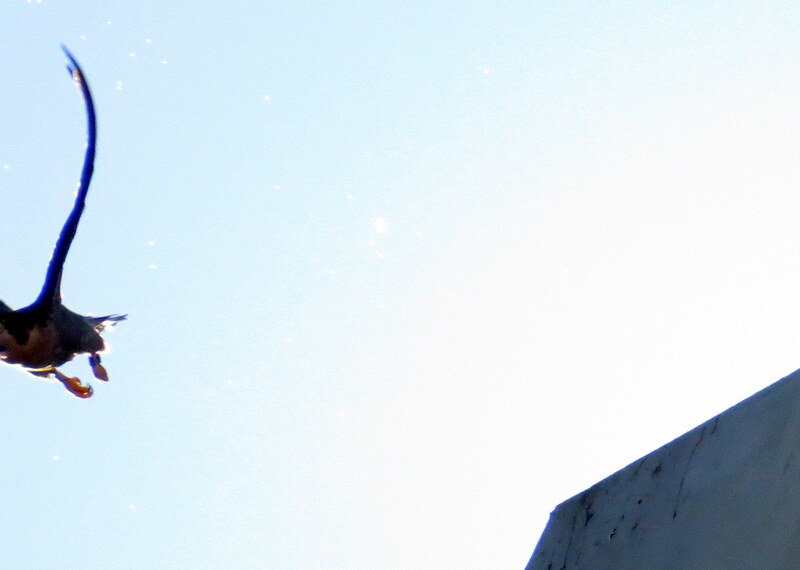 A school bus stopped by me to pick up a kid, blocking my view. 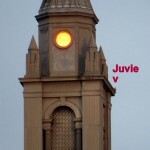 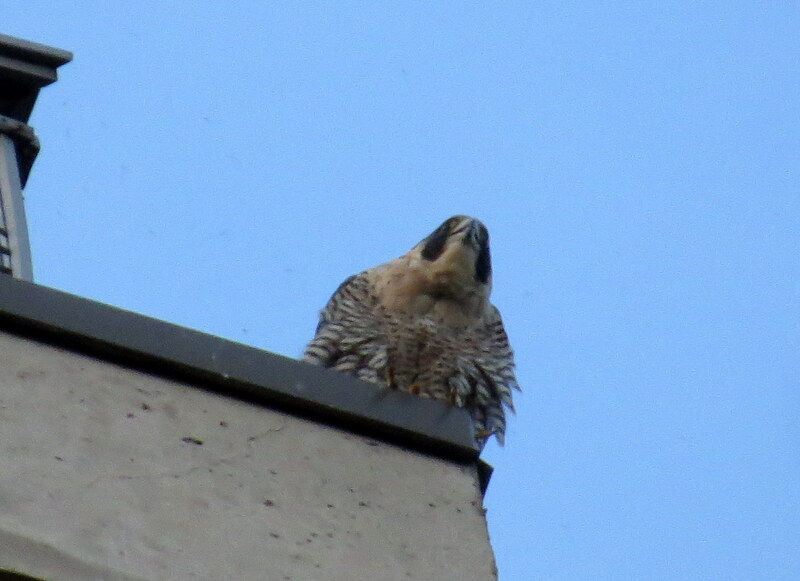 When it pulled away I looked up to see that the juvie had gone so I had no idea what direction to look for it. The rain became more moderate and after an hour of searching I came to the conclusion that perhaps I wasn’t finding a PEFA because Beauty and Dot.ca were off escorting the juvie out of the area. 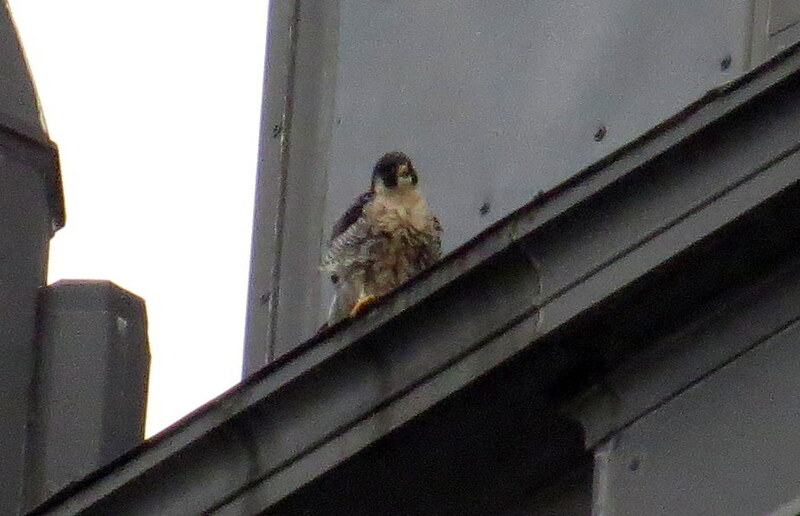 She was looking very dark because she was wet but I could see the black/black band on her left leg and no band on the right telling me it was definitely BF. 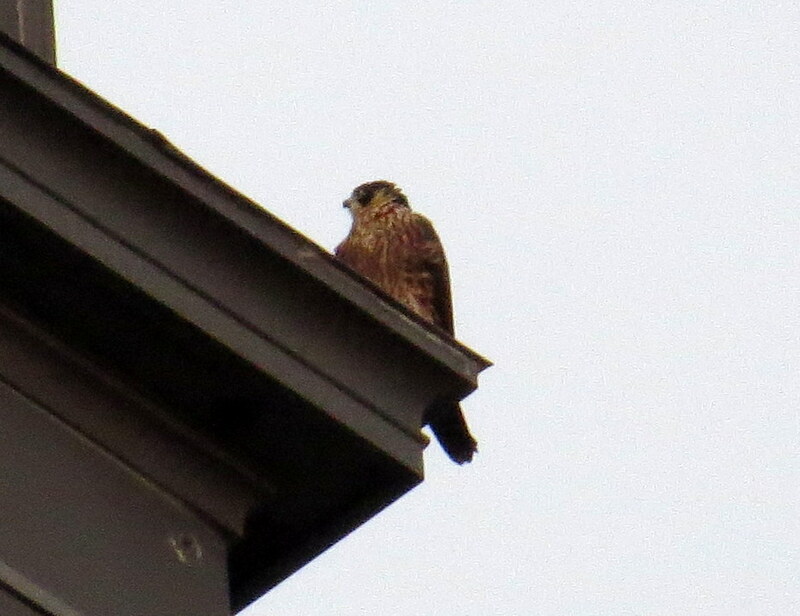 She flew off to the southwest at 9:04am and didn’t return. 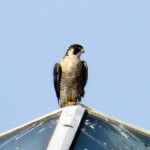 That’s all she wrote as I went home and found no falcons at Seneca Towers either thus ending my watch at about 9:30am. 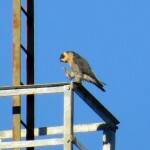 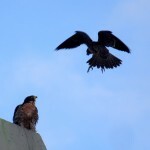 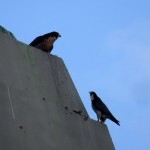 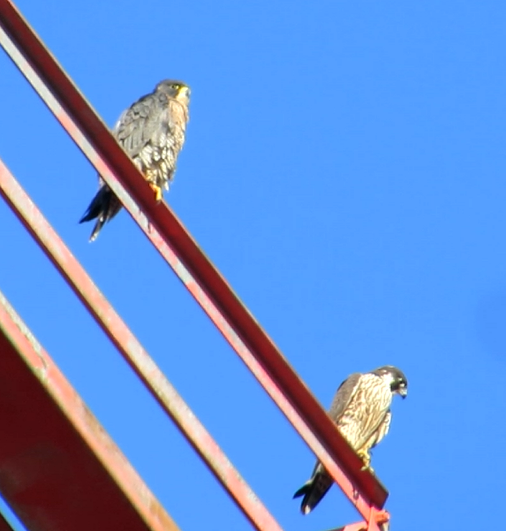 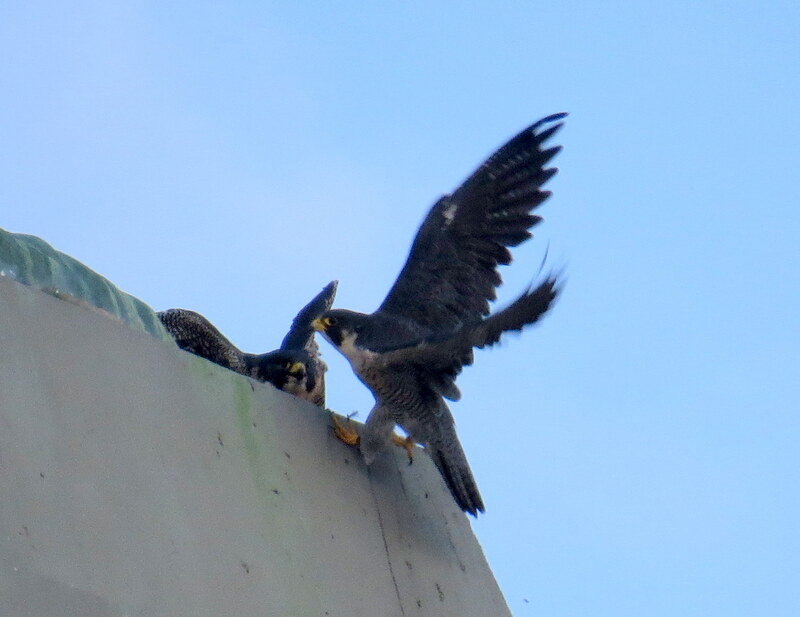 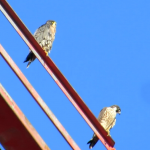 2 adults and one juvie Peregrine Falcons works to get me smiling! 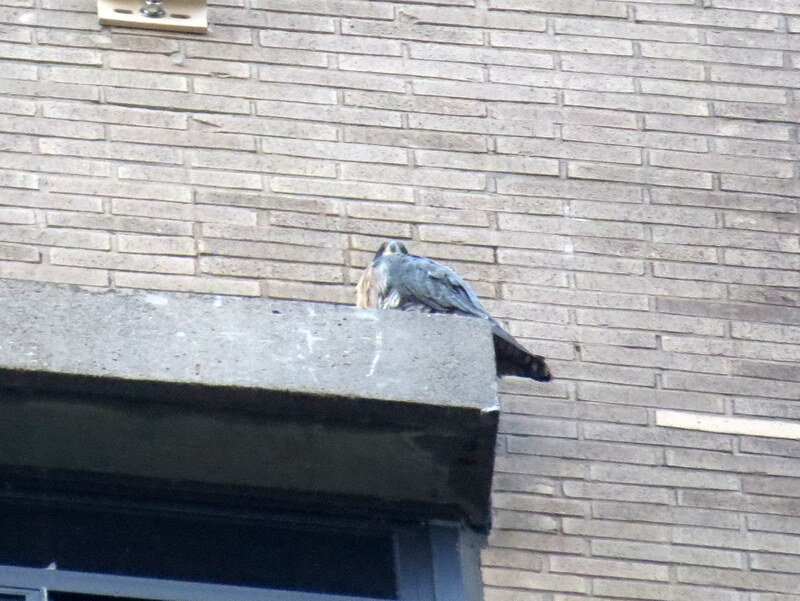 Billie and Seth greeted me this morning from the top window ledge north end of Seneca Towers. 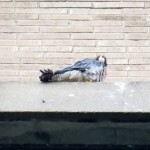 I left for downtown after a quick look at them leaving them to wake up. 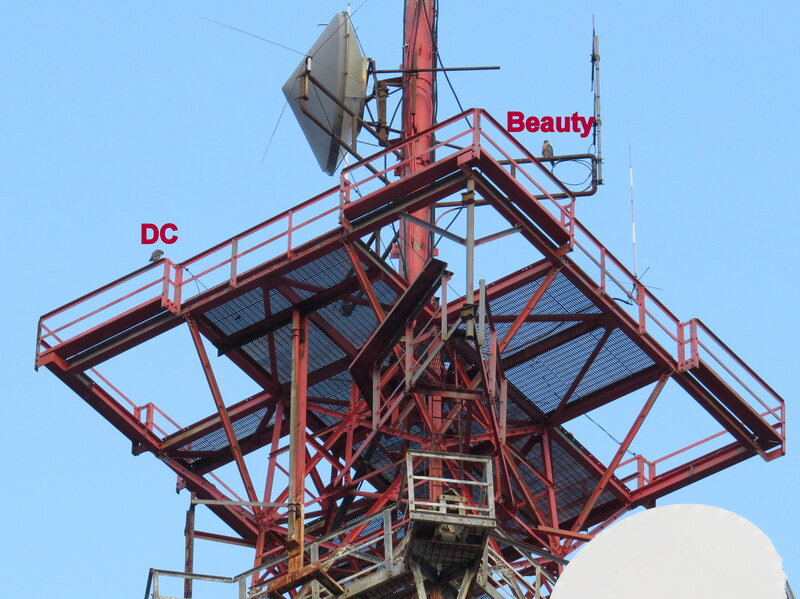 I found Beauty on the northeast cube of the Frontier Communications tower (FCT) from the Andrews St. bridge before going over to Fitzhugh St. to be closer. 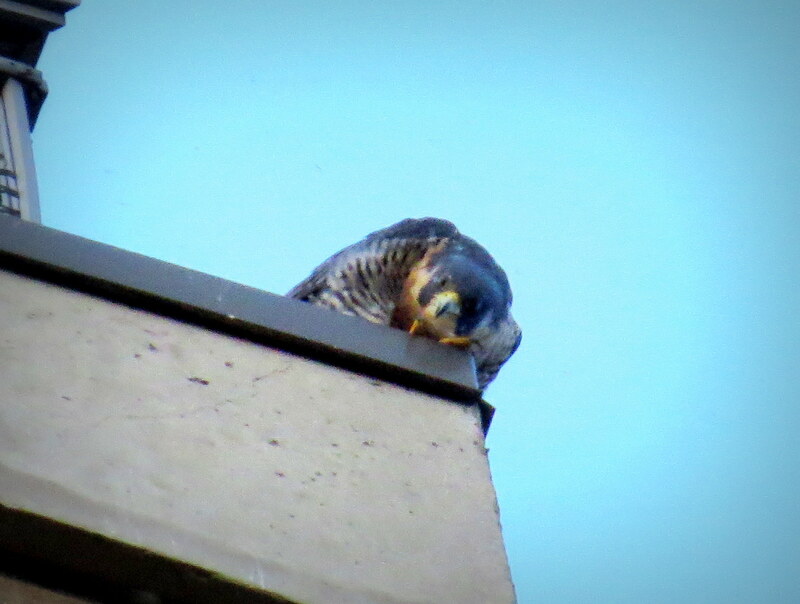 She was watching her surroundings pretty intently and after a while something caught her attention below her that I couldn’t see. 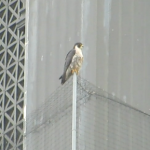 The Beautyful one flew off around the north side of FCT and landed on a west side beam,then into the middle lower red section and then settling out on the south side top beam of middle red section. She didn’t stay for long as she flew southeast at 7:38am. 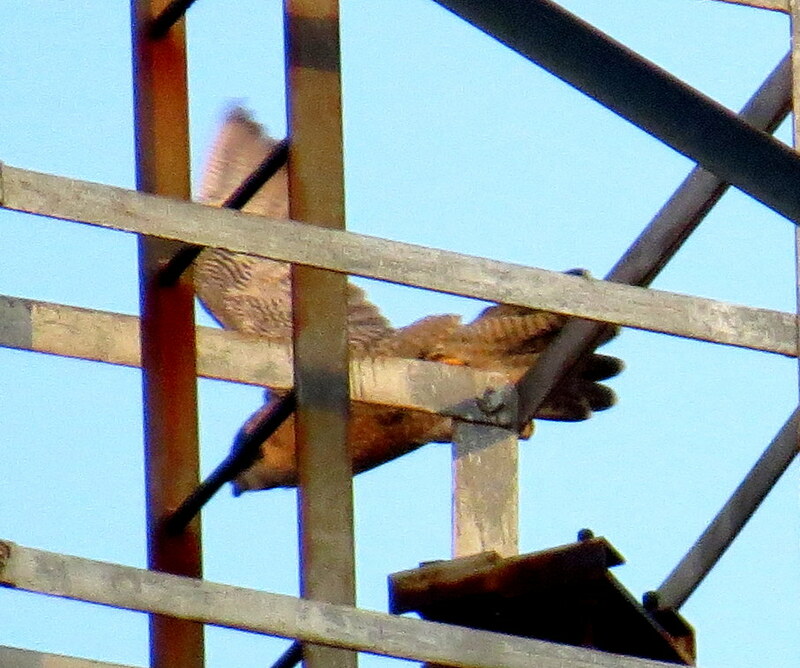 Not sure what all that was about for I didn’t see anything below her anywhere. 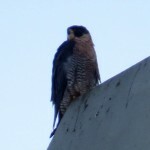 I went to the Court St. bridge on my way to check the east of the river since that was the direction Beauty had gone from FCT and before I could cross I spotted a falcon flying above Xerox so I pulled over to observe. It was dark so I was sure it wasn’t Dot.ca but the distance and back lighting didn’t make for very good pictures of this falcon. 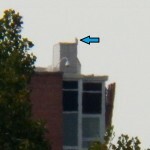 It went very high at one point, then out over the river and back to Xerox to ride the therms just above the roof. 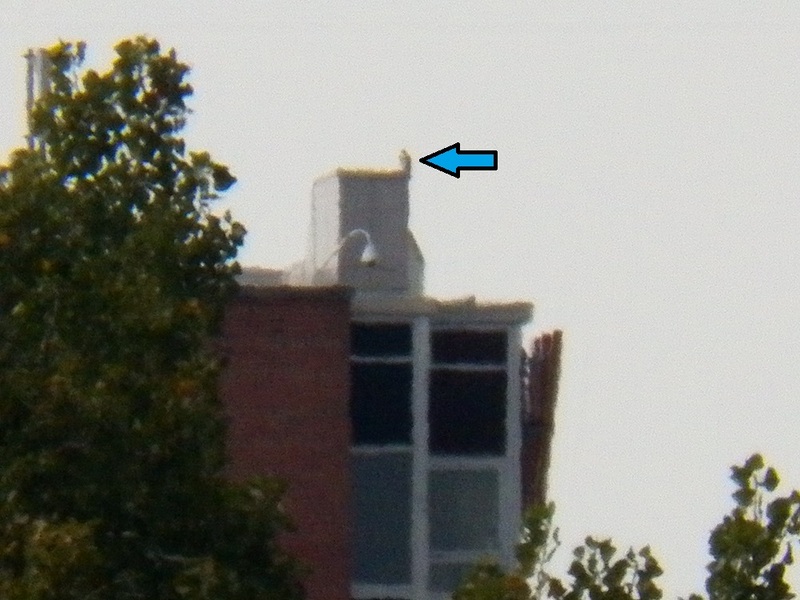 It landed many times on various antennas on the roof just barely touching down then taken up by the wind currents. 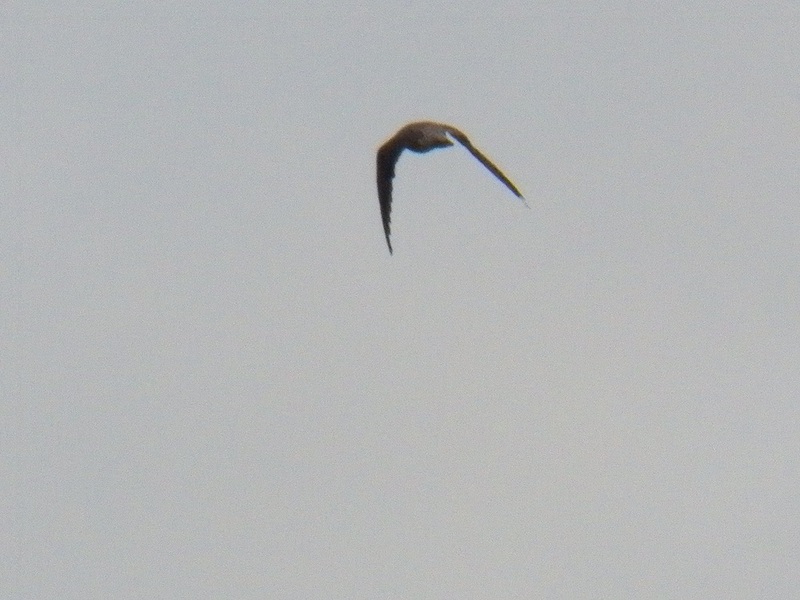 It ended up drifting to the south out of view. 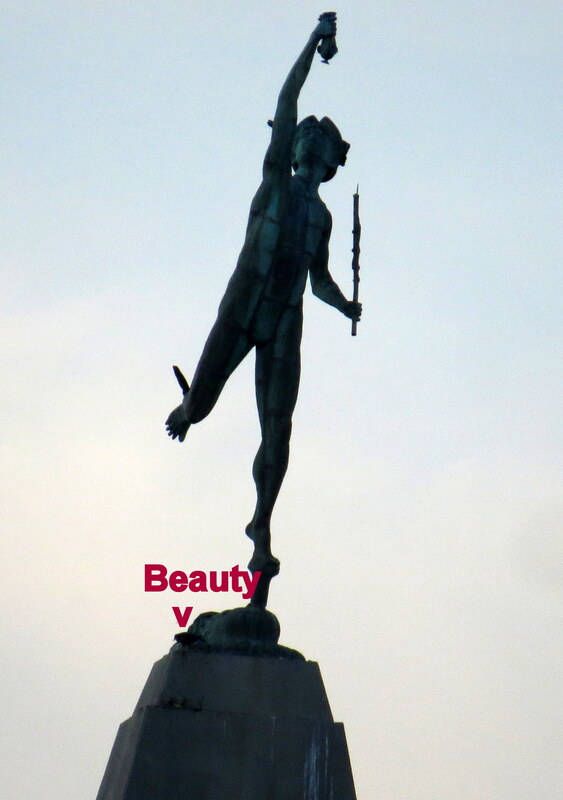 I suspect it was Beauty but can’t say for sure-whoever it was gave me a nice show! 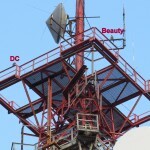 I checked out the rest of the east side and could find nothing and ended up back at FCT where Beauty was on the northeast cube again. 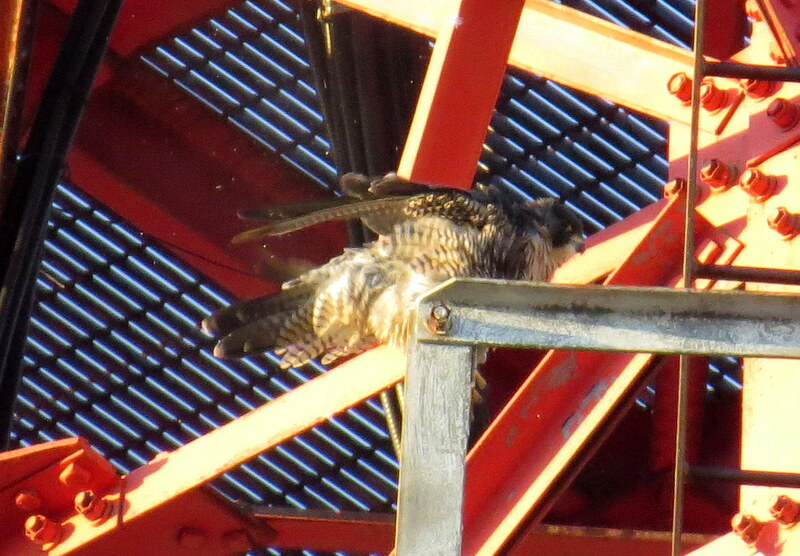 In the short time I spent with her, Beauty pooped and did some wing stretches. 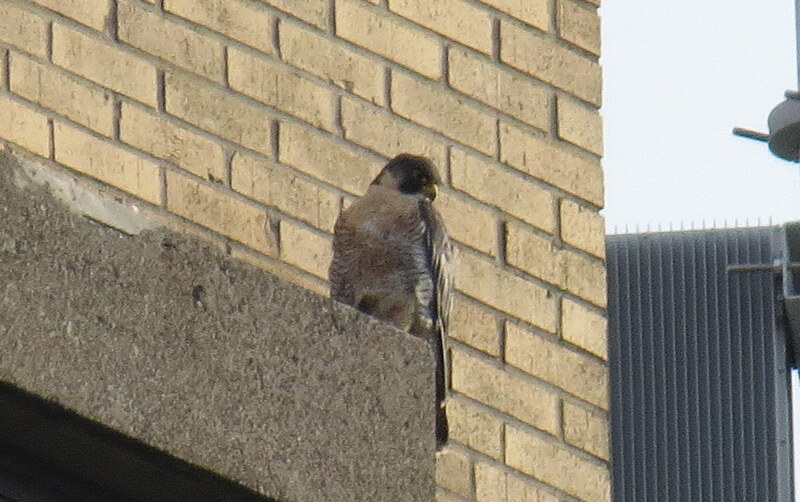 I left her about 8:15am and did a quick check for DC but couldn’t find him so I headed over to the Medley Center. 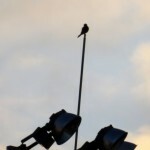 There was nobody there and I had to get a move on as I have to be somewhere later this morning. 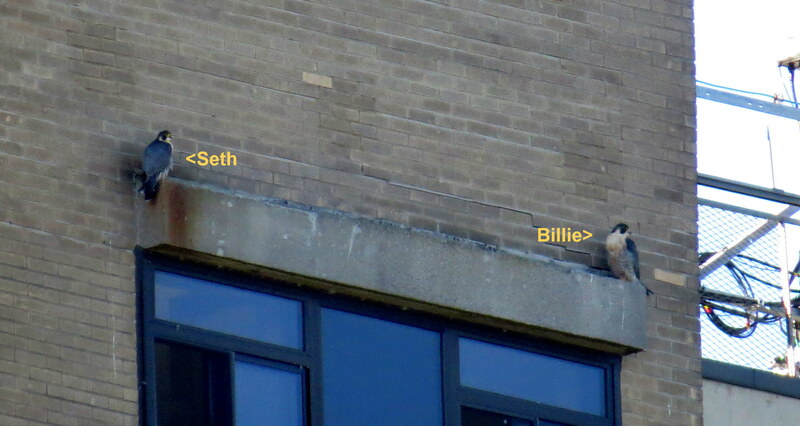 When I got home home to Seneca Towers neither Billie or Seth were around. 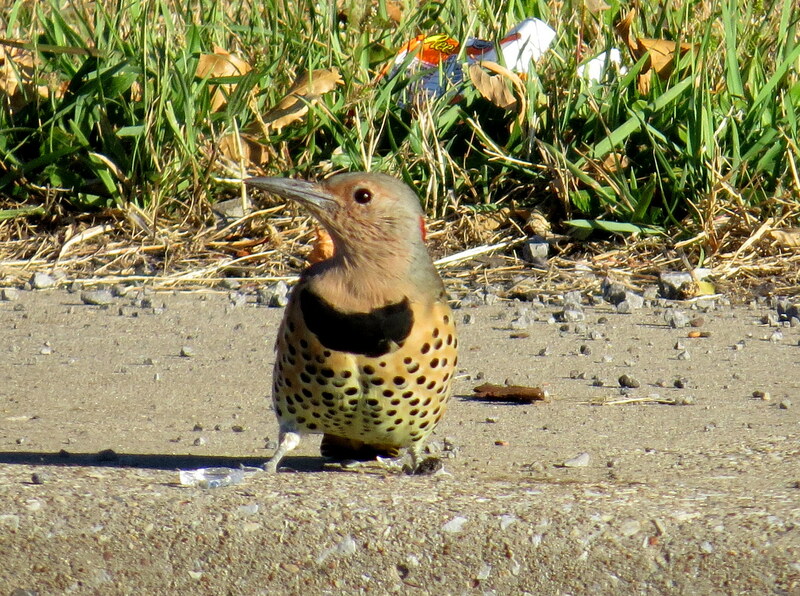 I ended my watch at 9am after spending most of it with Beauty-she always makes me smile don’tcha know! 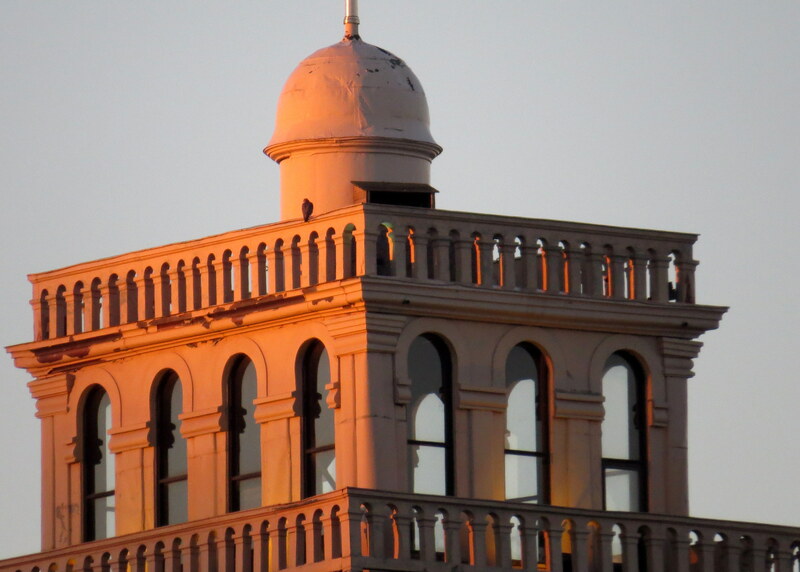 The days continue to be lovely with afternoon temps in the high 60’s. 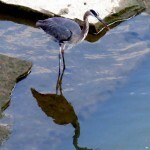 Loving the continued warmer temperatures and sunshine. 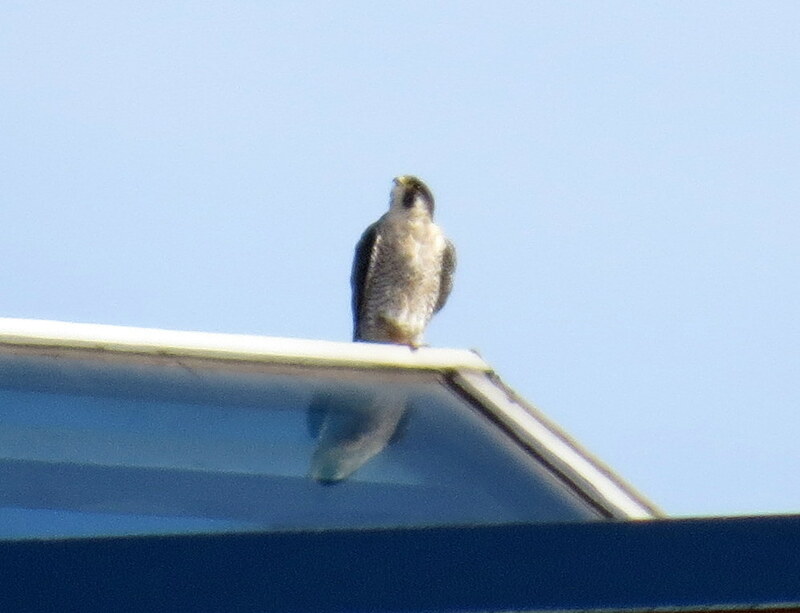 9/25/15 (Friday) - A Falcon Watch with Big Frank(ie) (BF) at the Medley Ctr. 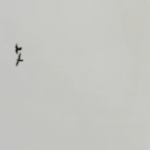 Dana tweeted that BF was at the mall, so that’s where I headed. 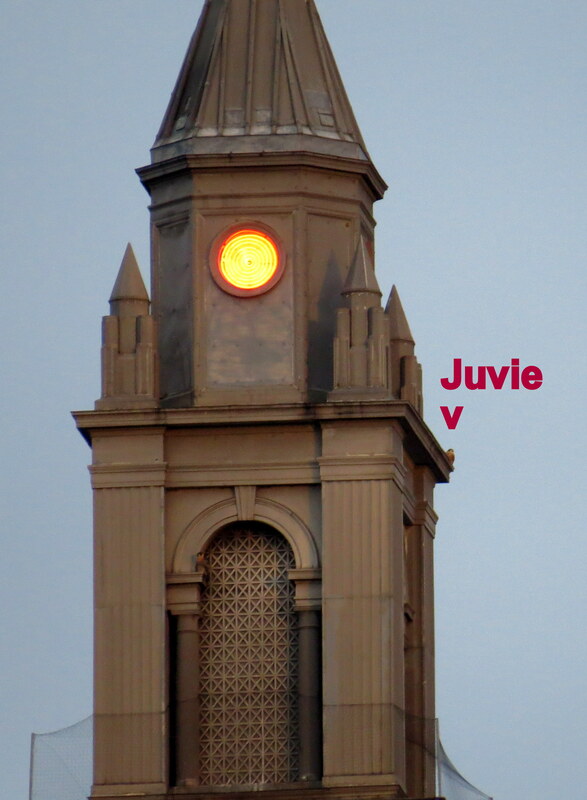 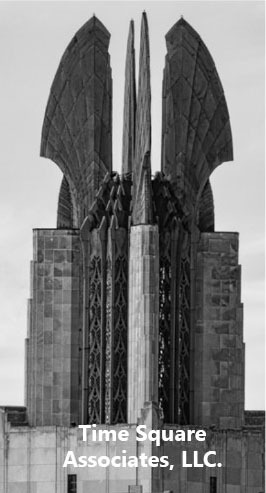 When I first arrived, she was on the white vent cap on top of the carousel bldg. 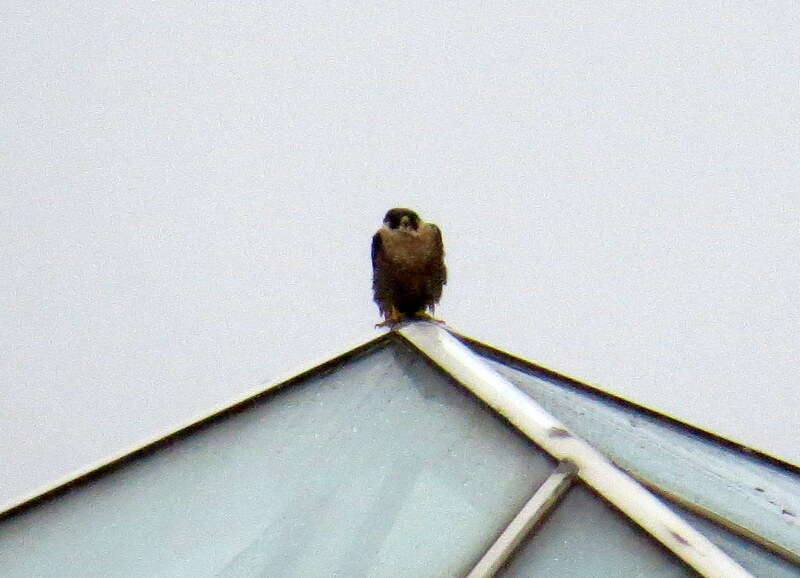 BF took off and flew to the north side of the mall. 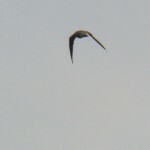 I followed and saw her chasing the gulls. 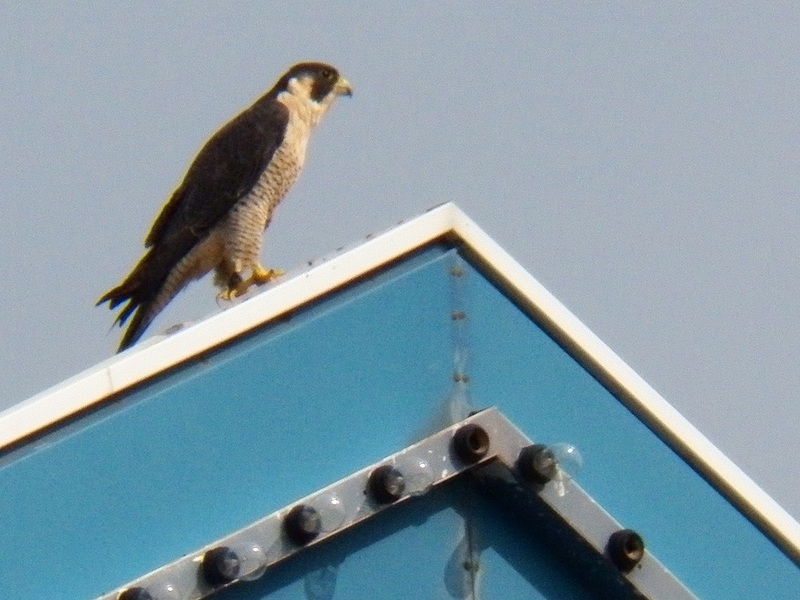 She flew back to the south side of the mall and I found her on the peak of the carousel roof. 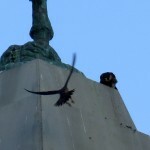 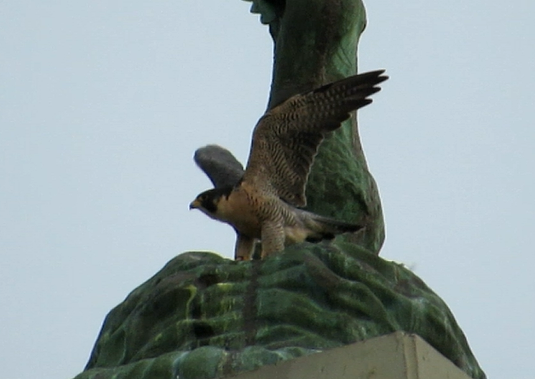 She continued hunting, landing on various spots on the mall. 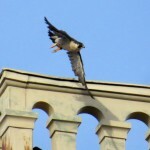 Then Big Frank(ie) took off and flew higher and higher. 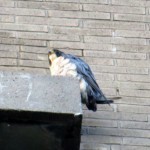 I saw her go into a long stoop to the southwest of the mall. 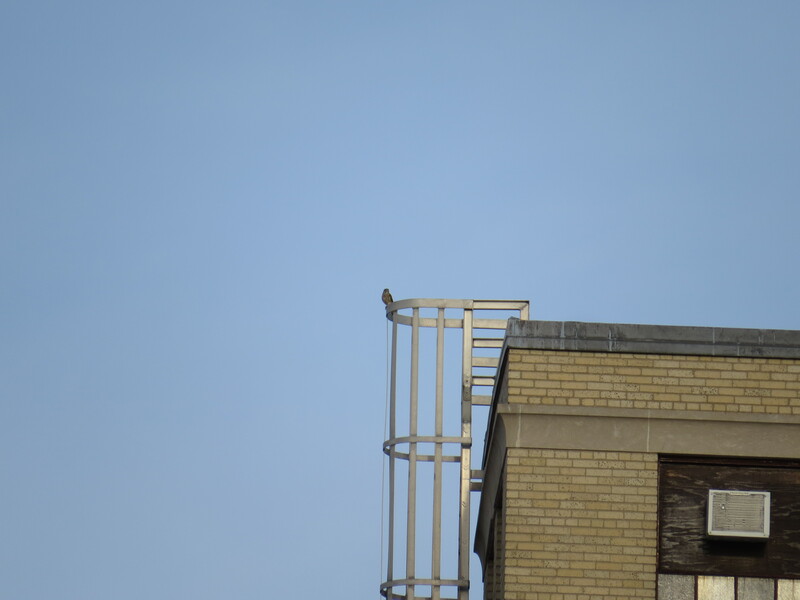 I waited to see if she would return. 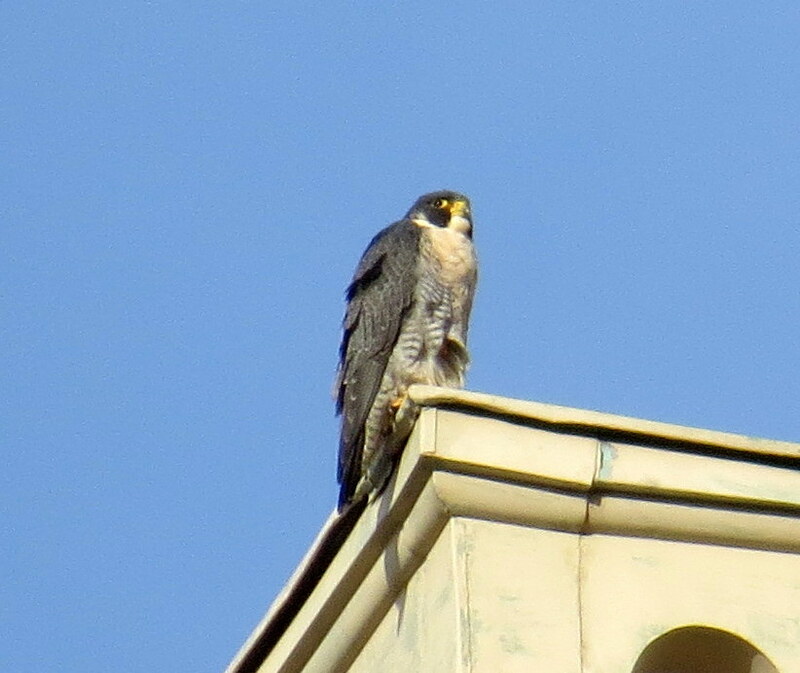 When she didn’t, I found a spot to check out St Ann’s which is southwest of the mall. 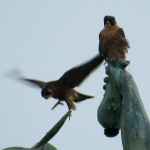 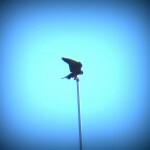 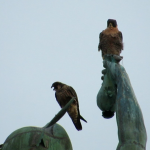 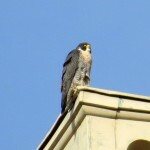 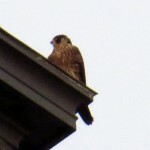 I saw a large bird on the north end of St Ann’s, but I couldn’t tell if it was a falcon or not. 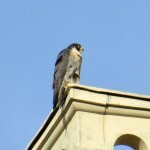 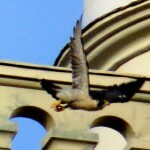 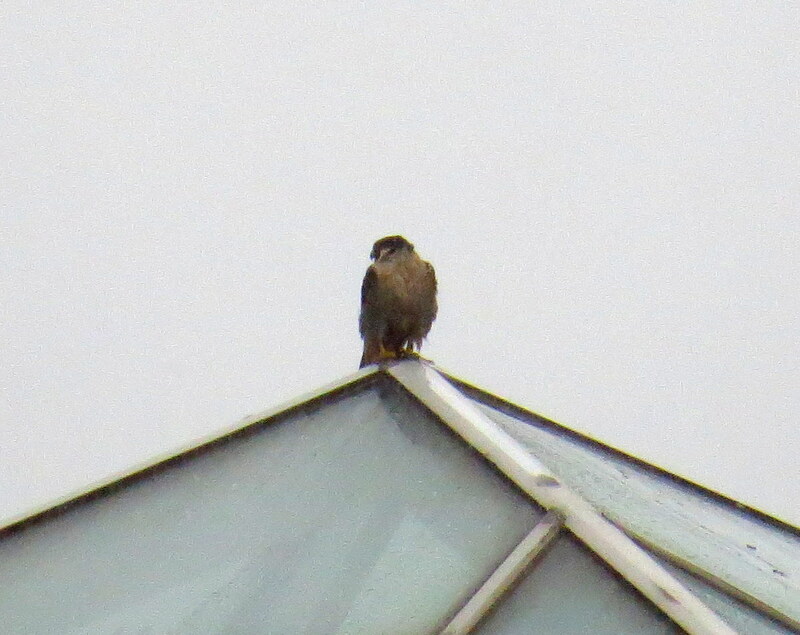 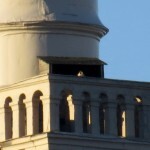 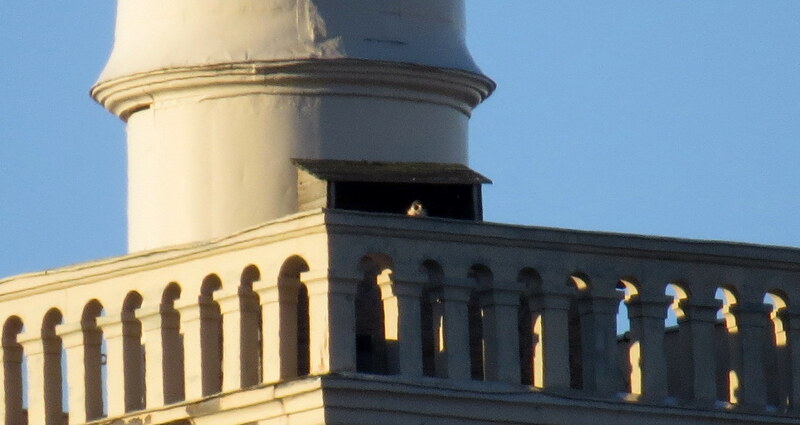 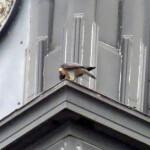 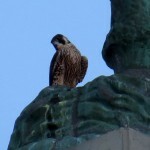 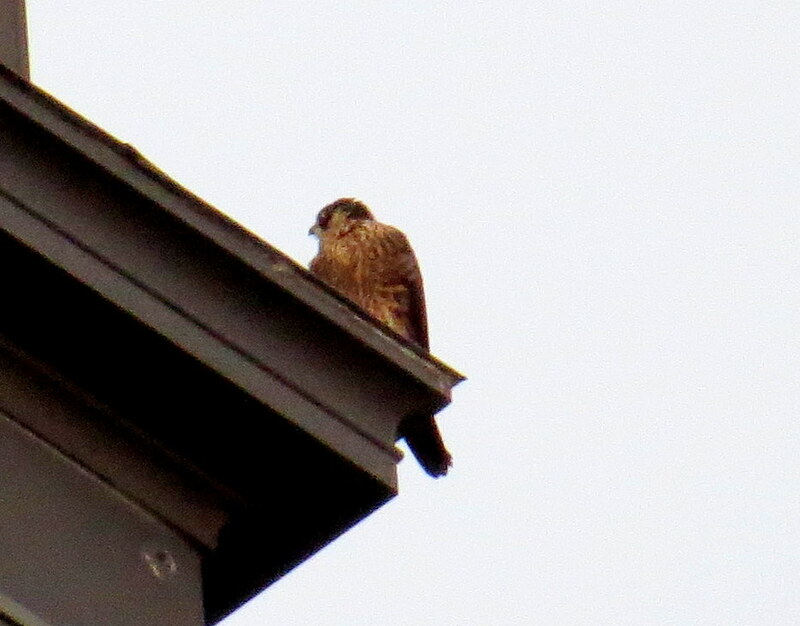 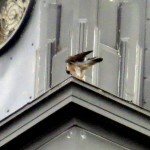 I headed over to St Ann’s to verify that it was a falcon. 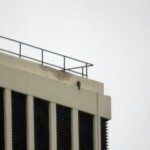 Yep, Big Frank(ie) was on the northeast corner of the building. 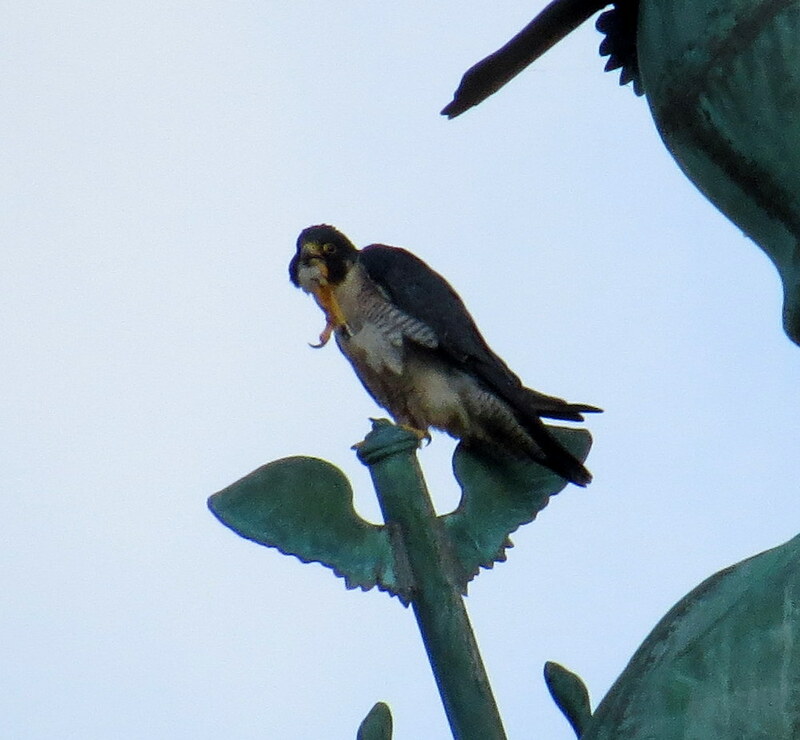 She was watching the pigeons fly around her. 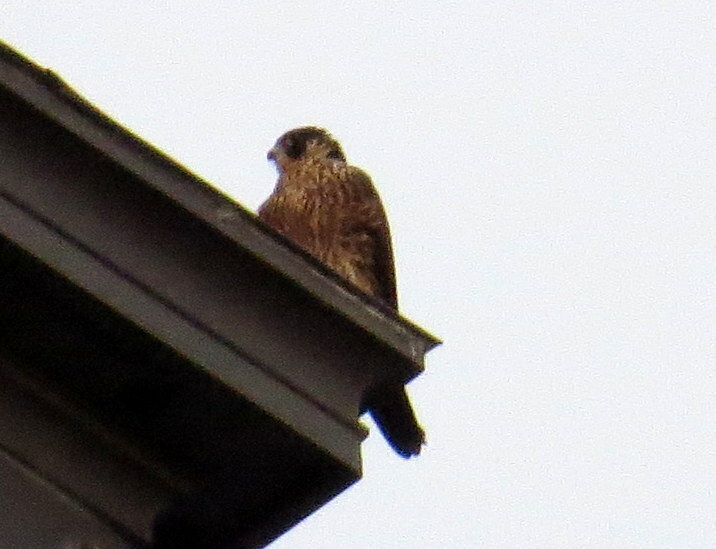 I stayed for awhile watching her, then had to leave her to her hunt. 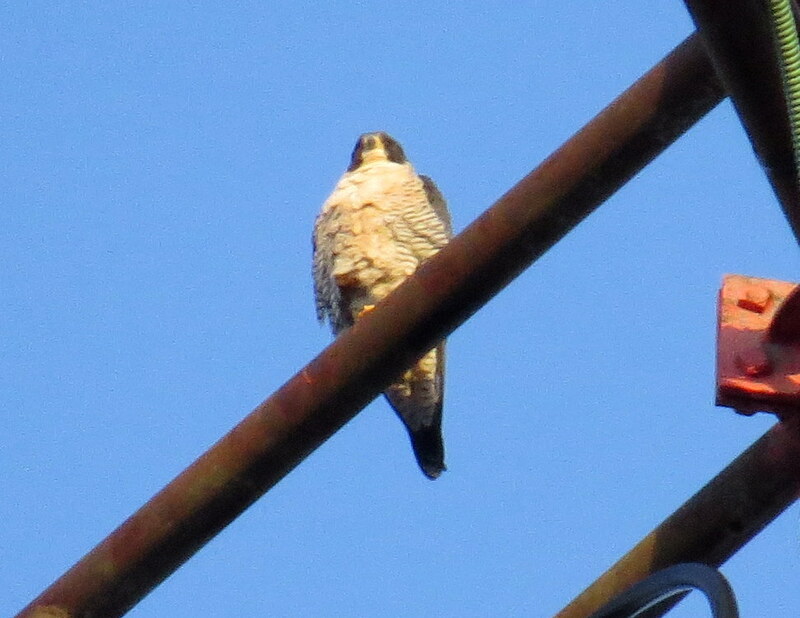 I couldn’t see what had her attention, so I drove back around to the east side. 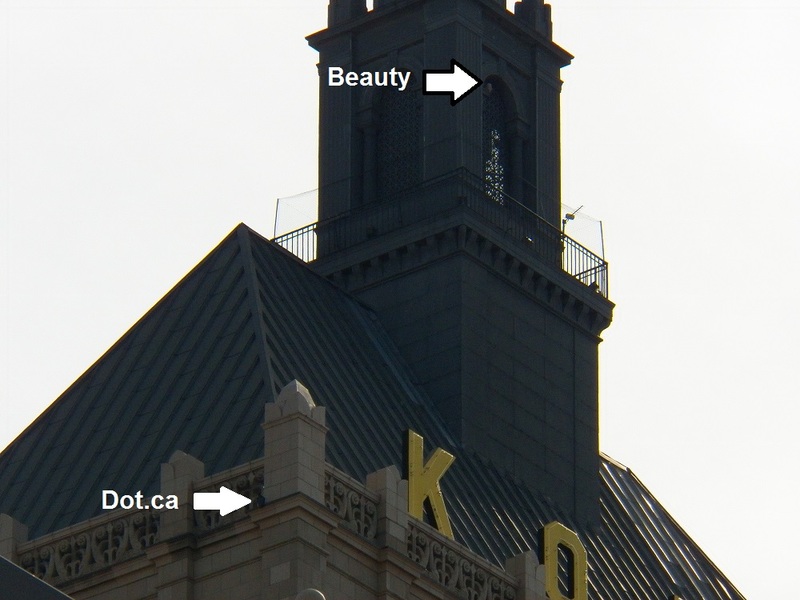 From there, I could see that Dot.ca had joined her on the Kodak Tower. 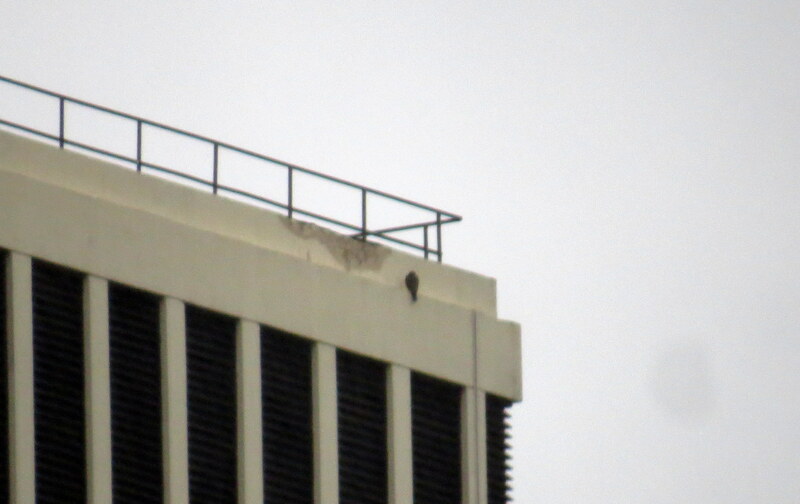 He was below her, on the east side of the 20th floor, near the northeast corner. 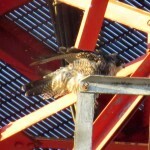 After awhile, I left them to check on Big Frank(ie) at the Medley Ctr. 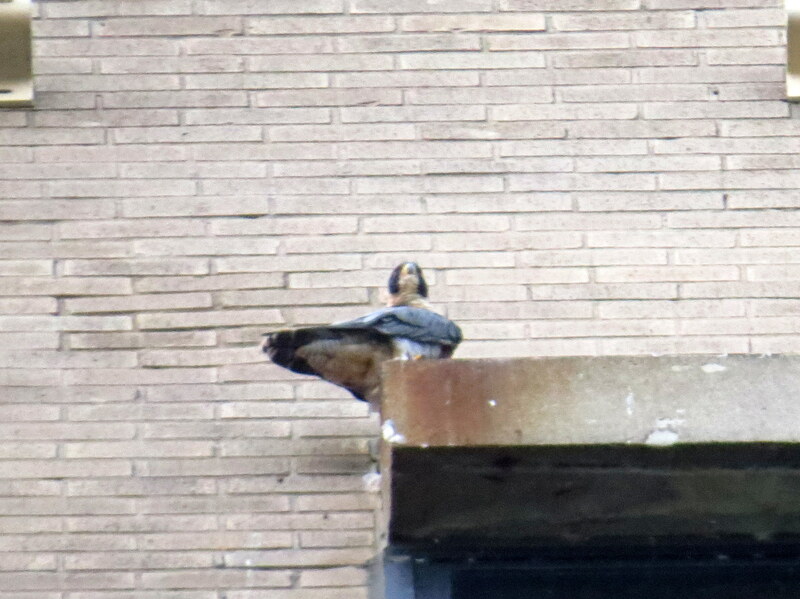 She had been seen earlier by Dana and MAK with an unbanded male. 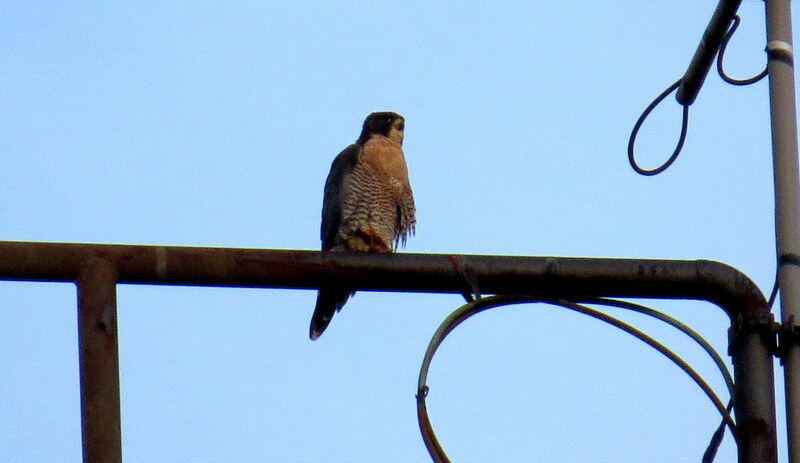 I hoped to see both of them, but had no luck finding them. 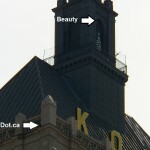 I’ll leave you with a few pics I took of Beauty and Dot.ca on the Kodak Tower. 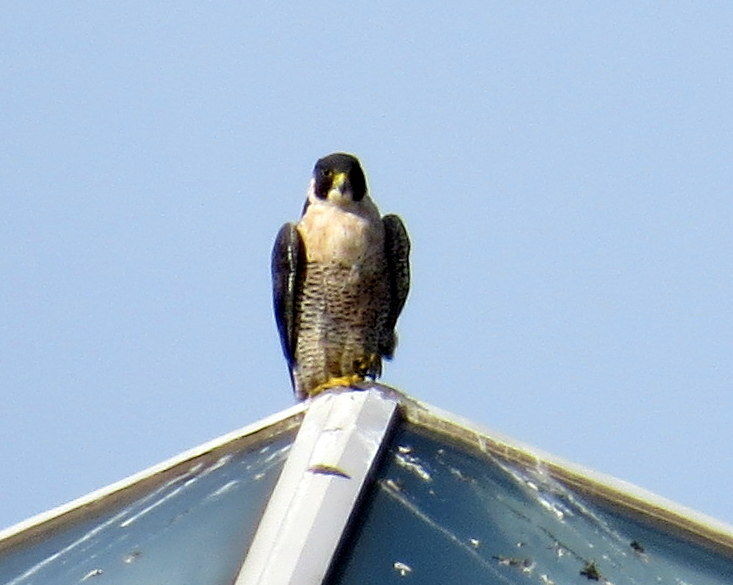 Old faithful, Seth, was in his spot on the north top window ledge of Seneca Towers as I began my watch this morning at 7am. 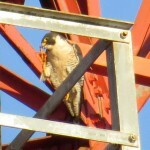 I left him and drove around to my spot on Seth Green Dr. where I found Billie eating on the northwest corner and Seth on the west railing. 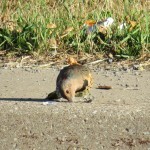 Seth left while I was tweeting and I decided to go back to the north end to get closer to Buffalo Billie. 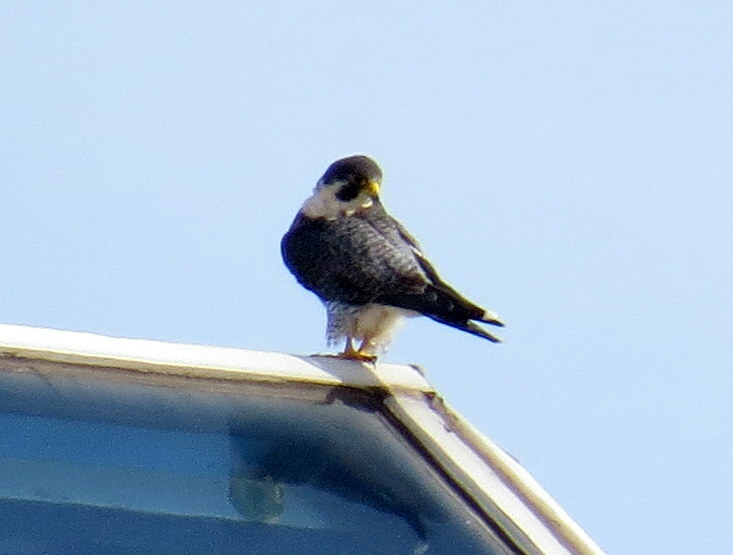 When I got there Seth was back in his spot on the window ledge. 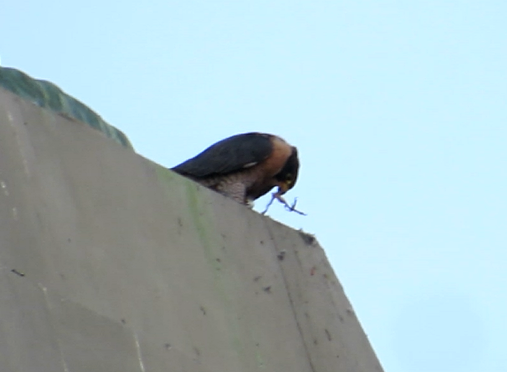 Billie finished eating then did some feaking as she went around in circles. 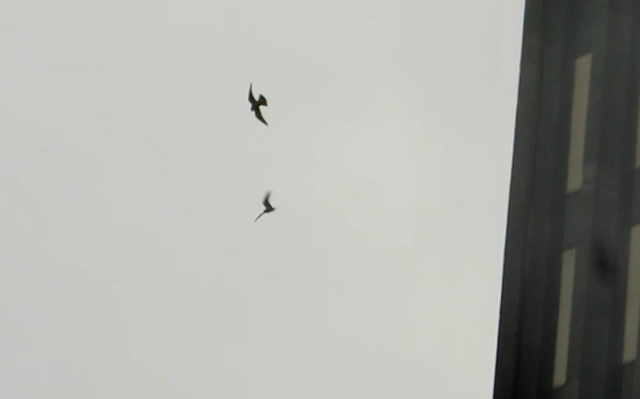 I left them a couple minutes later. 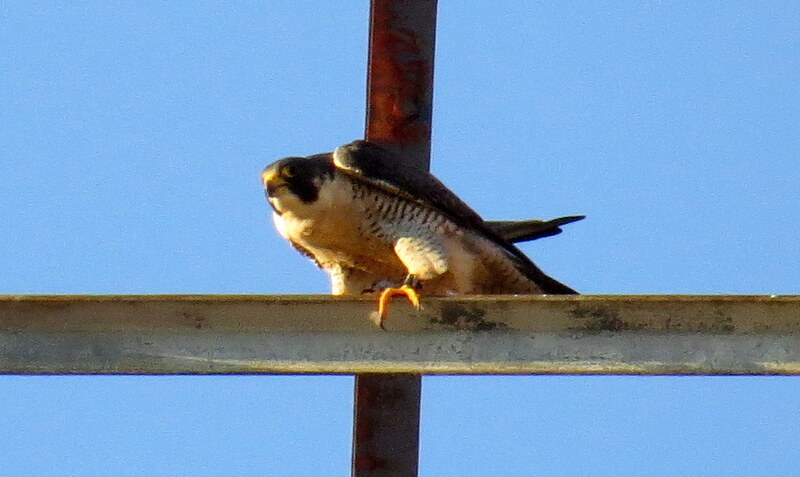 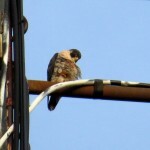 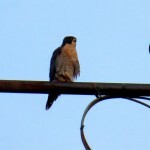 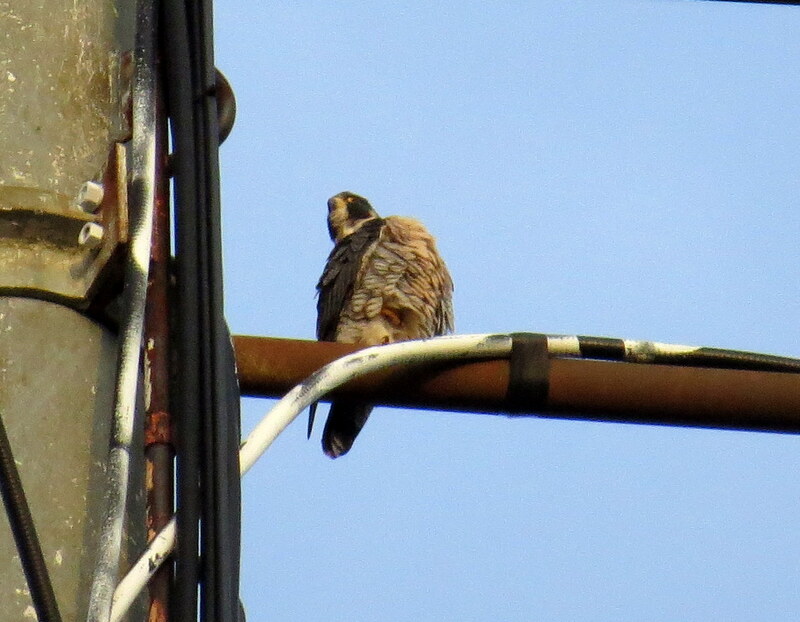 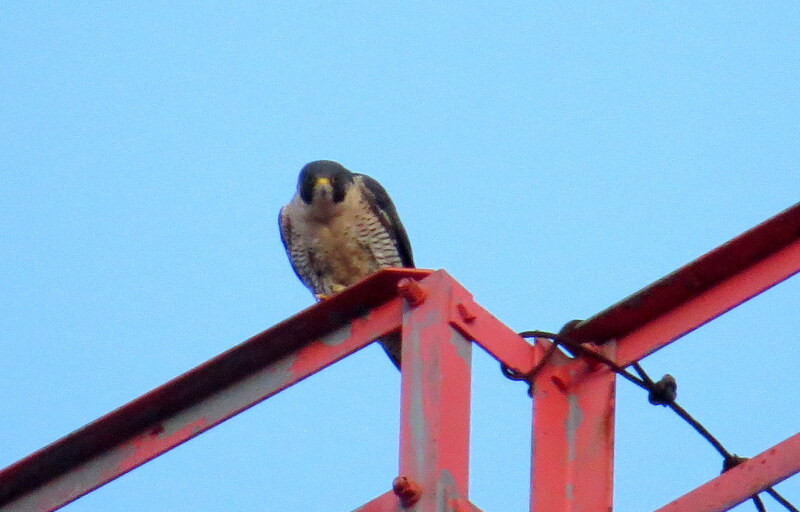 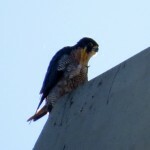 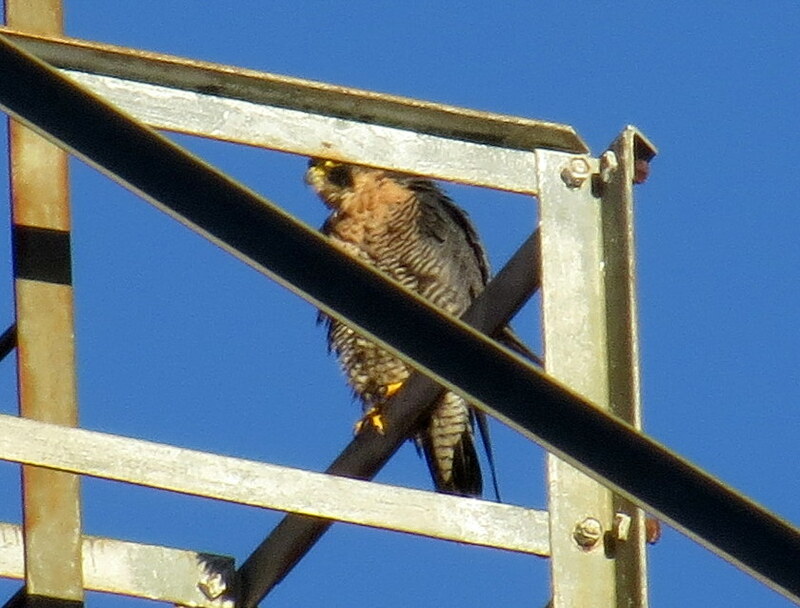 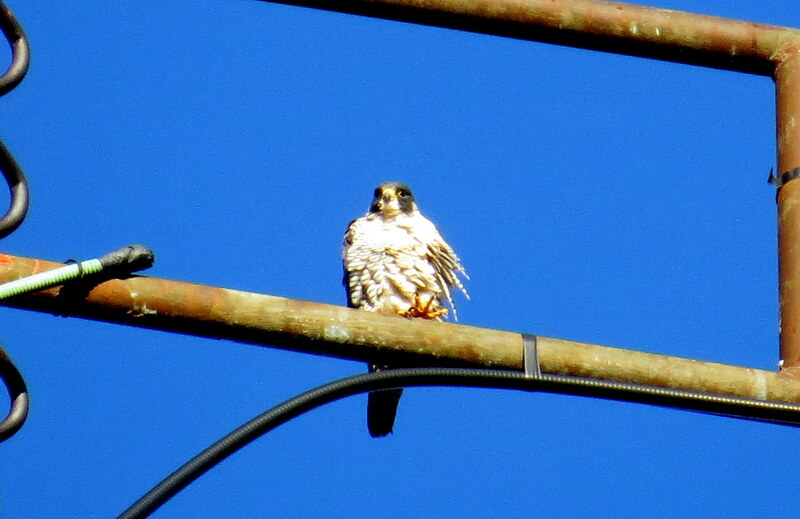 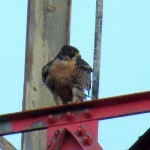 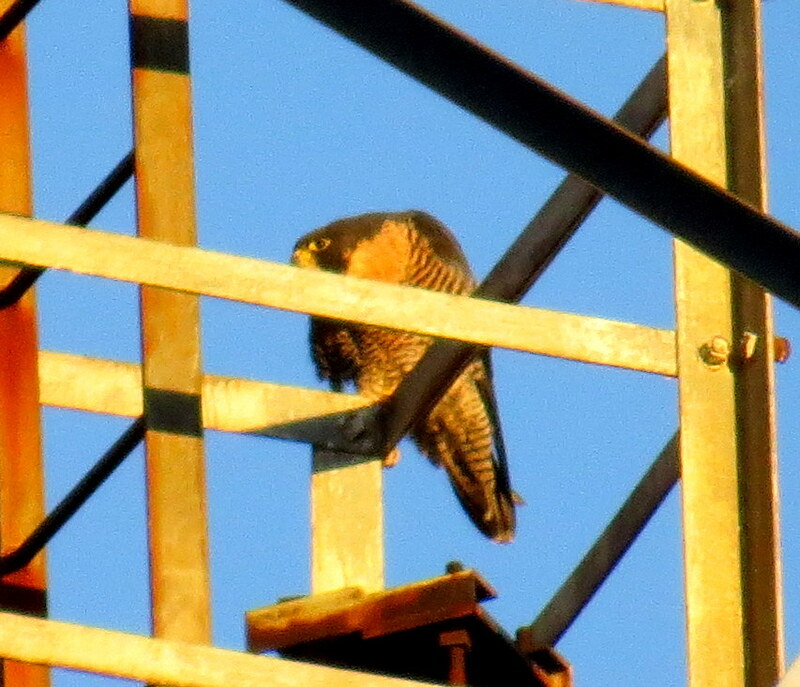 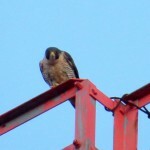 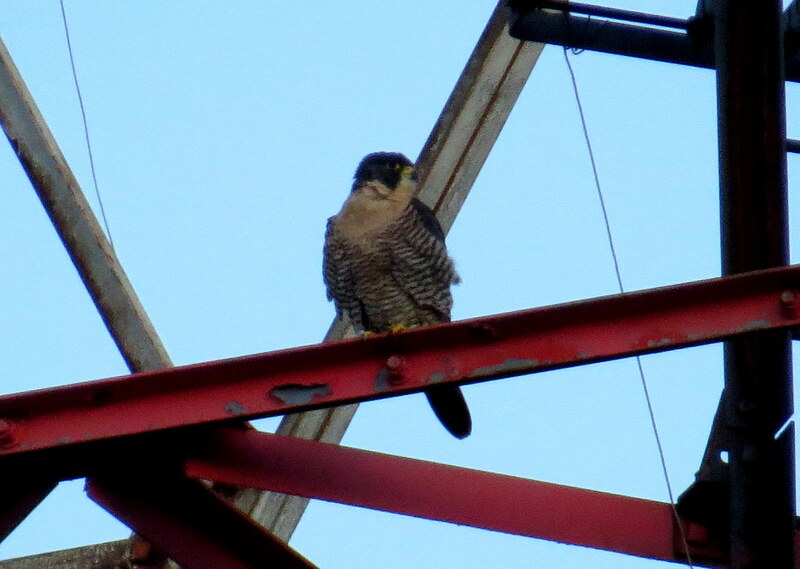 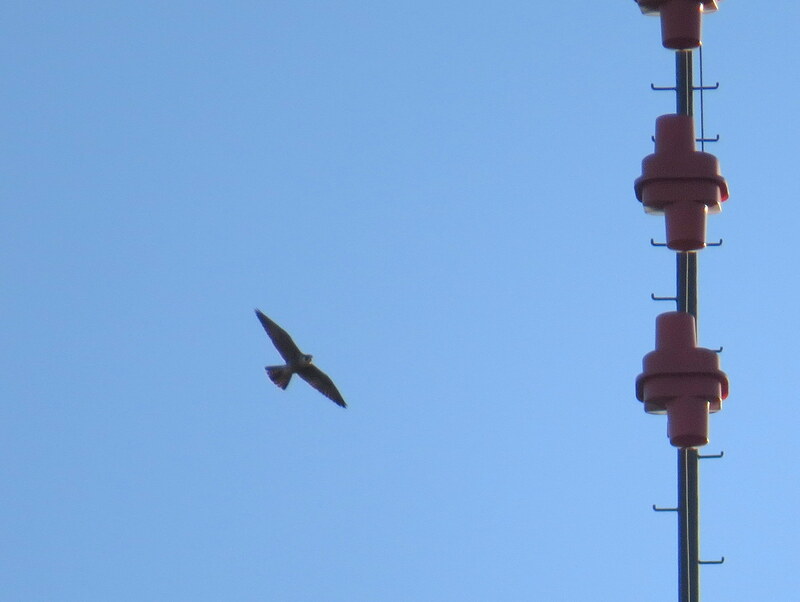 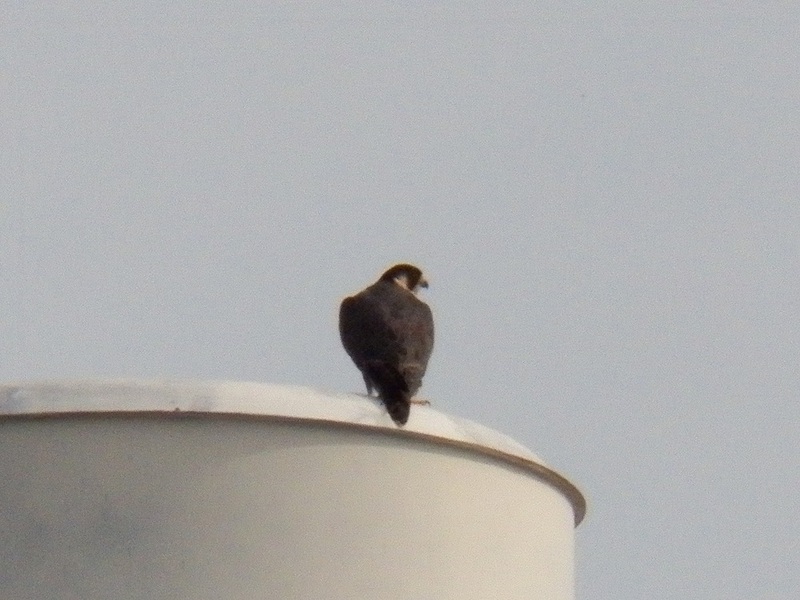 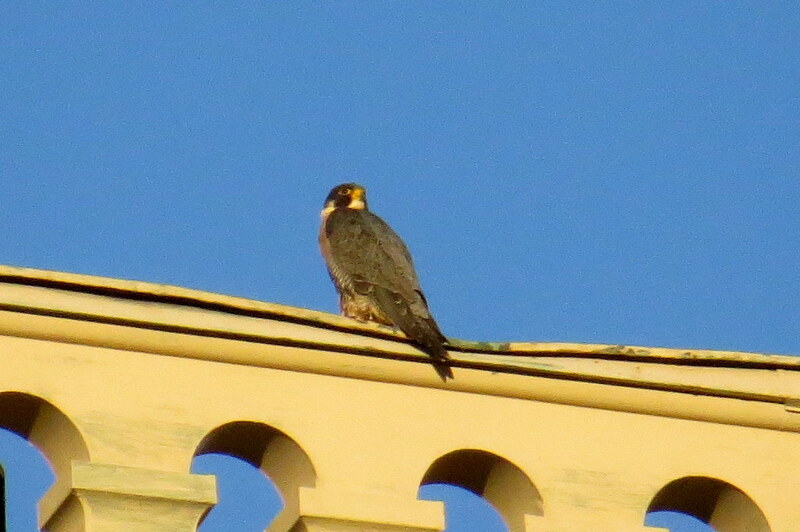 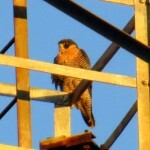 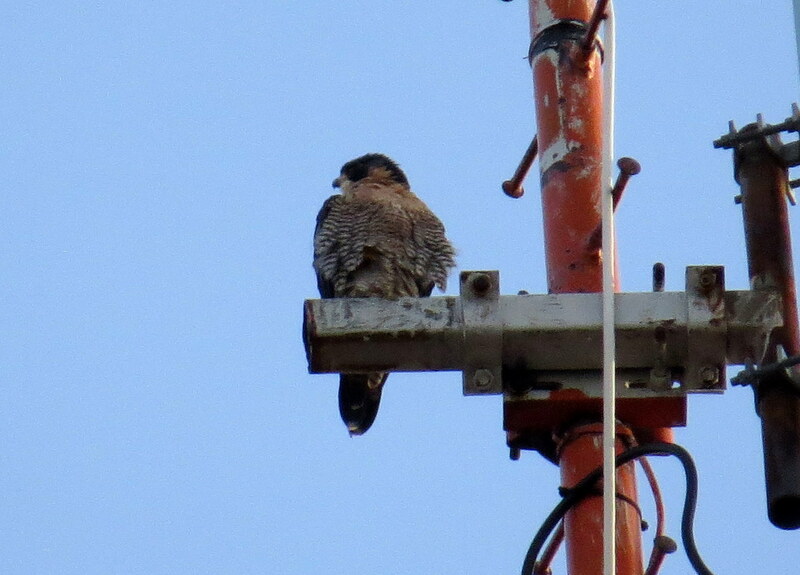 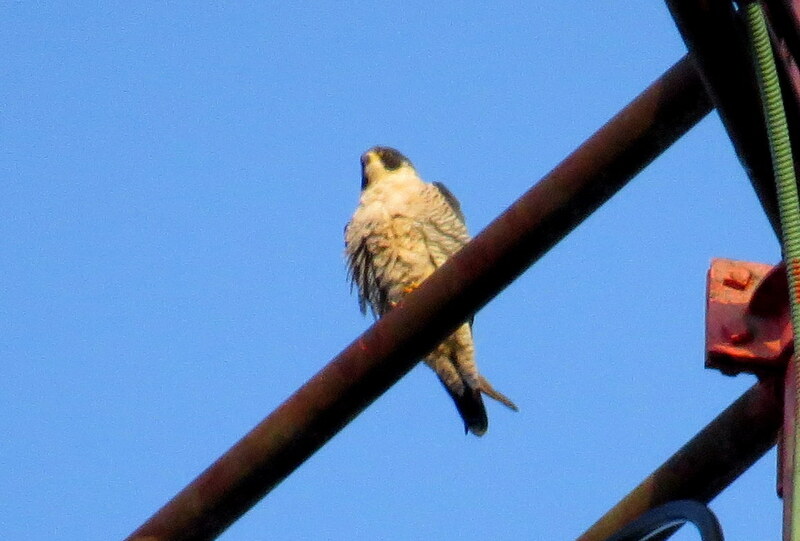 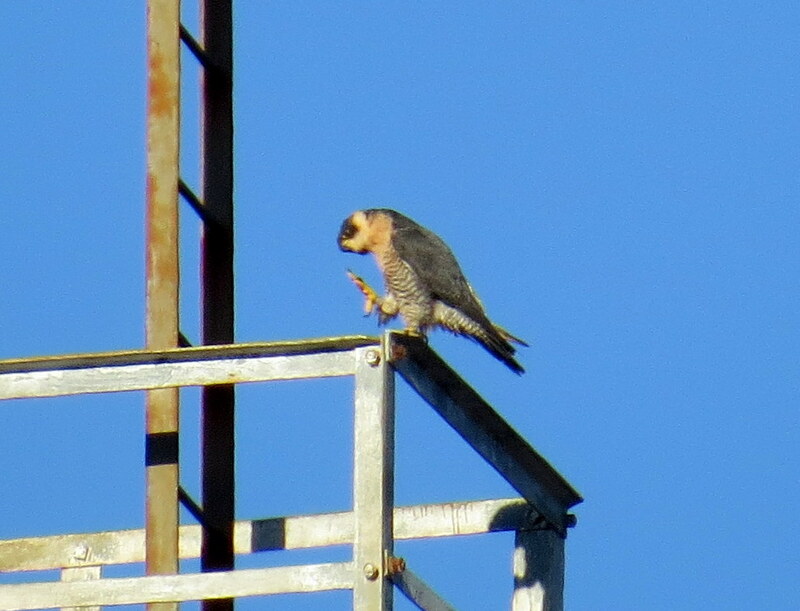 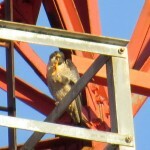 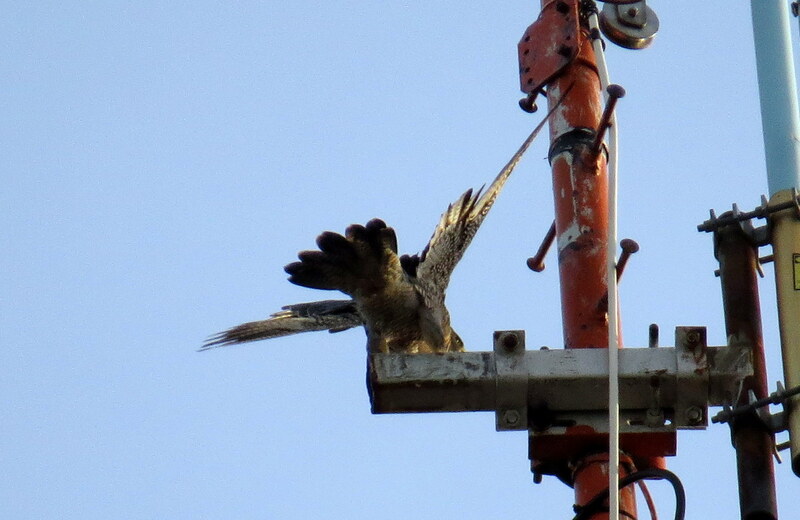 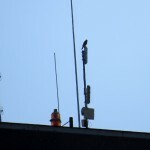 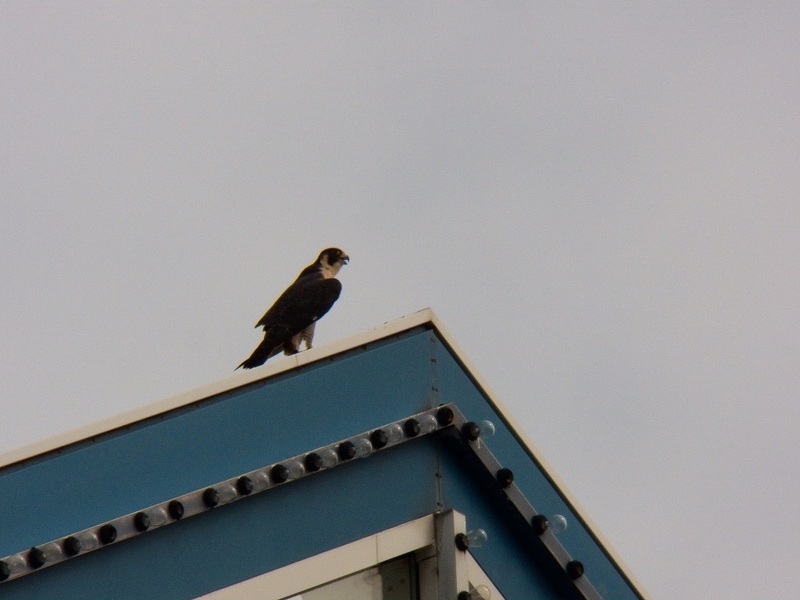 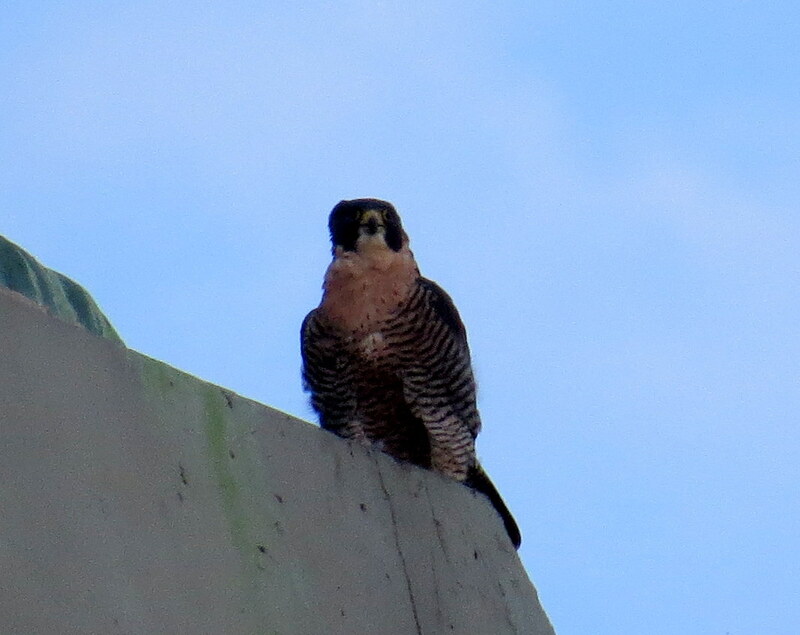 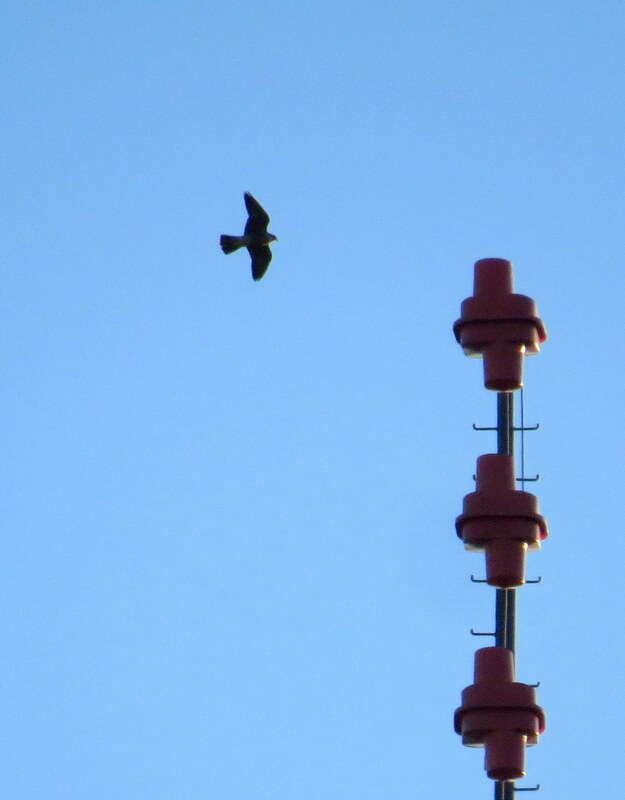 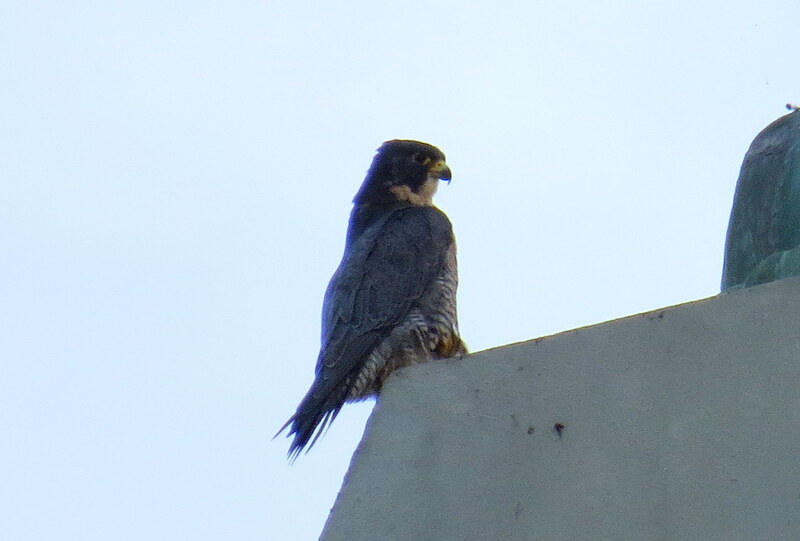 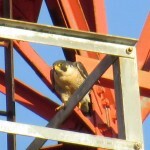 At first I didn’t find a PEFA (Peregrine Falcon) but after a trip around town I spotted Dot.ca (DC) on the middle arm of the Frontier Communications tower (FCT) while pulled over on the Broad St. bridge (BSB). 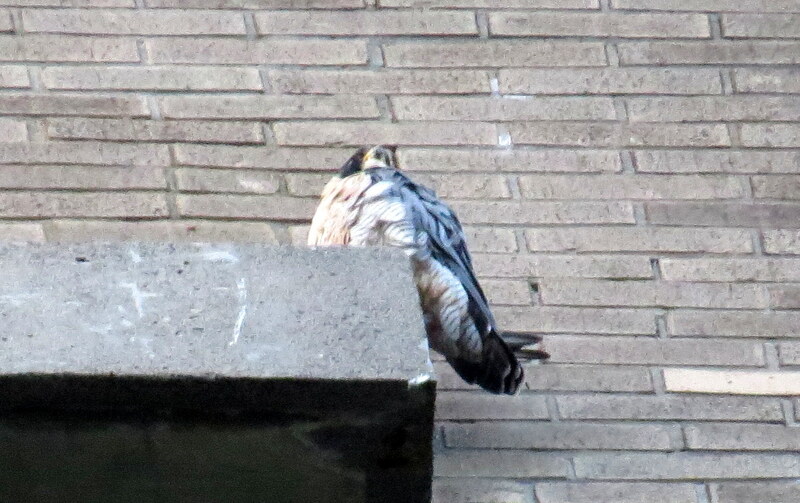 I went over to Fitzhugh St. to observe him. 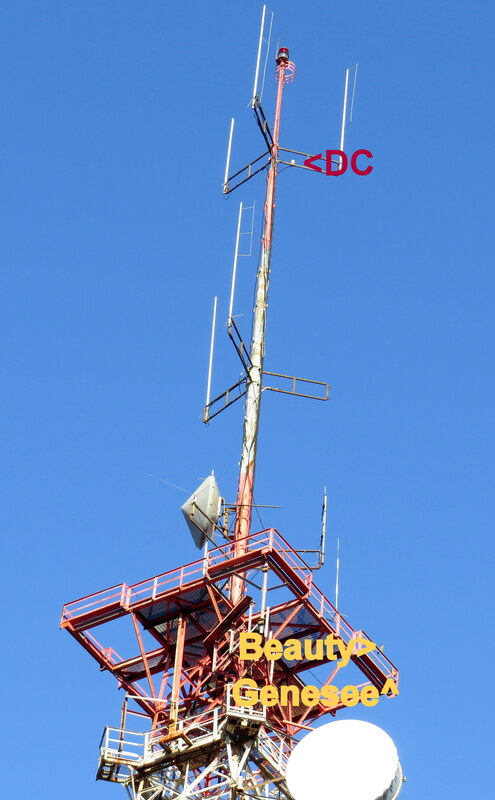 DC was just leisurely hanging out up there when I got a phone call from Larry. 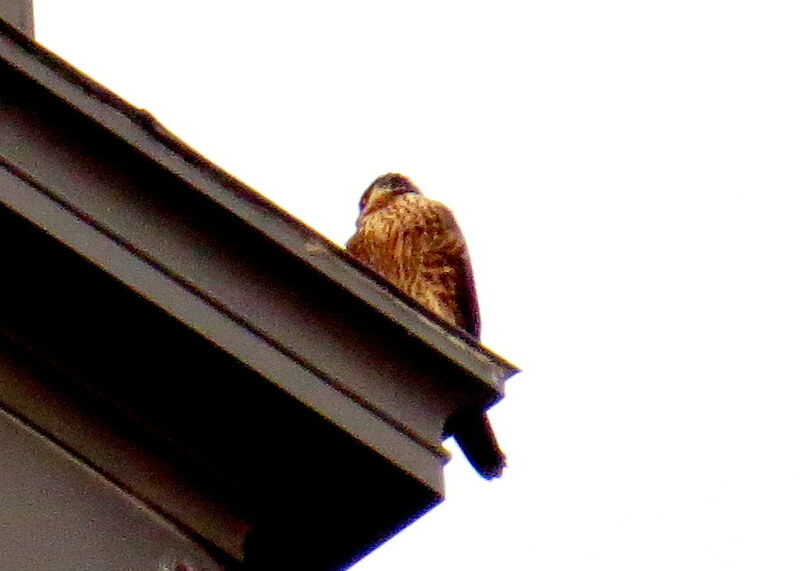 He said he was passing thru and noticed 2 falcons flying over by HSBC on the east side so I wrapped it up with DC and headed over not knowing if there was an intruder or a juvie and probably Beauty. 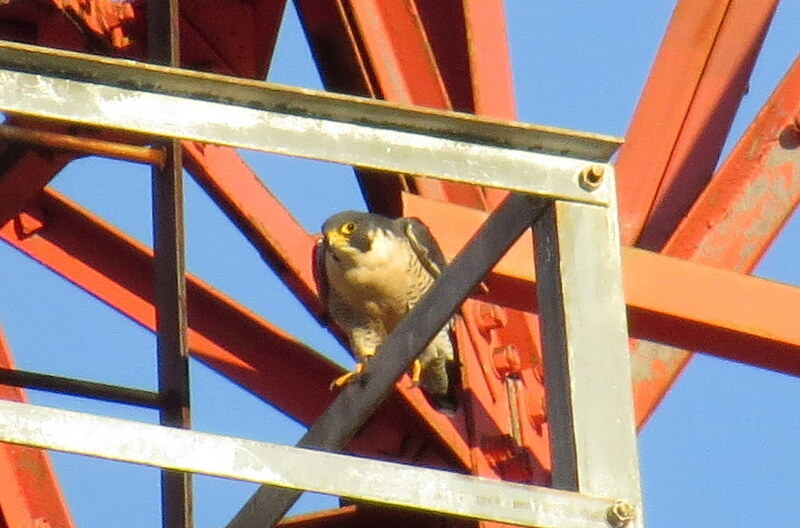 I found the Beautyful one on top of the RGS antenna-she took off soon after diving to the northeast at 8:01am. 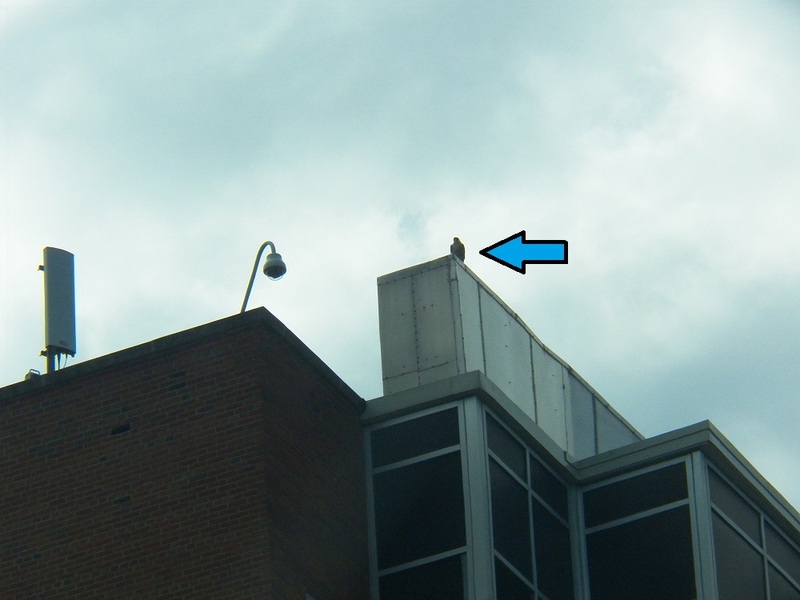 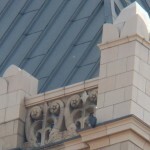 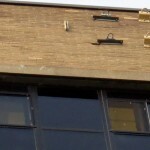 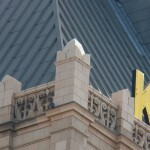 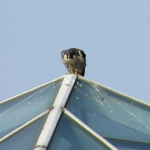 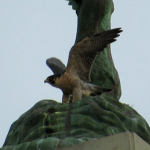 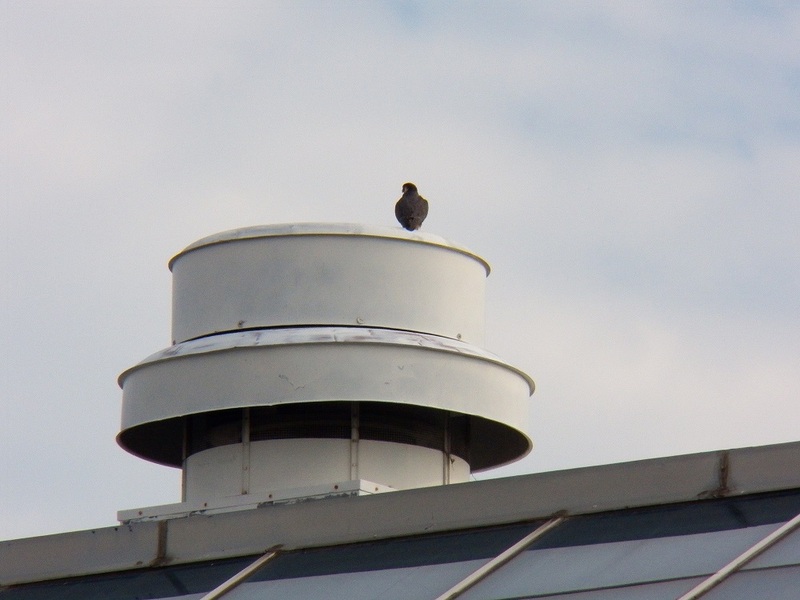 I drove around the area for the next 15 minutes when I spotted what looked like a falcon on a railing on the roof of the Eastman School of Music. 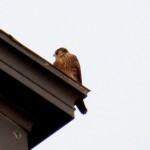 I had a hard time finding a good spot to get close enough to try and ID it. 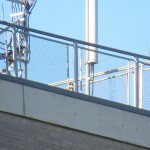 I ended up on Winthrop St. off East Main St. in a gated driveway. 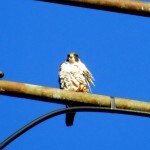 My pics made me think it was an American Kestrel but when I got home and checked on the computer screen I was sure that it was a Merlin which is in between a PEFA and kestrel in size. 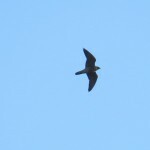 It took off very fast at 8:30am heading south and that was the last I saw of it. 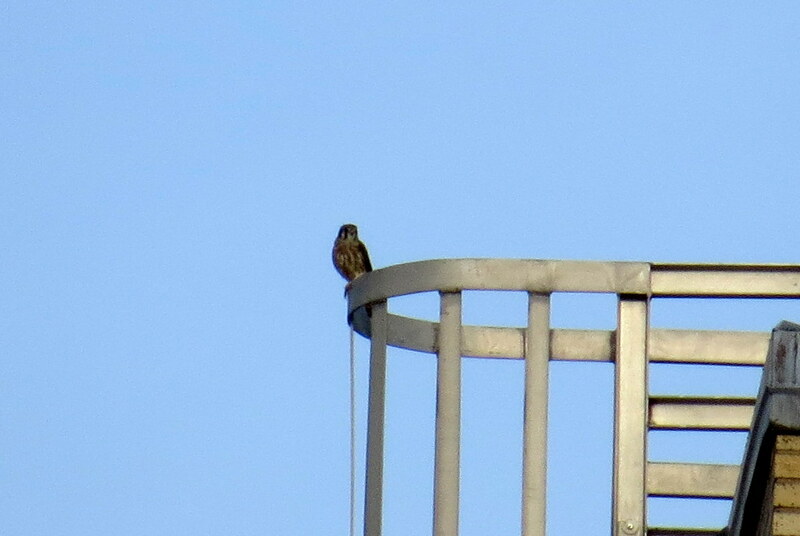 I’m thinking that perhaps Larry saw Beauty chasing this merlin for I never found any other falcons on the east side of the river. 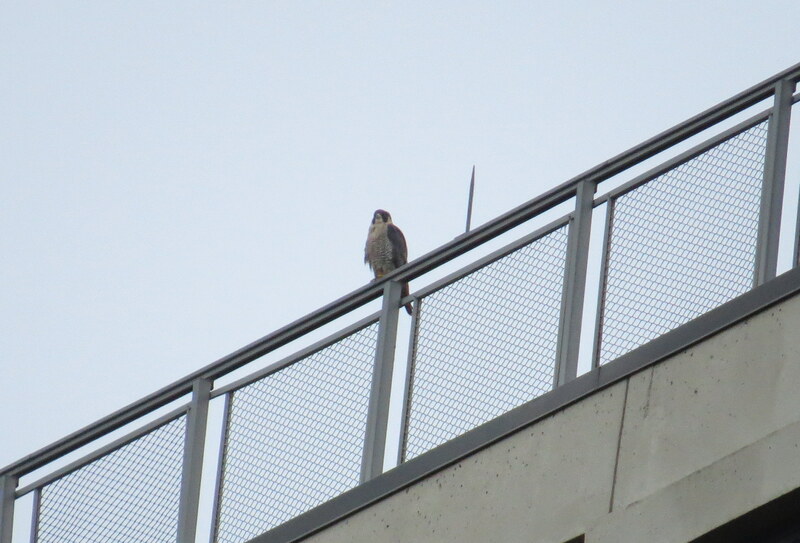 15 minutes later I spotted DC on the southeast corner top railing of the Powers building from the Court St. bridge. 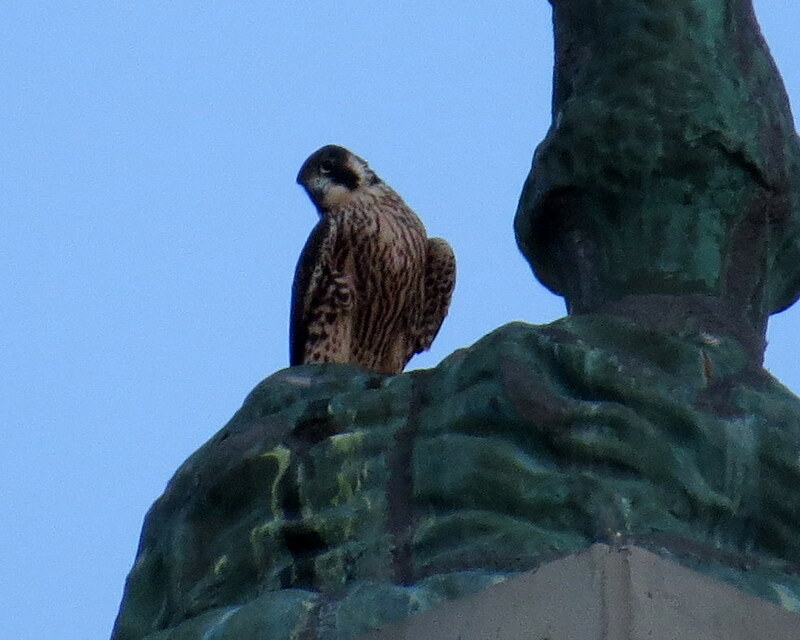 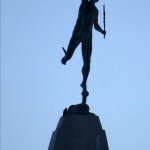 i drove to the end of Aqueduct St. at Main St. for the best view of him. 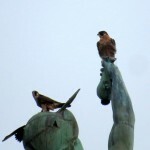 DC flew northeast at 8:49am and as I backed to the hole I saw Beauty on the base of Mercury. 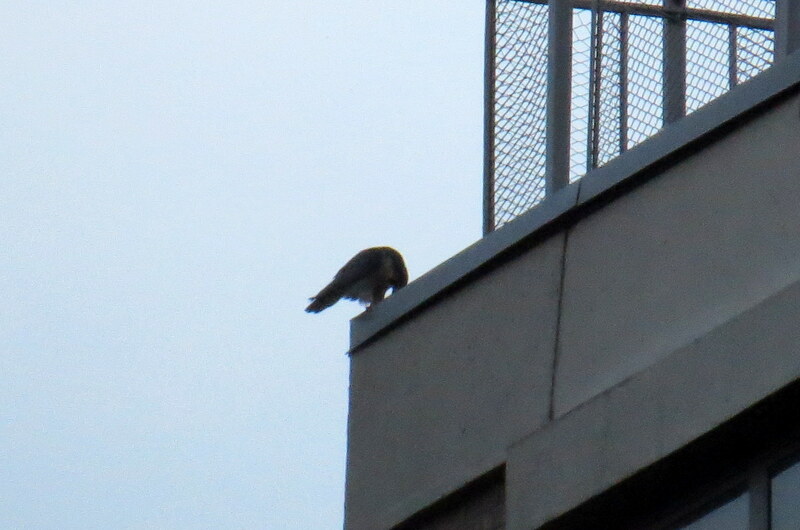 I then went around to the end of Bank Place and Aqueduct St. to watch. 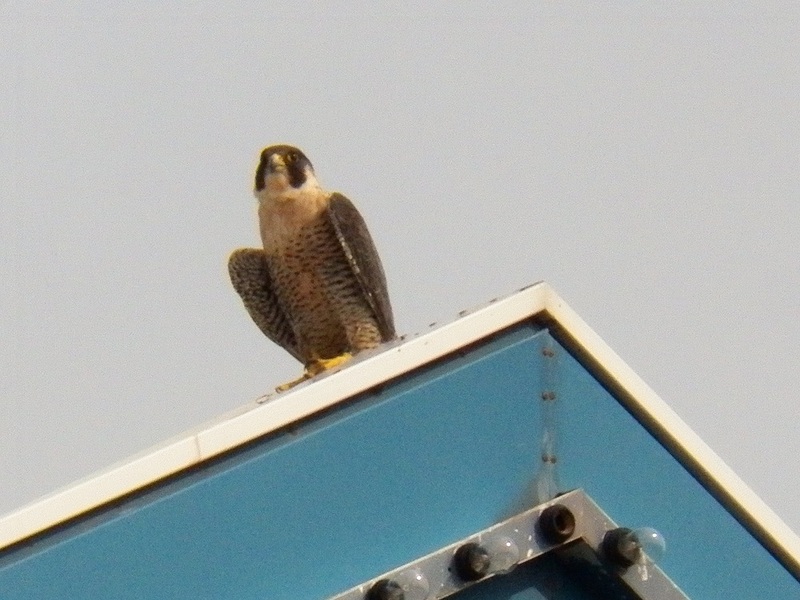 She was overlooking the near vicinity when I left to go to the Medley Centre in Irondequoit to see if Big Frank would show up for me. 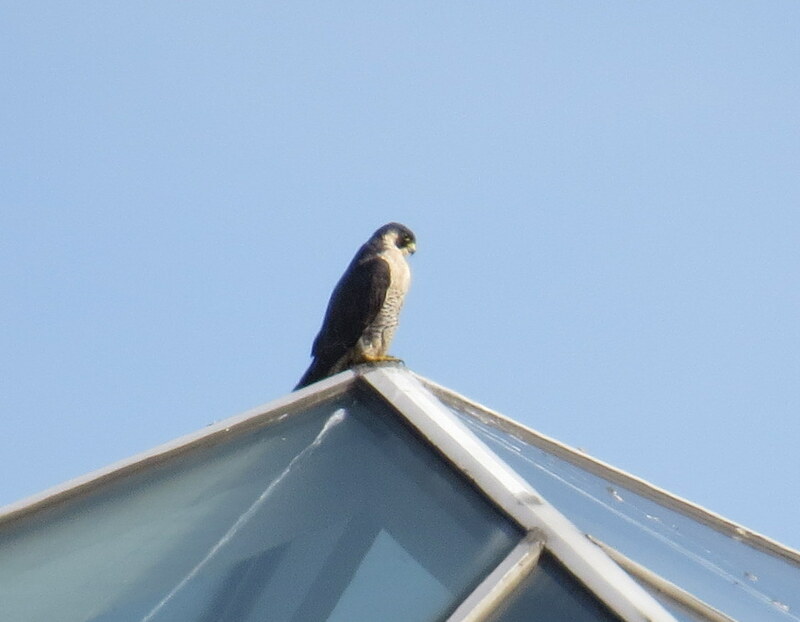 When I arrived around 9:45am Big Frank (BF) was on the pointed peak roof-I was on the south side of the mall when I found her. 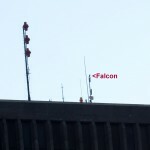 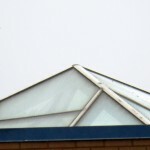 I checked my phone and saw a tweet from Dana saying there was another adult falcon on a lower roof which I couldn’t see from where I was, so I circled the mall. I ended up back on the south side and found a spot where I could see an unbanded male just to the west of where BF was on the peak. 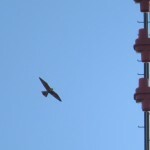 He took off while I was tweeting so I had no idea what direction he went. 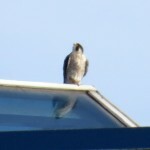 I then went to the east side of the mall to look around and pulled over next to Dana who said the male had flown east. 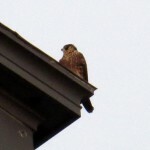 This was a much better place to see BF and shortly after I arrived she got buzzed by a Coopers Hawk. 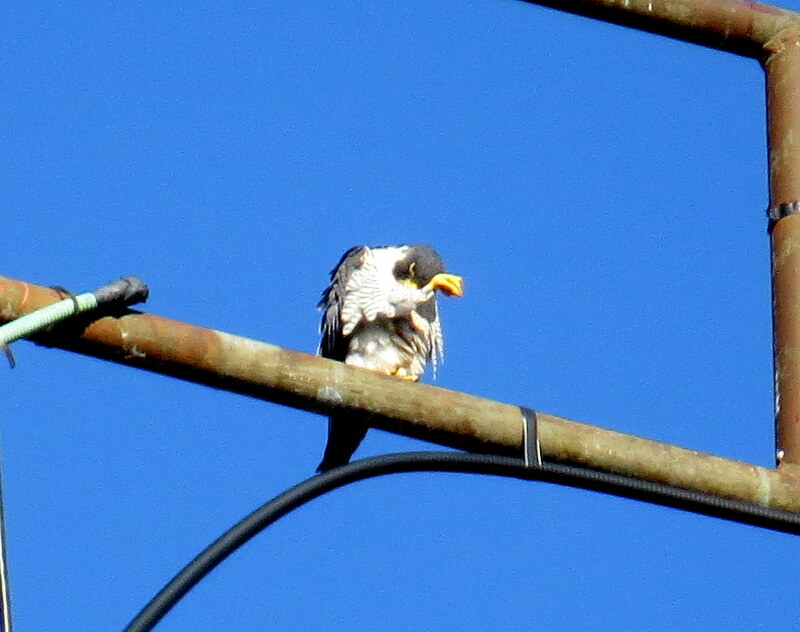 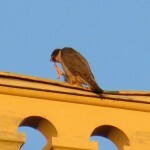 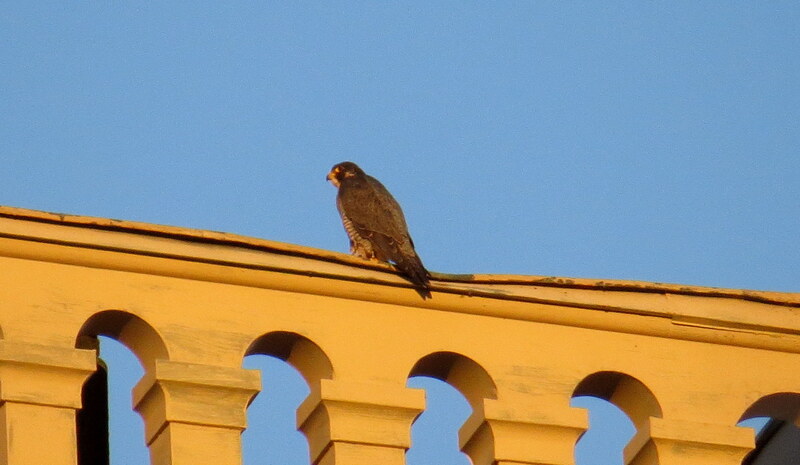 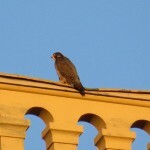 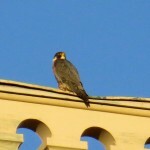 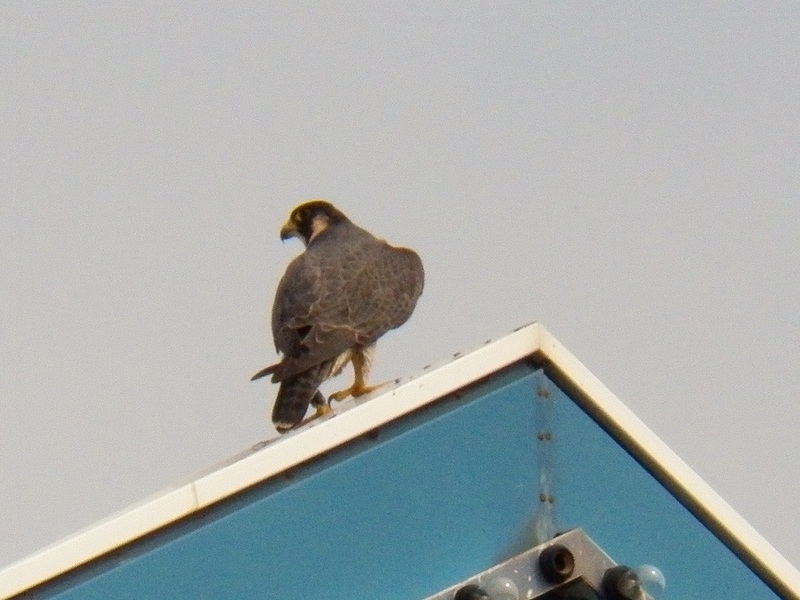 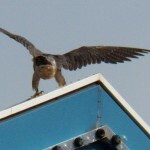 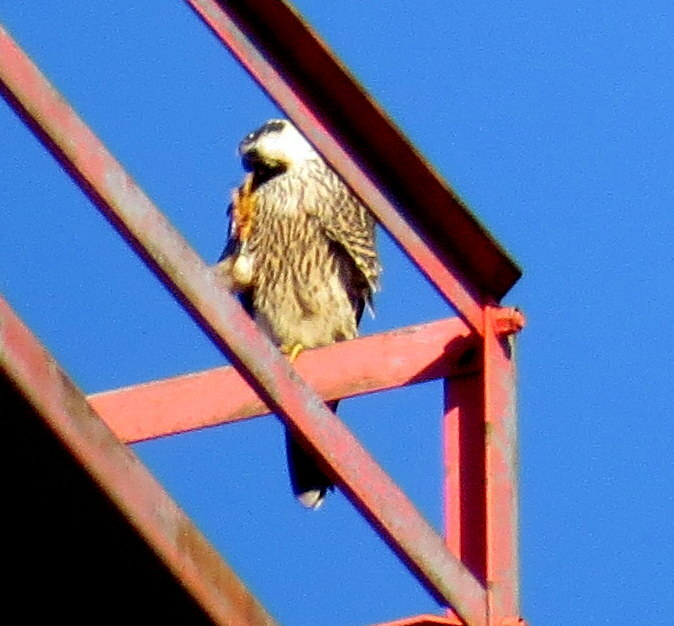 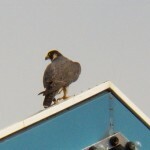 We thought at first that it was the unanded male falcon because we heard e-chupping. 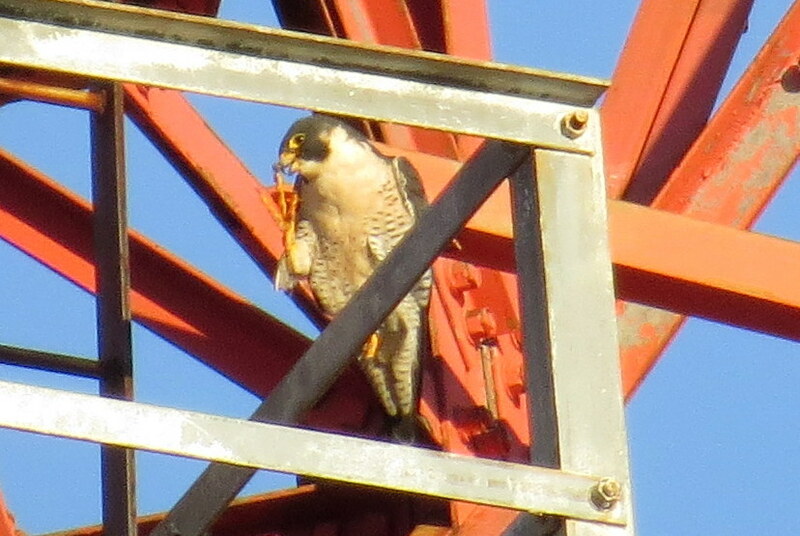 A few minutes later at 10:13am BF flew east out of view and didn’t return. 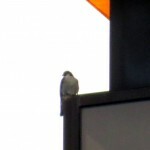 Dana said she would take a ride around the mall for one last check and I headed home. 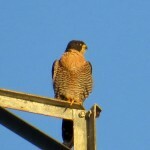 What a great watch I had in which I saw 7 falcons-Billie,Seth,Beauty,DC,a Merlin,Big Frank and an unbanded adult. 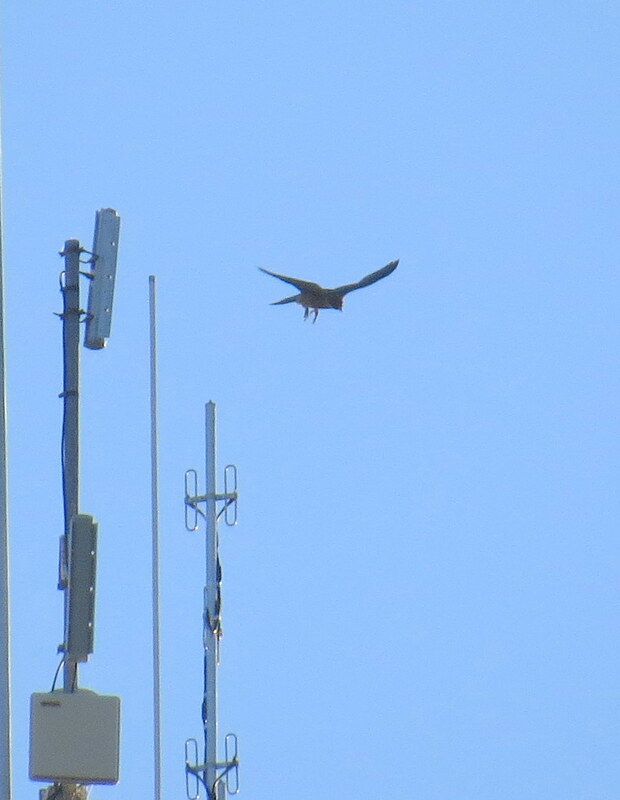 And I’m sure y’all know this produced a huge smile on this watchers face! 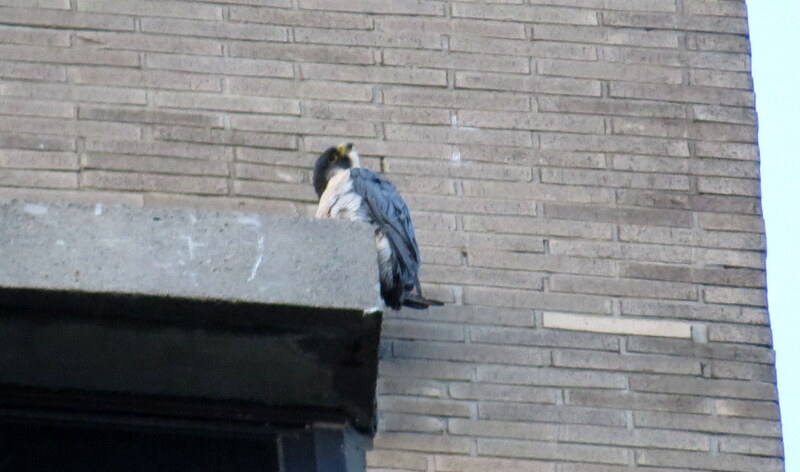 This morning I found Seth all by himself on the top window ledge north end on Seneca Towers. 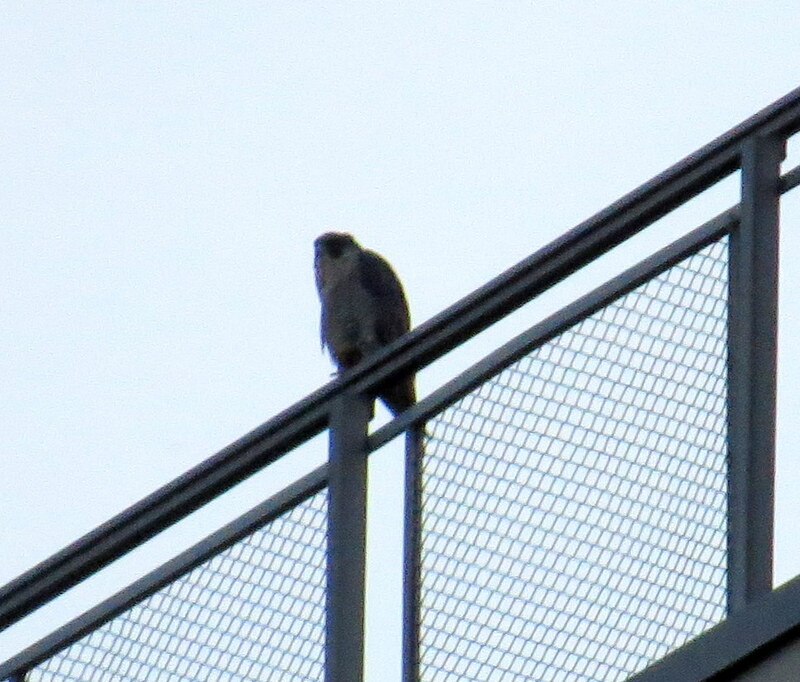 I found Billie out on the west side railing from Seth Green Dr. 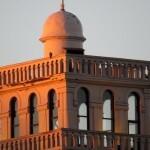 I stayed a few minutes then moved on to downtown. 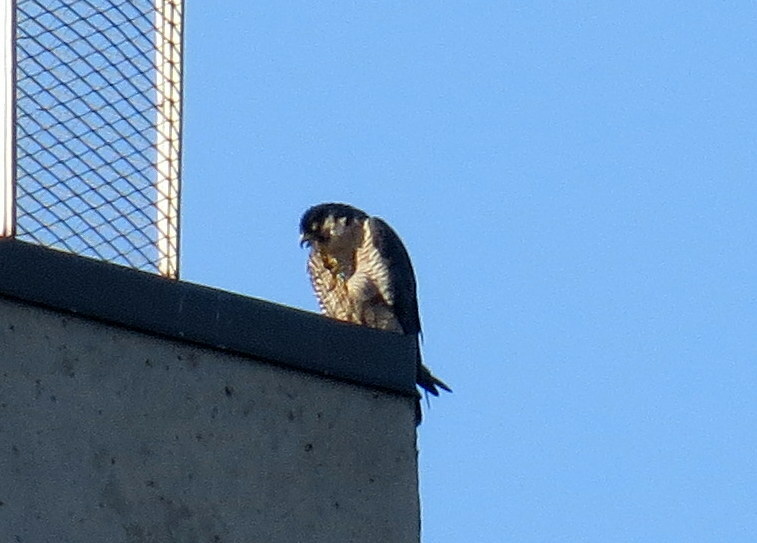 From the Andrews St. bridge (ASB) I spotted Beauty eating on the base of Mercury. 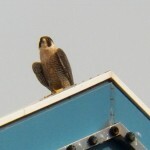 I drove to the Broad St. bridge (BSB) to share space with her. 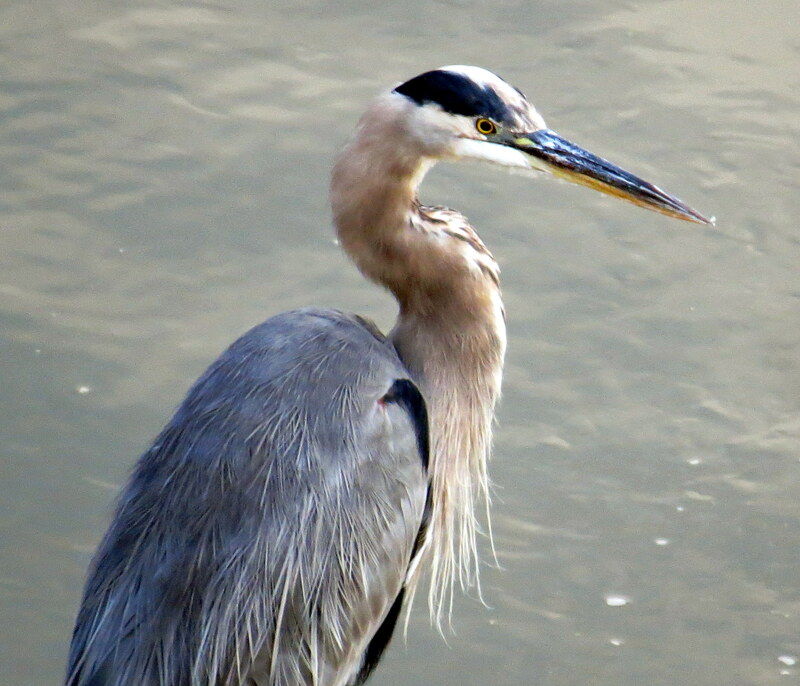 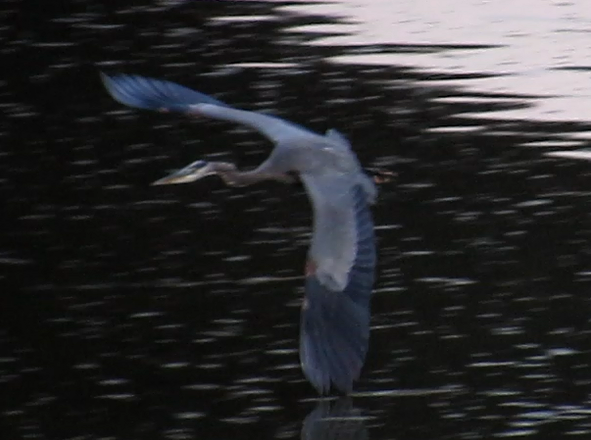 While I was taping a video I noticed a Great Blue Heron (GBH) down in the river. 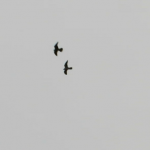 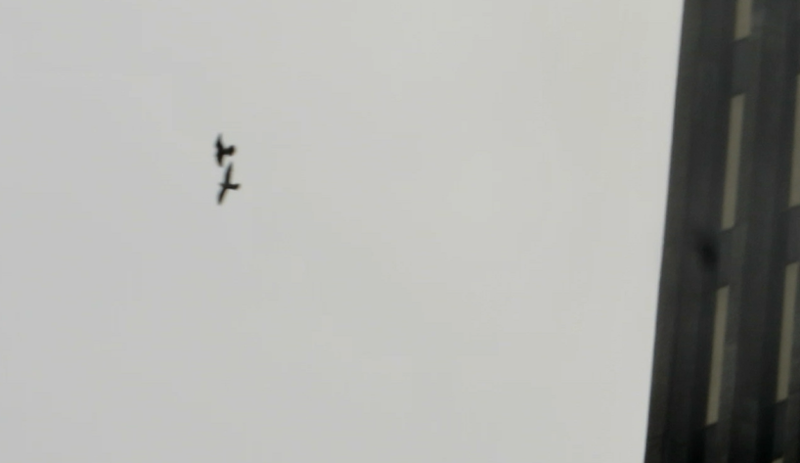 I got some snippets of it flying off after another GBH that came flying in from the north. 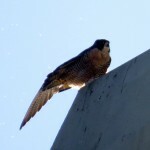 It made a U-turn and flew over the bridge real low and close to the railing near Thomson Reuters. 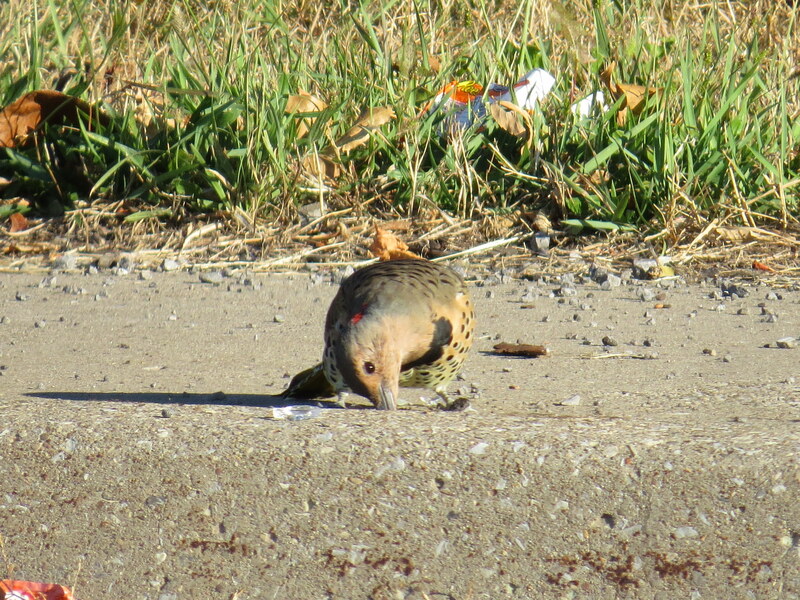 Good thing a bus or big truck weren’t going by or it would have been hit. 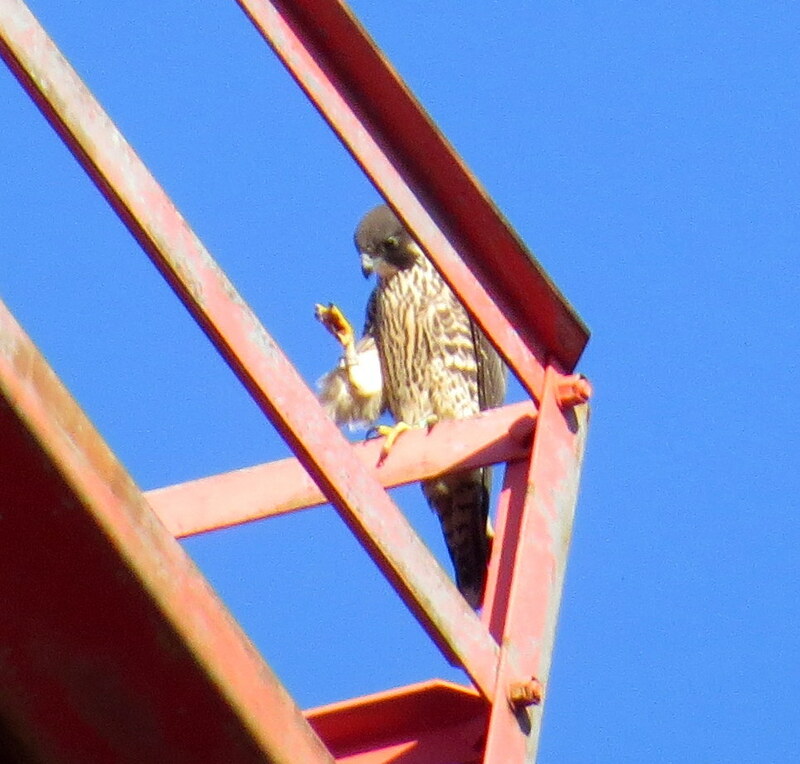 Meanwhile, Beauty finished eating did some feaking and cleaning up. 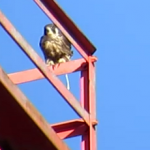 She pooped, roused then turned around and flew northwest. 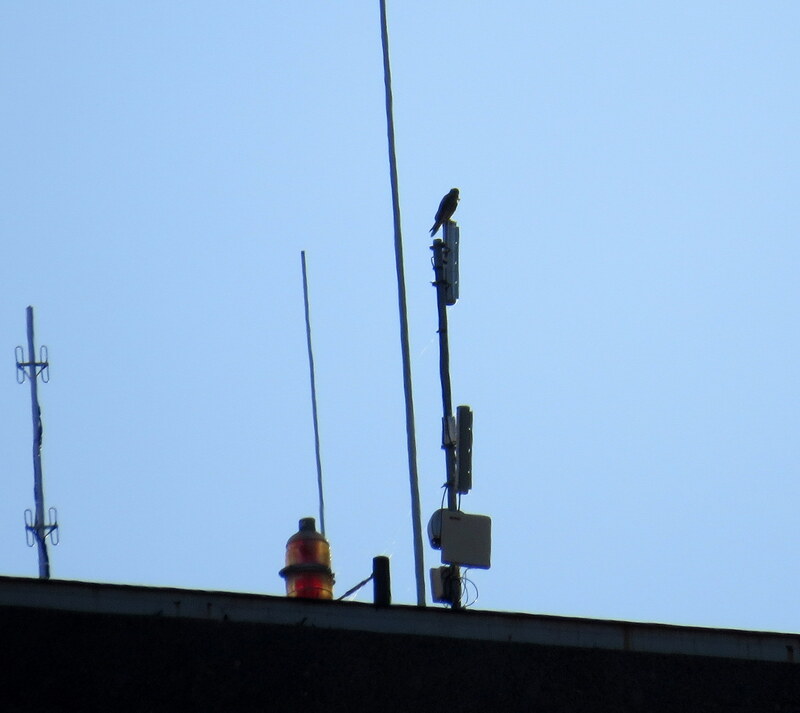 I guessed she was going over to the Frontier Communications Tower (FCT) so I left and found her there on the bottom arm from Fitzhugh St. around 7:30am. 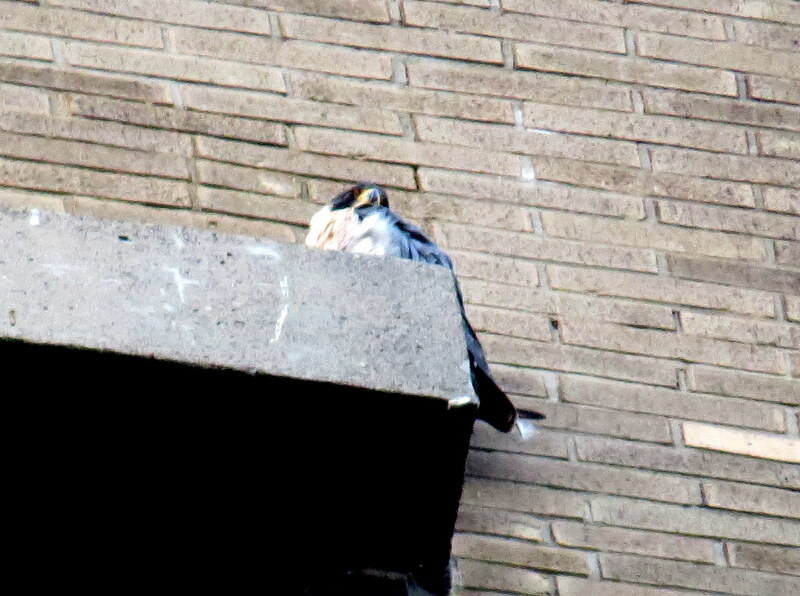 While I was taping the Beautyful one she went down in the posture when an approaching falcon is coming and sure enough Dot.ca (DC) flew to the south side platform railing then turned his back to me. 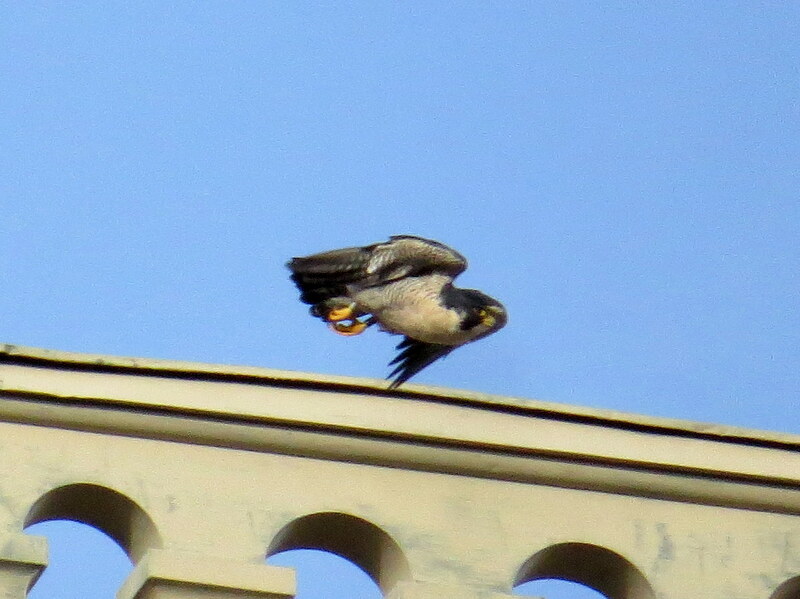 A few minutes later, DC quickly flew off real low to the east. 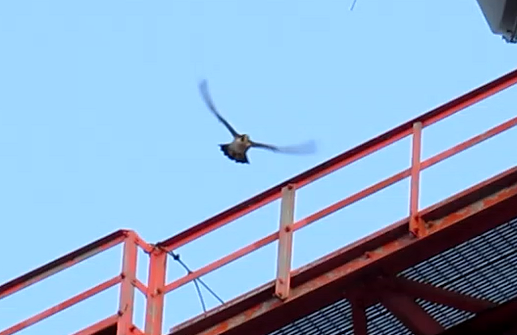 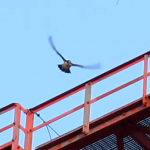 In my snippet video you can see him fly off past Beauty. 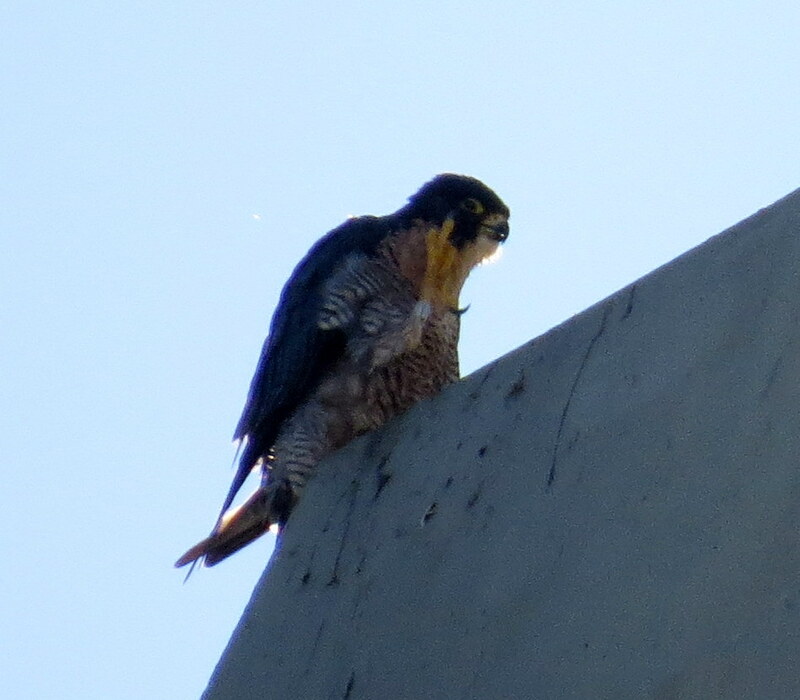 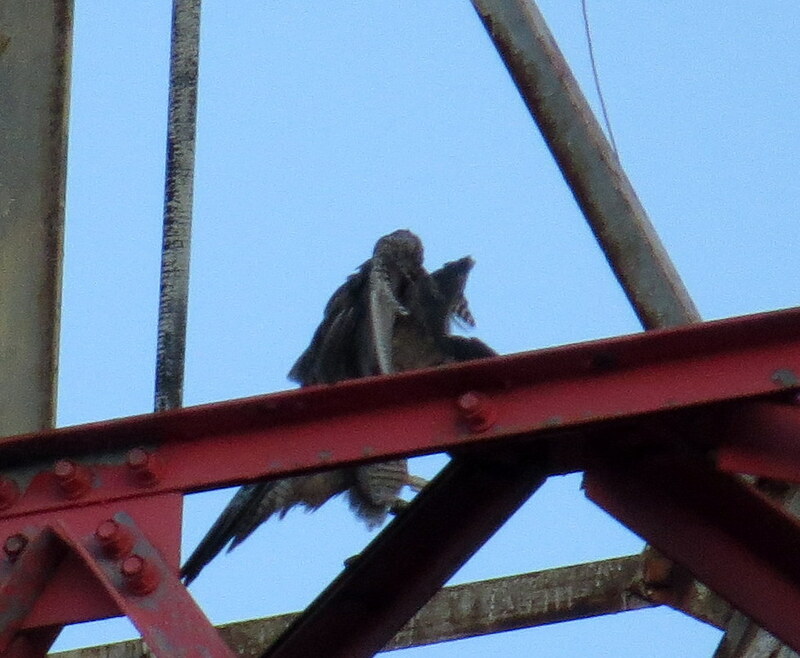 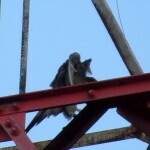 DC returned to FCT coming to rest on the top arm-he started preening and Beauty remained on the bottom arm. 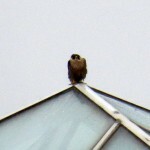 I left our downtown pair at 8am to check the Medley Centre mall in Irondequoit for Big Frank. 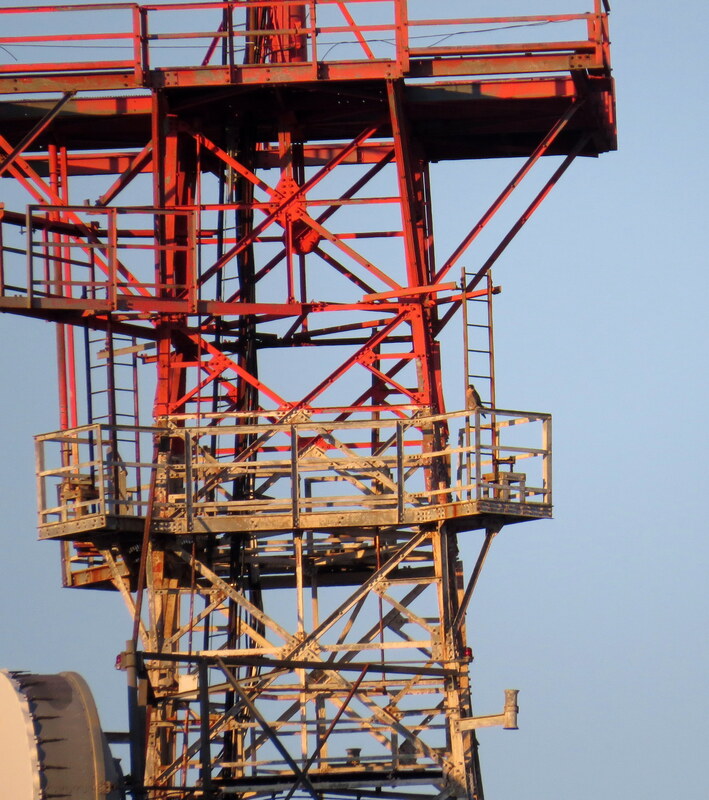 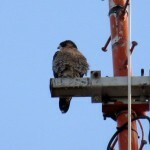 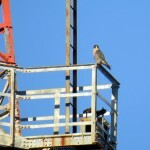 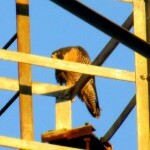 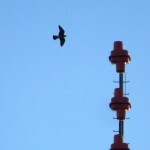 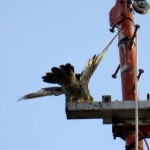 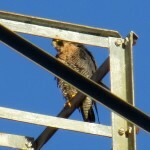 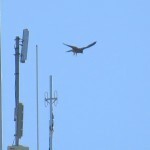 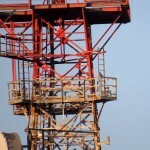 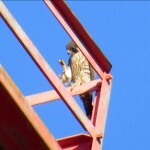 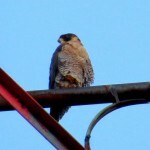 On my way there I spotted a falcon on a cell tower next to Tops on East Ridge Rd. 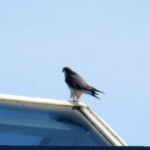 from Route 104. 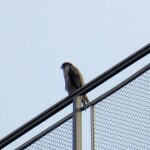 By the time I got off the expressway and over there it was gone. 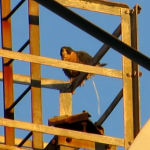 I suspect it was Big Frank but can’t confirm that. 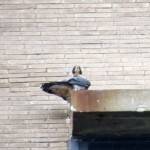 She didn’t show up at the mall for me-I can’t remember the last time I saw her but she’s still going there as Dana and Carol saw her there today. 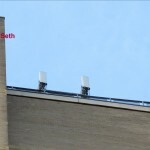 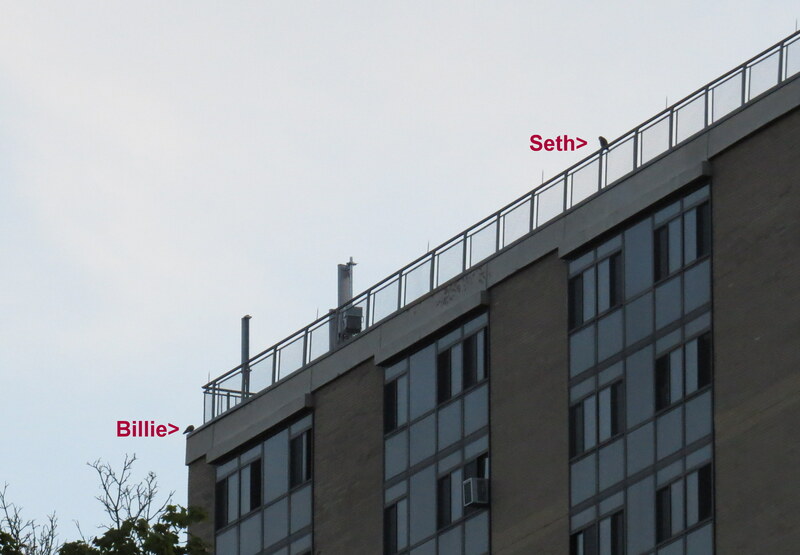 I headed for home at Seneca Towers where I found Seth on the west railing and Billie on the top south end window ledge. Neither one had food in their crop so they were most likely looking for breakfast to fly by. 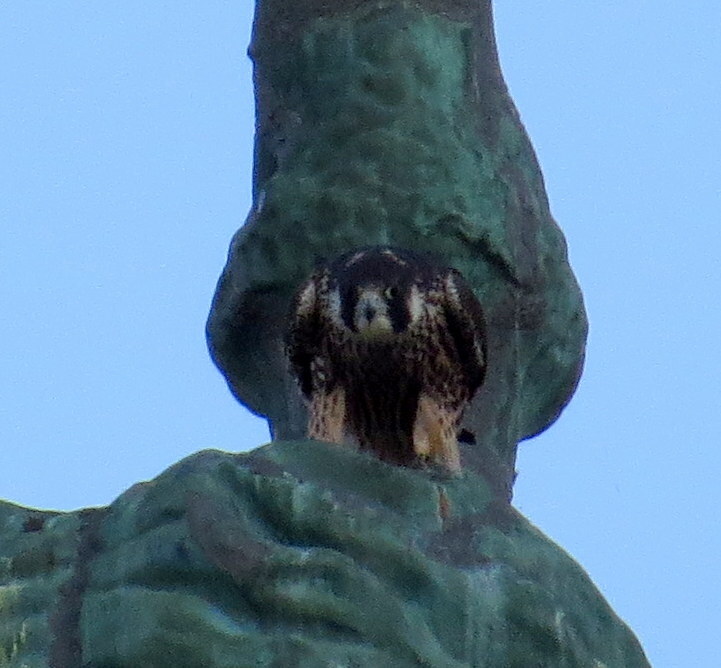 I left them at 9:15am-our 4 resident Rochester Peregrine Falcons were seen this morning and as usual, that put a smile on my face! 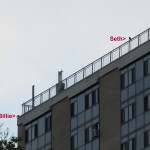 I hate to sound like a broken record but I started my watch at the north end of Seneca Towers with Billie and Seth, who were on the top window ledge. 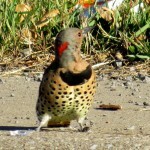 They mix it up sometimes by switching sides on me-keeps me on my toes. 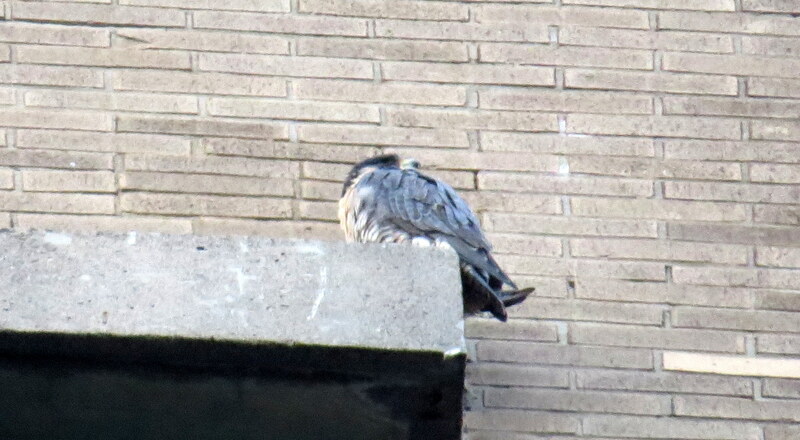 I’m sure as the days get colder they will be perching on the south end of the building where there’s sun to warm them up in the morning. 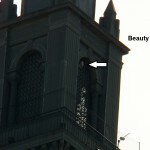 Anyway, I left them to check downtown for Beauty and Dot.ca (DC). 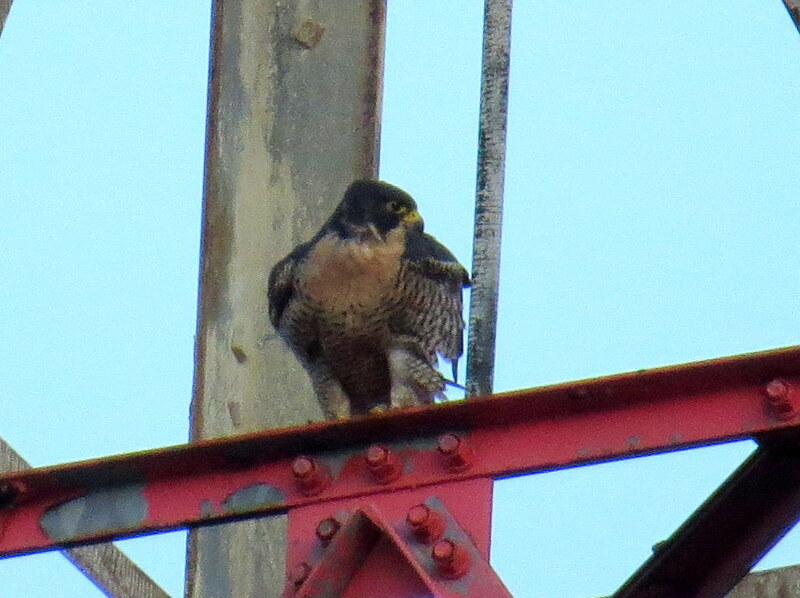 From the Andrews St. bridge (ASB) I spotted DC on the north corner 2nd I-beam of OCSR where he blended in very well about 7:10am. 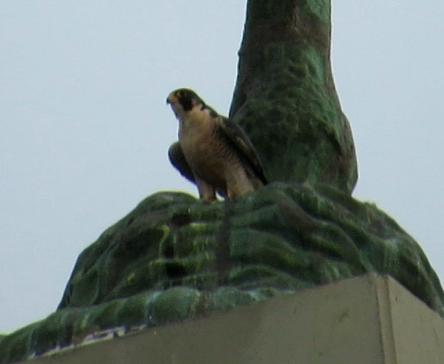 I drove over to State St. just south of Church St. to get a better look at him. 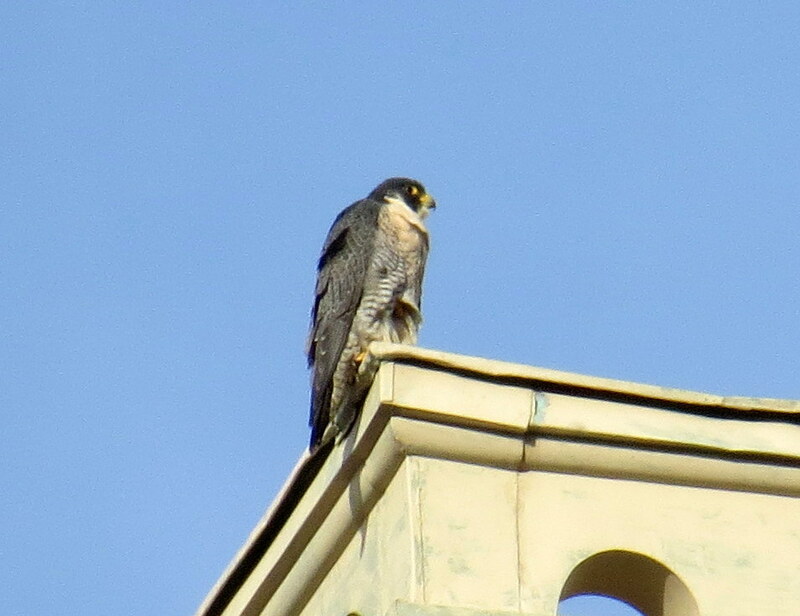 DC watched all around his surroundings and flew off to the east at 7:30am. 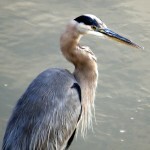 I was going to head up to the Broad St. bridge but traffic was backed up due a lane closure so I opted for the ASB again. 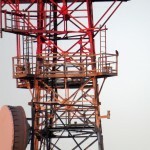 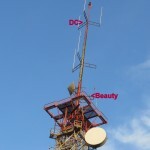 When I first pulled over there were no PEFA’s in sight and just as I was about to leave Beauty landed on the northeast cube of the Frontier Communications Tower (FCT). 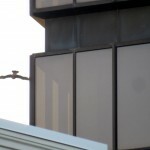 I parked over on Fitzhugh St. by the Sister Cities garage and taped a video of her before she turned around to show me her back. 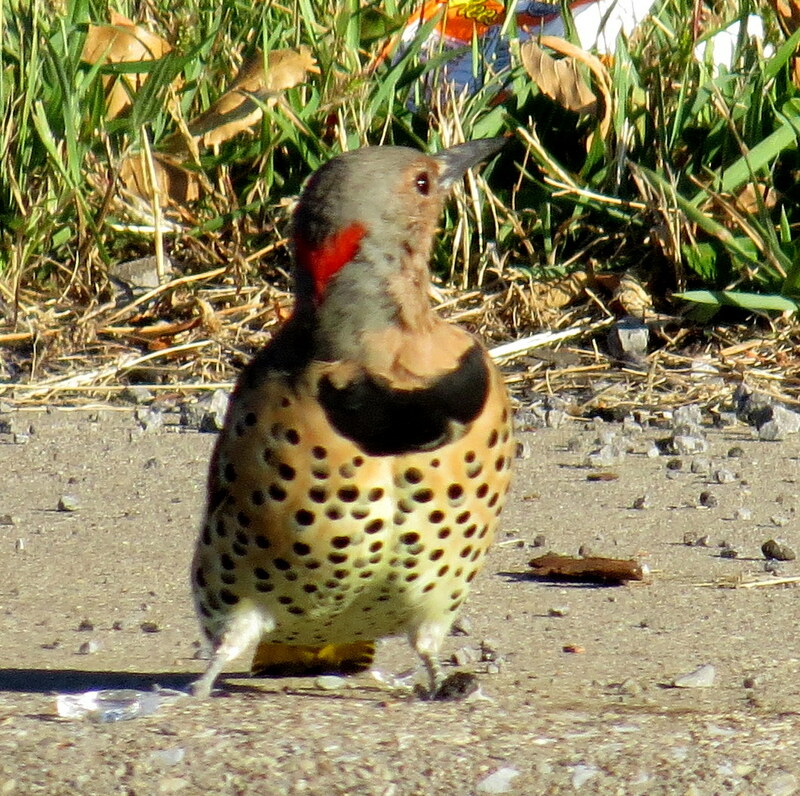 As I was watching someone pull into the parking lot, Beauty left. 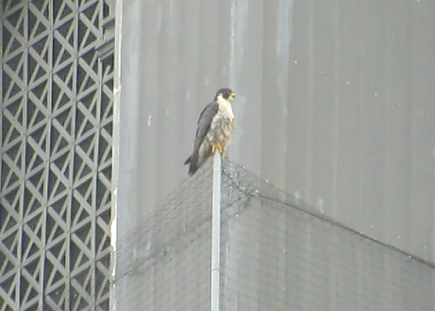 just as I was about to go look for her DC came flying in and landed on the southeast cube of FCT. 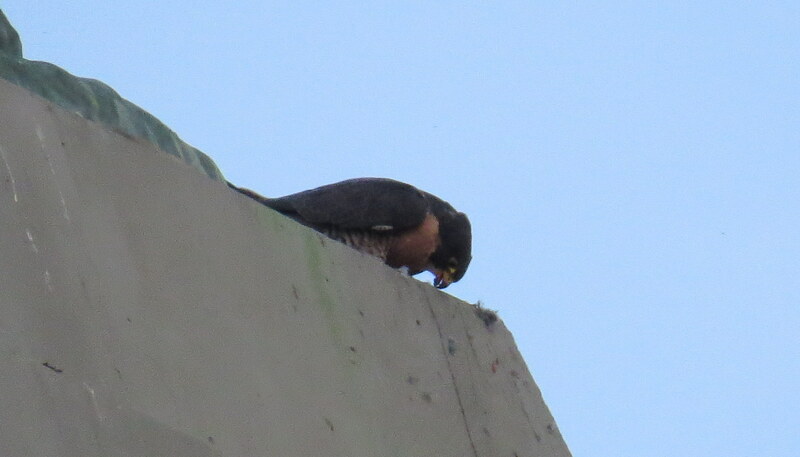 He immediately started feaking so I knew he had been eating-probably leftovers from Beauty as she had a full crop. 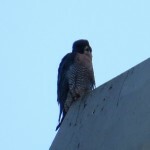 After a few minutes he too, turned his back on old MAK so I went back down to Fitzhugh and Church St. DC did some picking at his talons and some more feaking then he settled down into a scrunched down perching position. 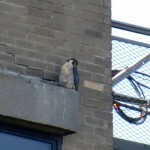 I left him a little after 8am and headed for Irondequoit to look for Big Frank but once again he was nowhere to be found. 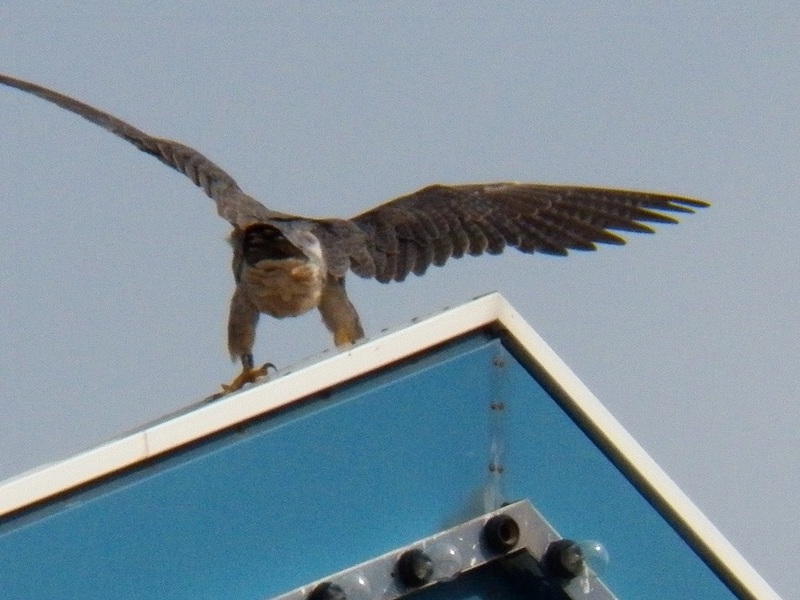 She was seen a couple days ago near the Sears store on the northeast end of the Medley Centre mall by watcher Dawn. 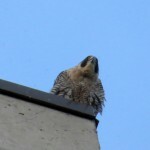 I’m hoping she has just changed her morning routine and hasn’t left the area. 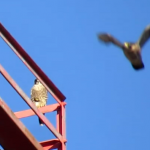 Falcons do that sometimes, whether it’s so they don’t over hunt one area or just because they want a change of scenery or what, I just don’t know for sure. 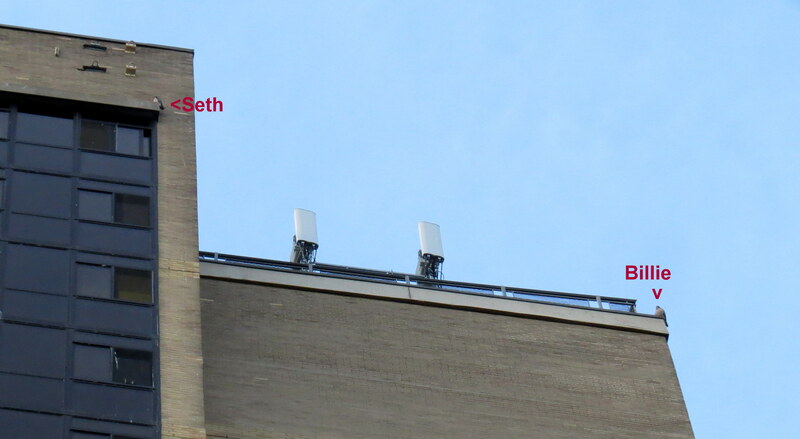 I stayed for half hour or so then I headed home to Seneca Towers where I found Billie and Seth at the north end of the building from my spot on East Ridge Rd. 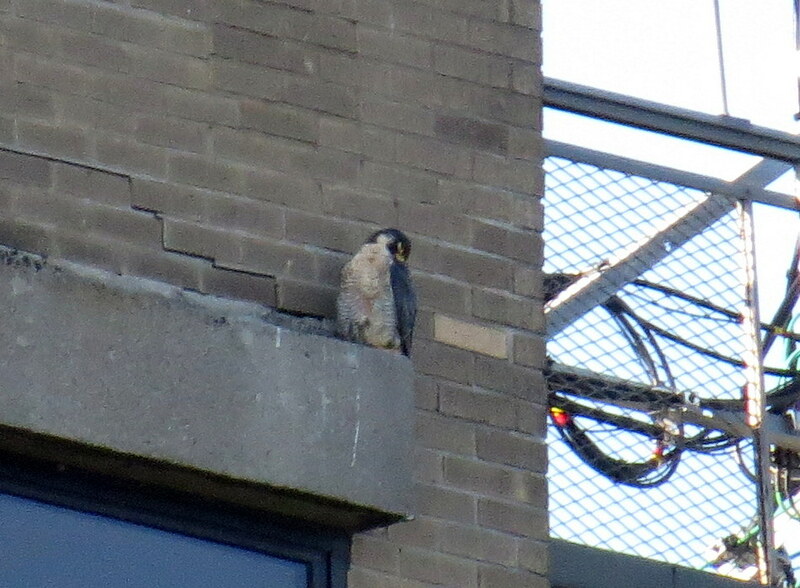 near St. Paul St. She was on the northwest corner preening and he was in his spot on the top window ledge looking at her over his shoulder with a full crop. 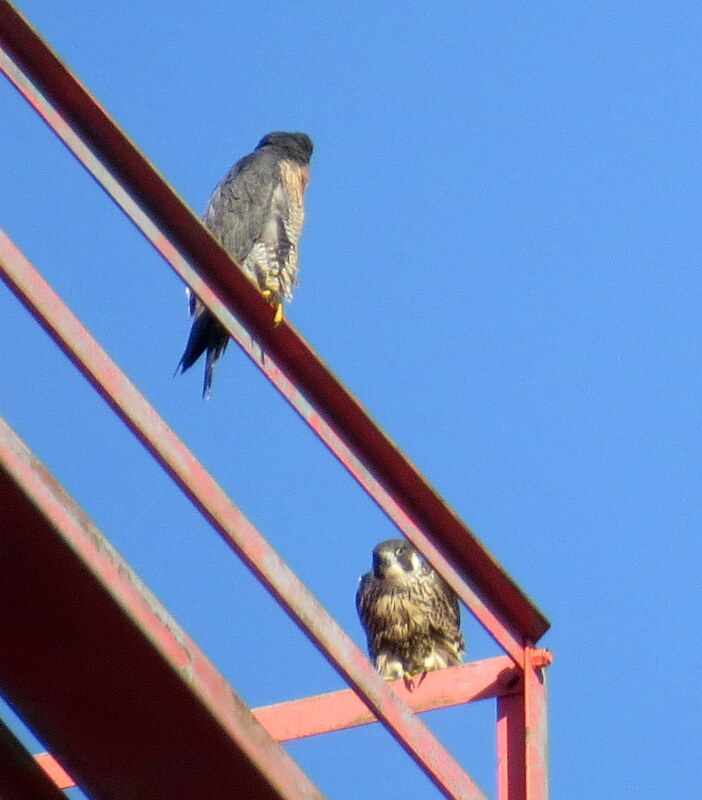 This pair is really together these days! 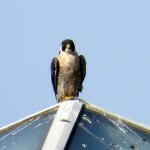 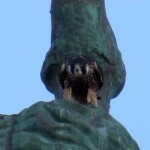 I ended my watch at 9am smiling as all 4 resident Rochester Peregrine Falcons were seen and doing fine! 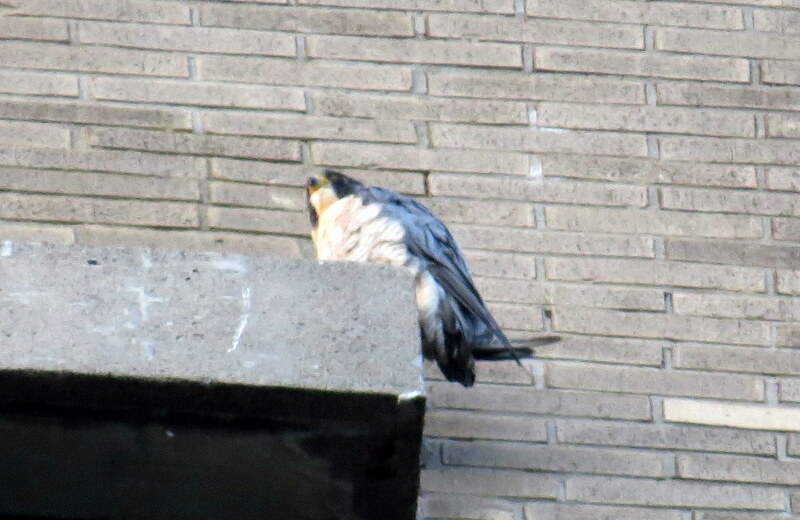 I began my day with Seth, who was on the top window ledge at the north end of Seneca Towers in his usual spot. 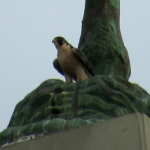 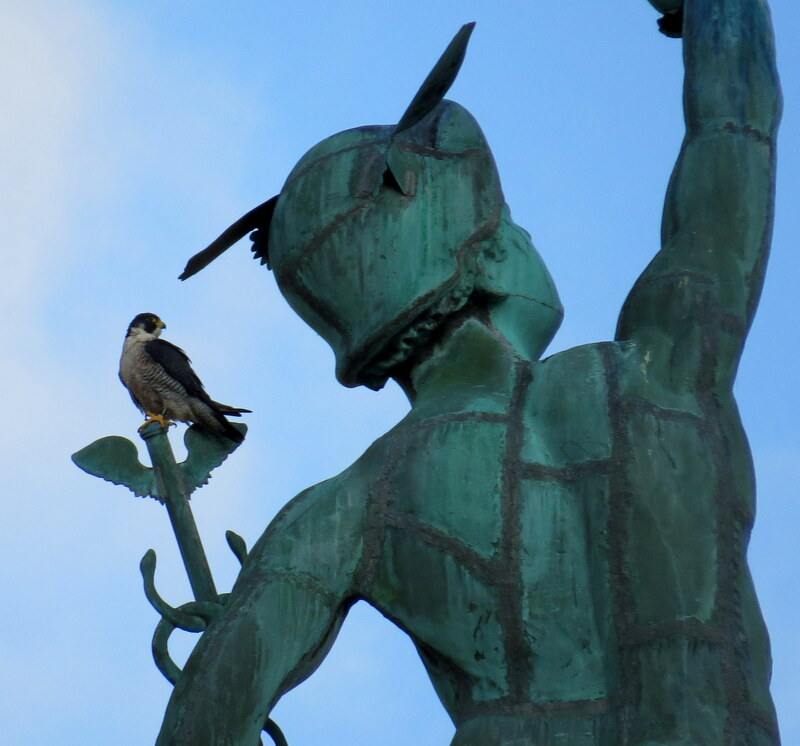 Next stop- the Andrews St. bridge (ASB) where I spotted a falcon on the top east side railing of the Powers building with its back to me. 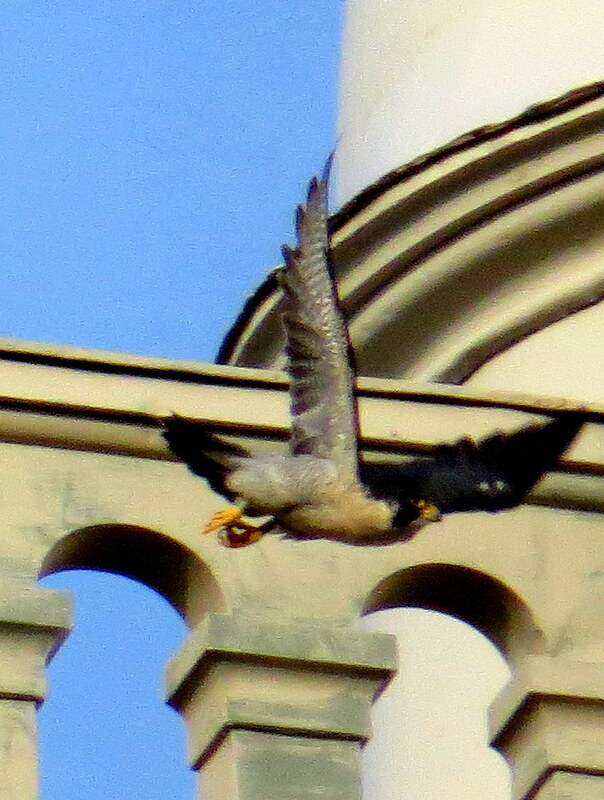 DC started to spread his wings-I took the pic and before my camera could get back to show him on my little LCD screen he was gone. 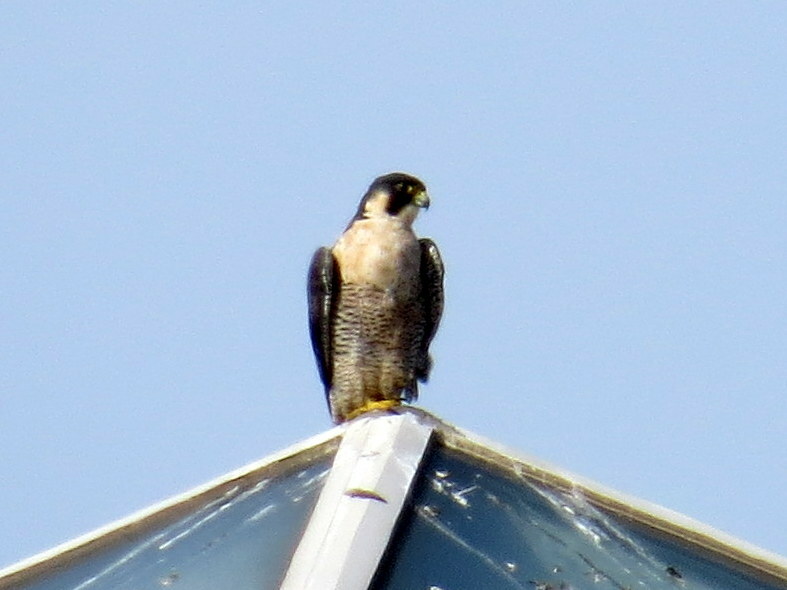 I suspected he went to the nest box as I looked up quick and didn’t see him in the air. I returned to the ASB where I could see the front of the Powers nest box and sure enough DC was perched there. 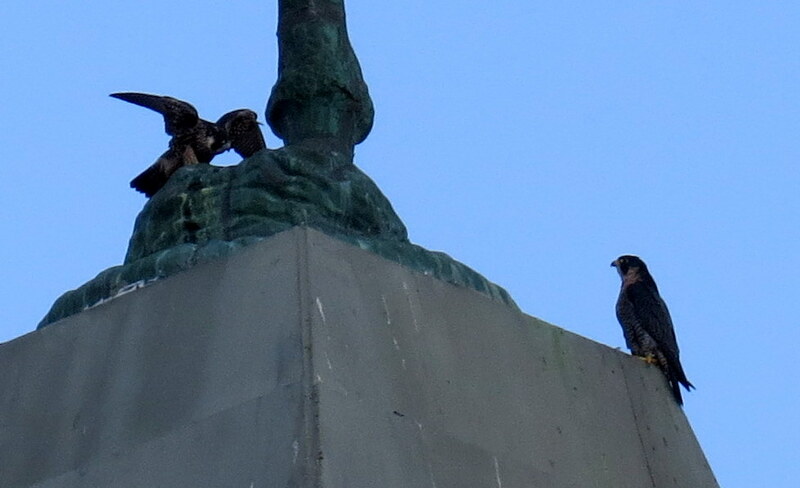 I could also see a falcon on the base of Mercury. 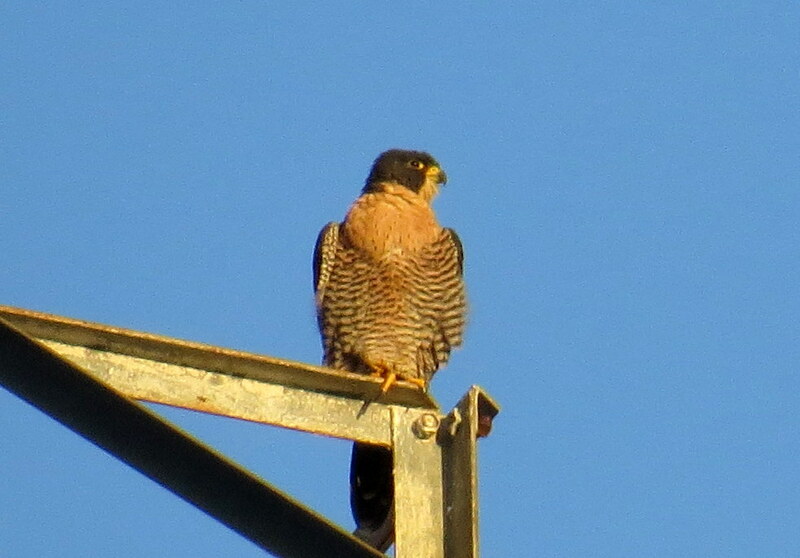 I went back over to Aqueduct St. for the best view of Beauty, who was on the base of Mercury about 8am. 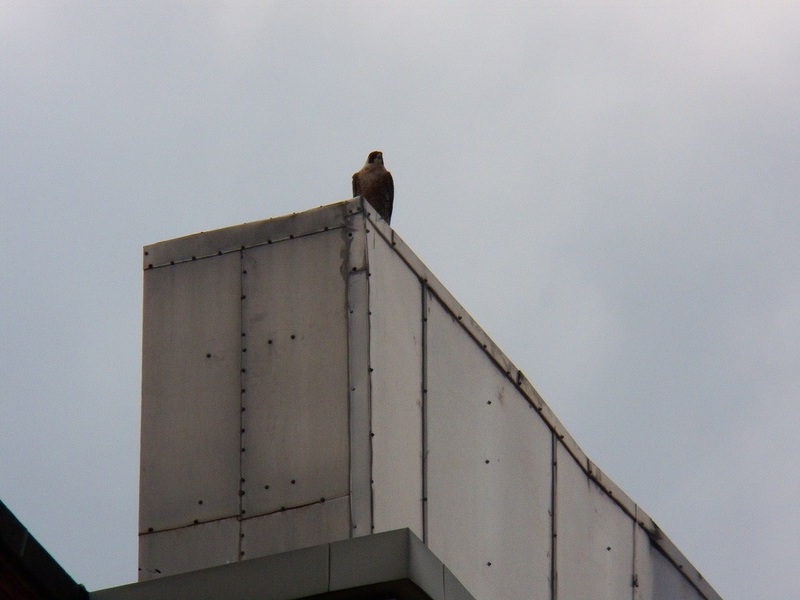 She was looking over her surroundings. 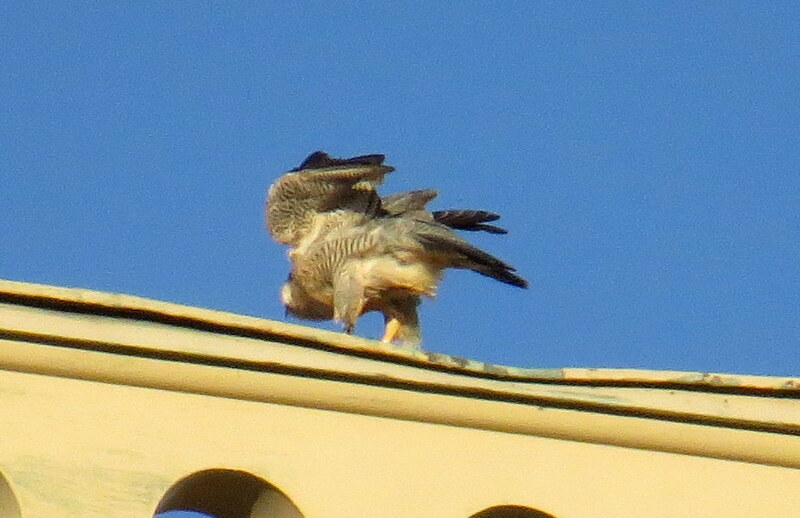 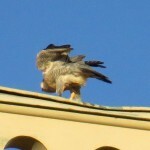 Just before she flew off, the Beautyful one stretched out her right leg and wing. 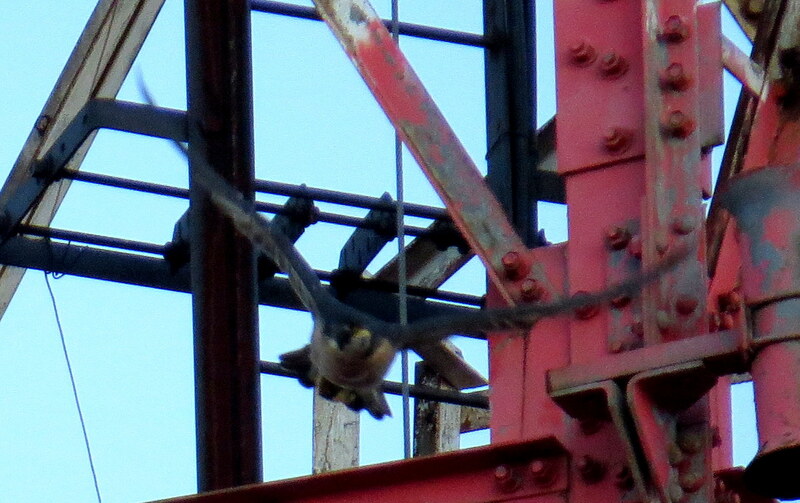 I wasn’t ready for the take off but managed to get most of her in the frame. 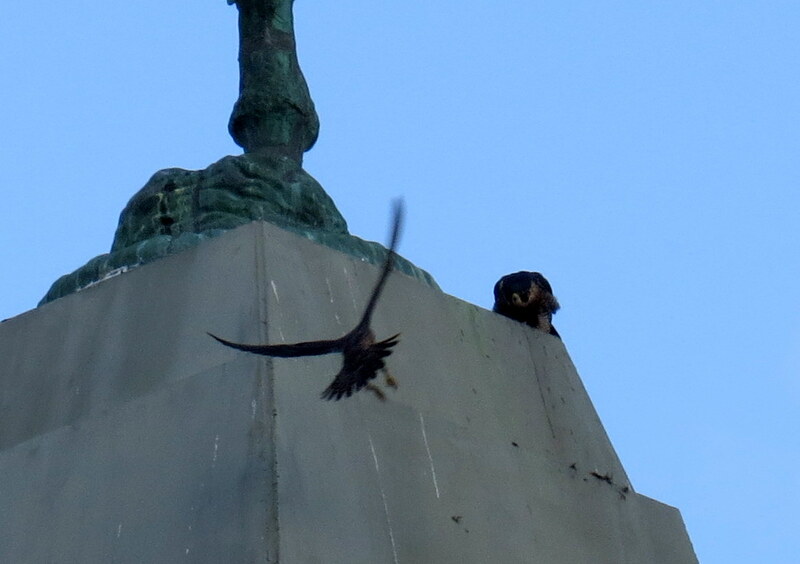 They’re so fast! 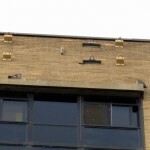 I decided to head over to the Medley Center and as I drove down State St. 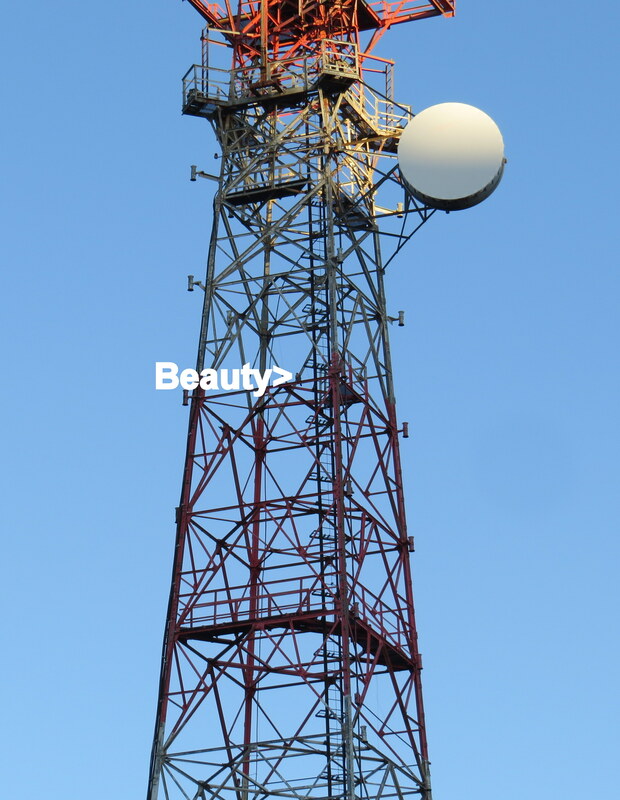 I noticed Beauty over on the northeast cube of the Frontier Communications tower so I pulled over and took a couple shots of her. 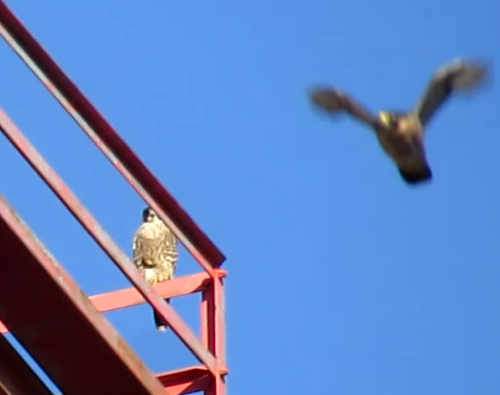 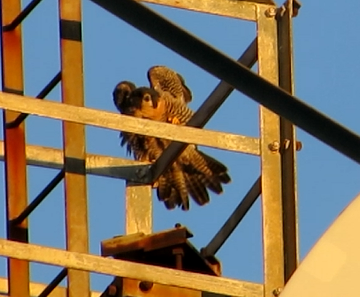 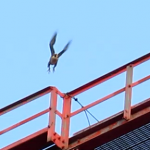 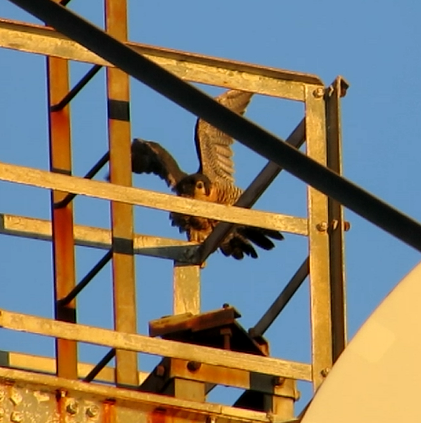 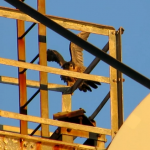 After I left, Donna reported that she saw 2 falcons on the Frontier platform railing from watching the rfalconcam forums pan cam. 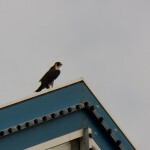 Thanks and good job eagle eye! 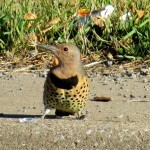 I had no luck again finding Big Frank at the mall in Irondequoit but I did come across a Northern Flicker woodpecker on the sidewalk gorging on ants. 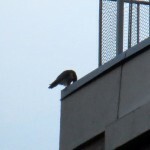 I stayed about a half hour then left for home at Seneca Towers. 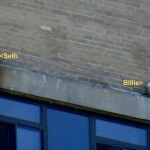 Billie and Seth were on the north end top window ledge when I got to my checking spot on East Ridge Rd. 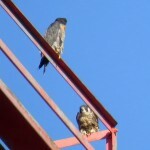 I left them to it at 9:30am as they both had their eyes closed at one point. 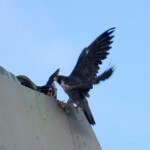 It was a watch worthy of a big smile as I saw our 2 resident PEFA pairs doing well! 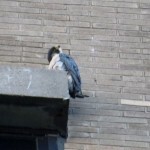 Billie and Seth were on the top window ledge north end of Seneca Towers across from each other and both were preening as I started out at 7am. 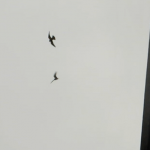 I left them right away and headed downtown. 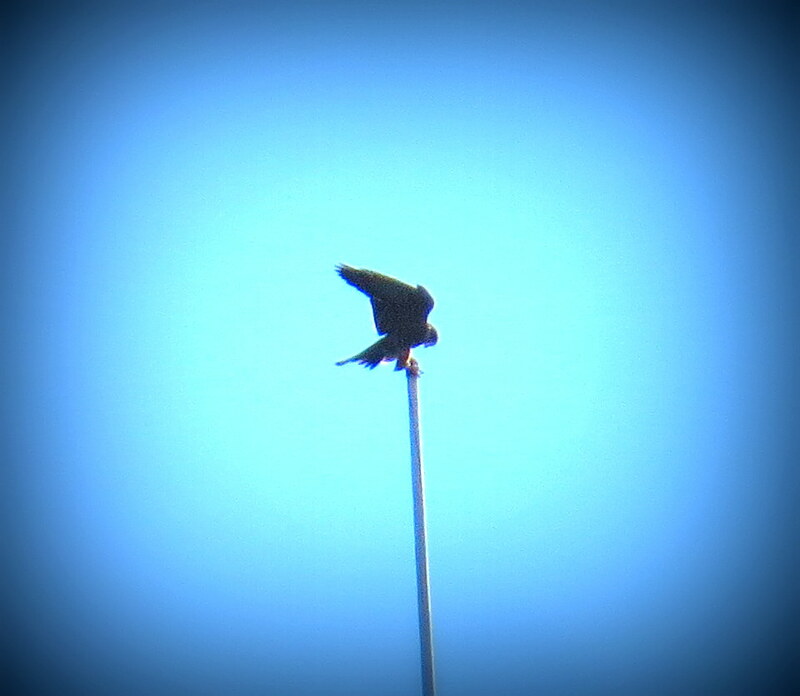 It took me a while to find a PEFA but I did see a Kestrel on a light pole at Frontier Field. 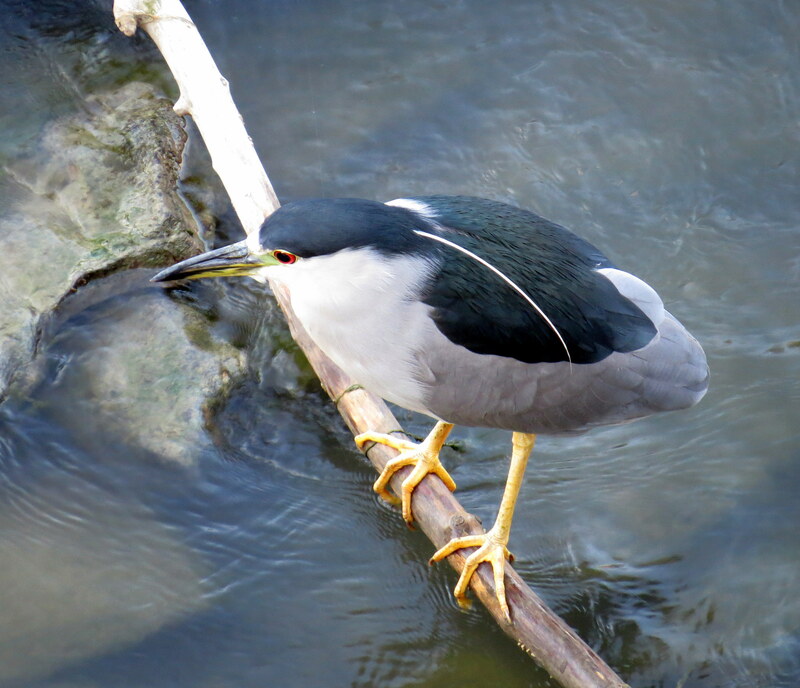 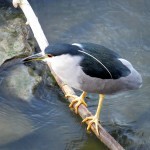 I checked out the river from the Broad St. bridge (BSB) and found a Black-crowned Night Heron hunting. 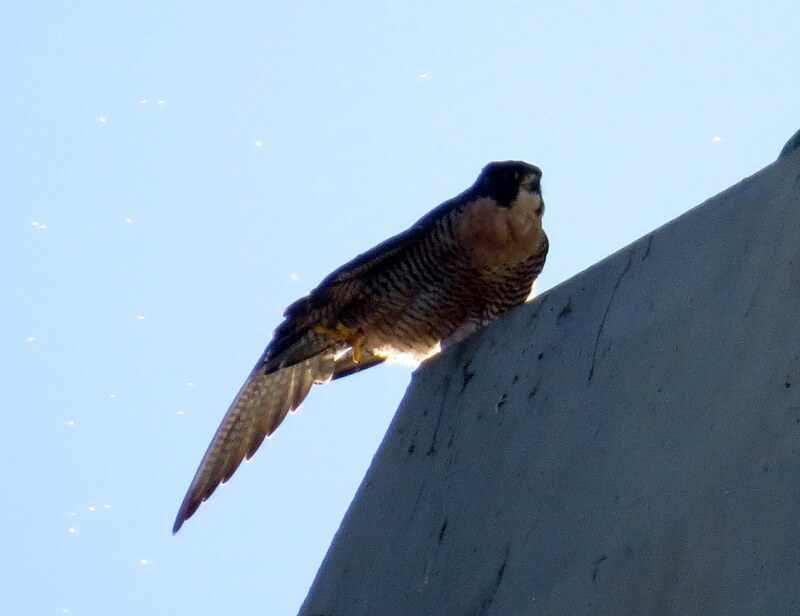 It flew away and just as I turned around to cross over to the other side of the bridge Dot.ca (DC) came flying in and landed on the base of Mercury at 7:42am. 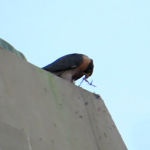 He took a look around then flew down to the tiny ledge below the base next to a small piece of leftover prey. 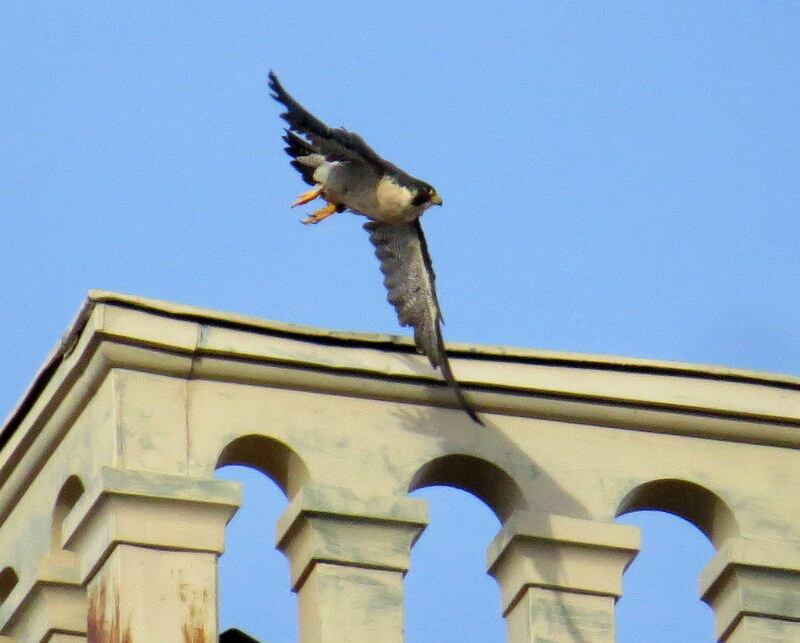 Soon after Beauty flew in and landed on the base above DC. 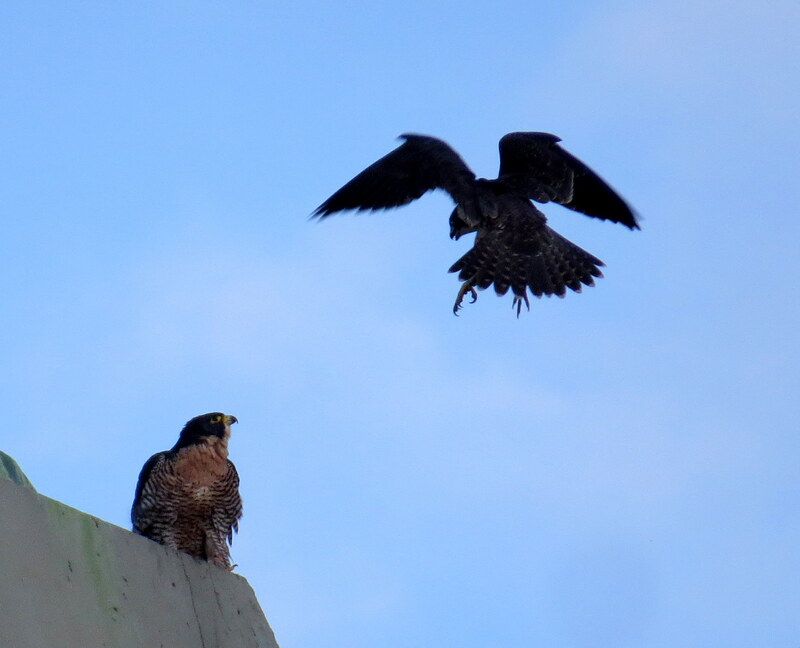 He kept looking up then tried to land next to her but flew off instead. 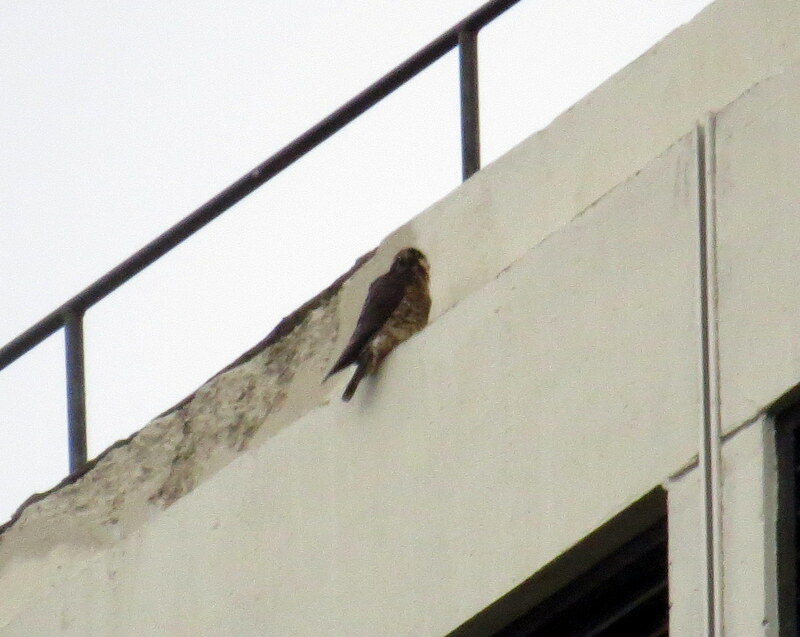 A third falcon started flying with DC and at first I thought perhaps we had an intruder but it turned out to be a juvie by the name of Genesee. 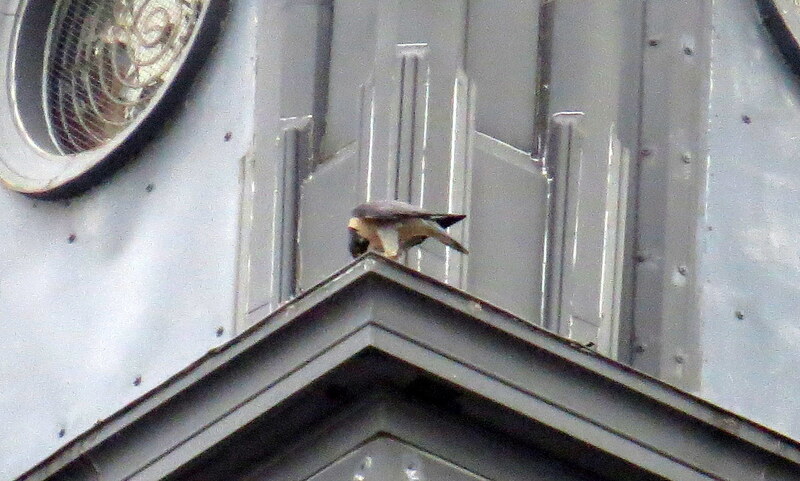 DC had landed on Mercury’s hand after flying past the Beautyful one a couple times as Genesee started buzzing past mom. 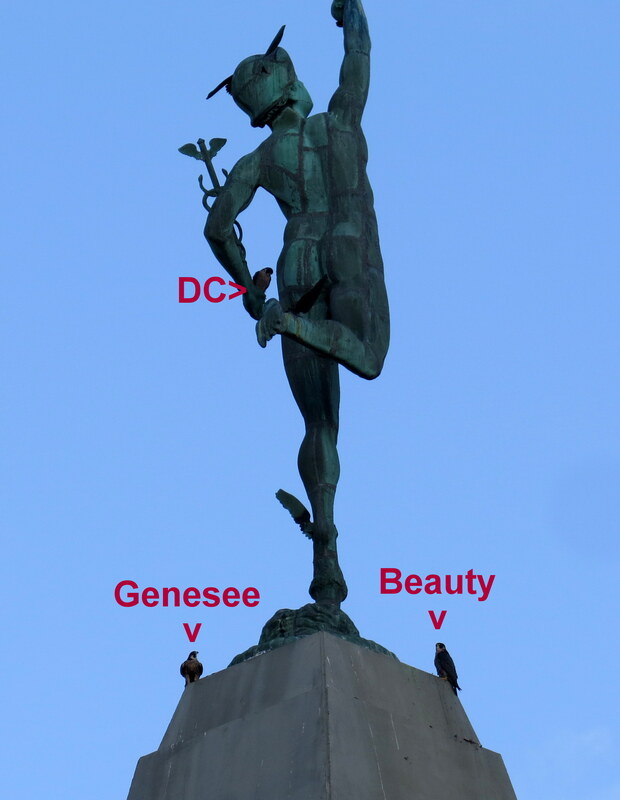 Beauty and DC watched as Genesee came flying in and landed on the base of Mercury. 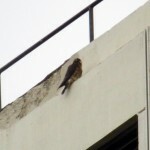 He soon jumped up to the green part of the base. 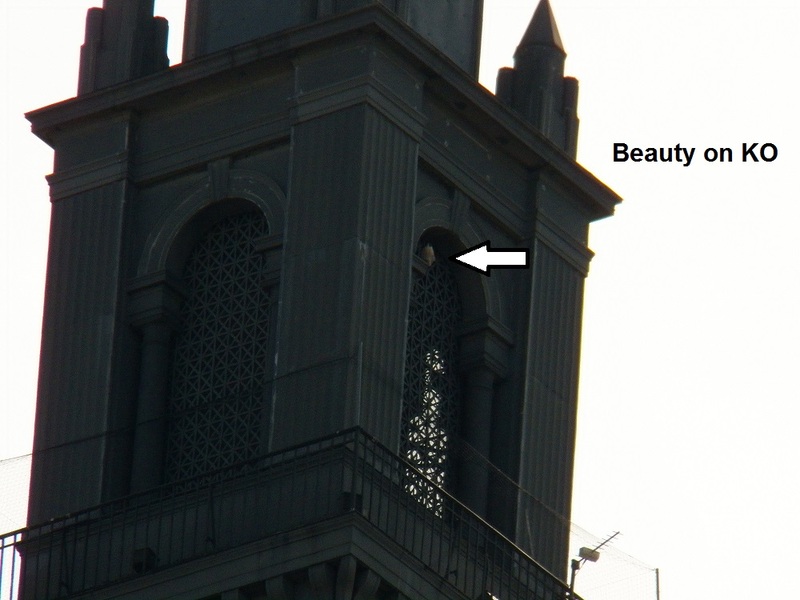 In the meantime, Beauty stayed planted on her corner of the base as Genesee flew off. 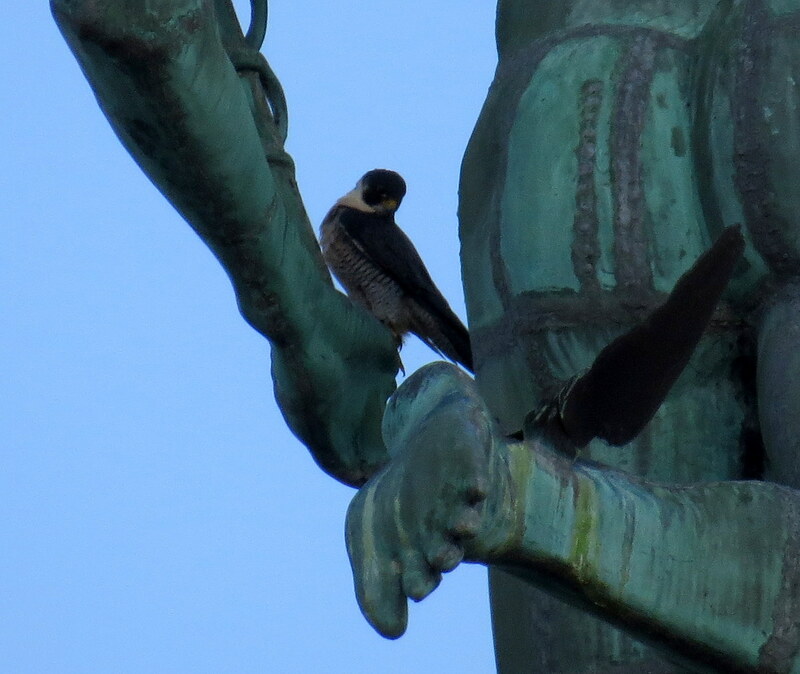 DC went after him then returned and came to rest on Mercury’s staff. 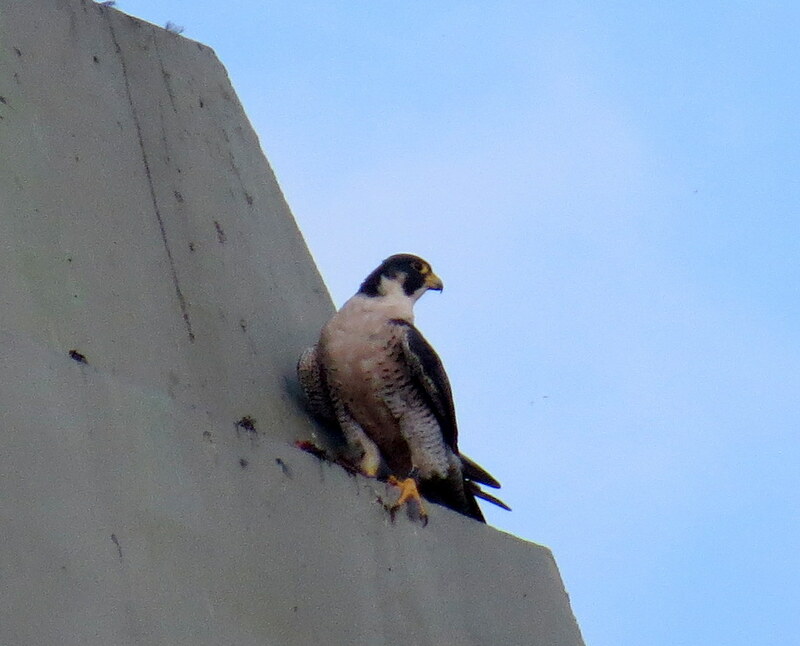 After DC flew east she went up to the green part of the base. 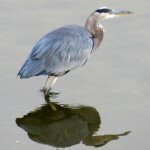 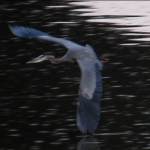 While I was taping I spotted a Great Blue Heron in the river hunting so I snapped off a pic of him as well around 8am. 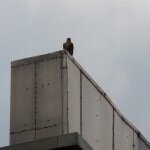 A few minutes later I spotted whom I believe were DC and Genesee flying above and around Xerox from the BSB. 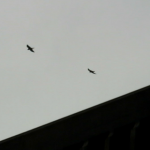 They kept going behind the tallest building in Rochester and reappearing. 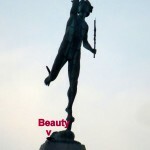 Beauty was now gone from Mercury. 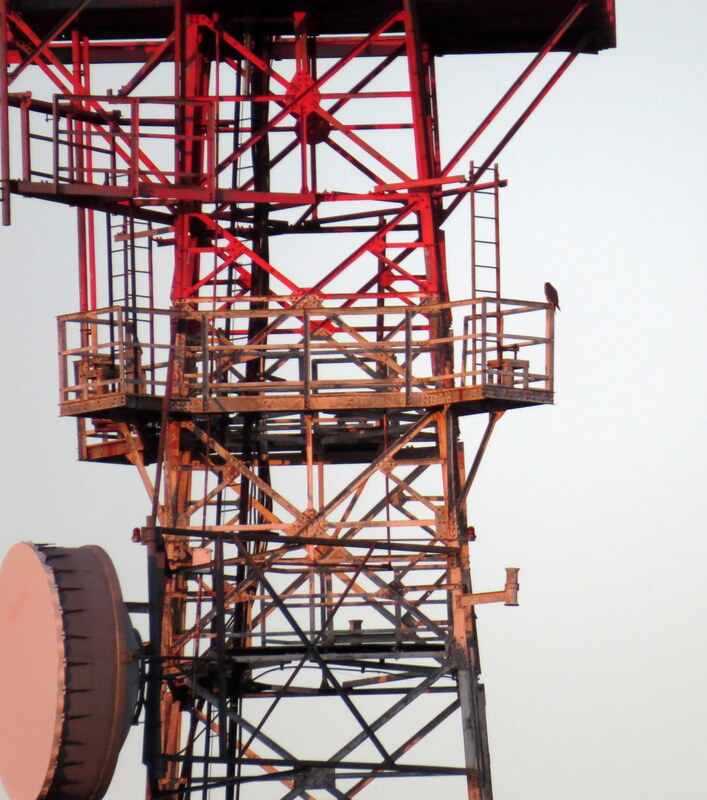 One of them landed on one of the antennas. 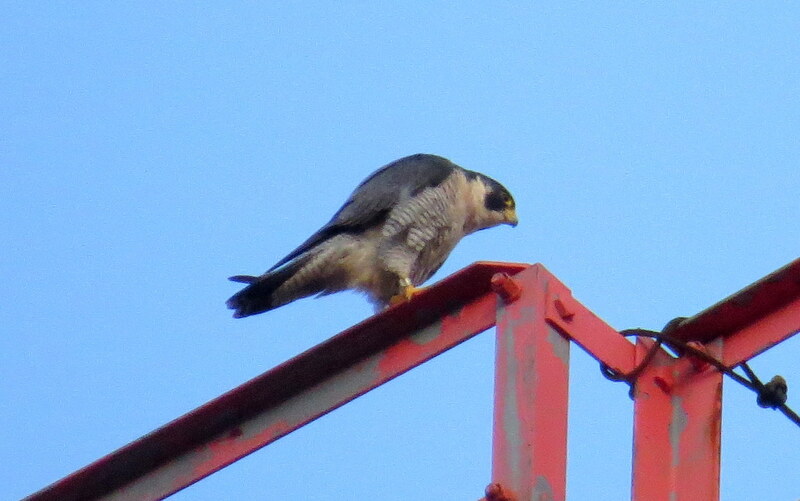 As I tried to find somewhere to get a better angle for identifying the falcon it left. 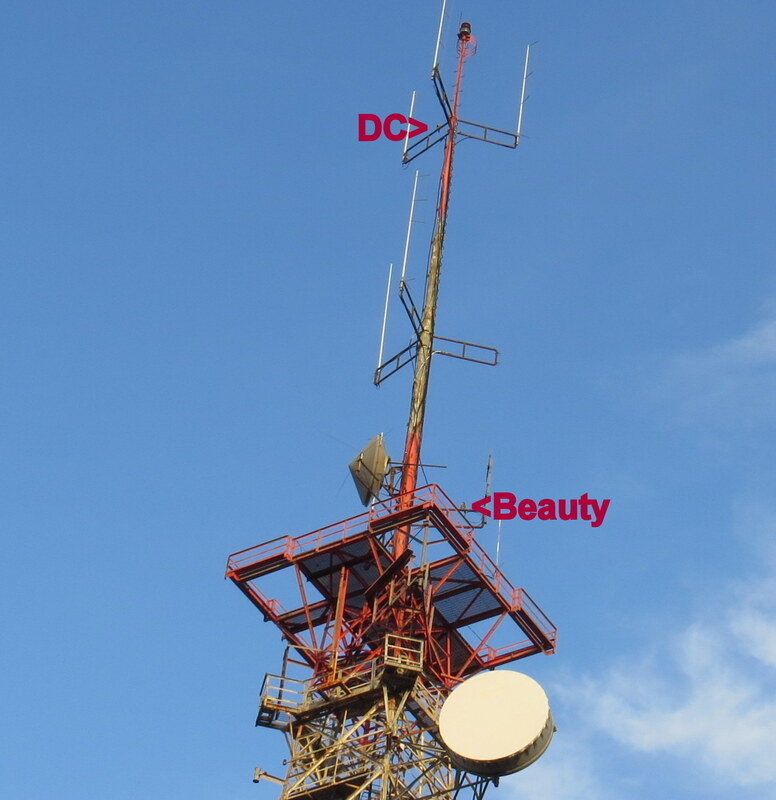 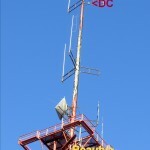 15 minutes later I found Beauty and DC on the Frontier Communications tower (FCT). 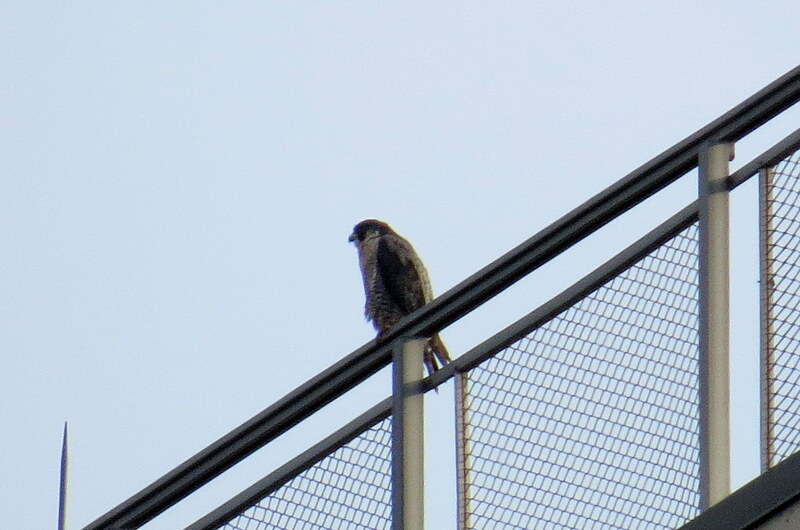 She was on the east side platform railing and he was on the top arm. 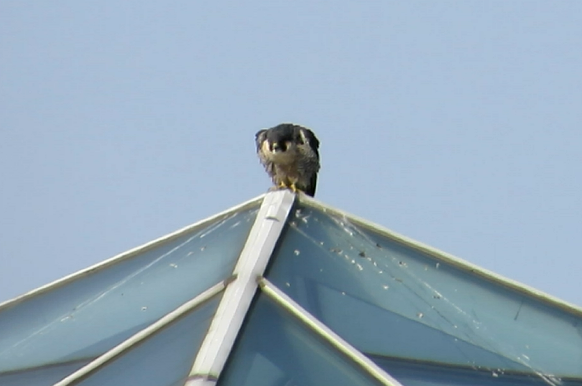 While taping them I was focused on DC who kept looking down and when I panned the camera down to Beauty it was then that I realized what he had been watching-Genesee had joined mom on the railing. 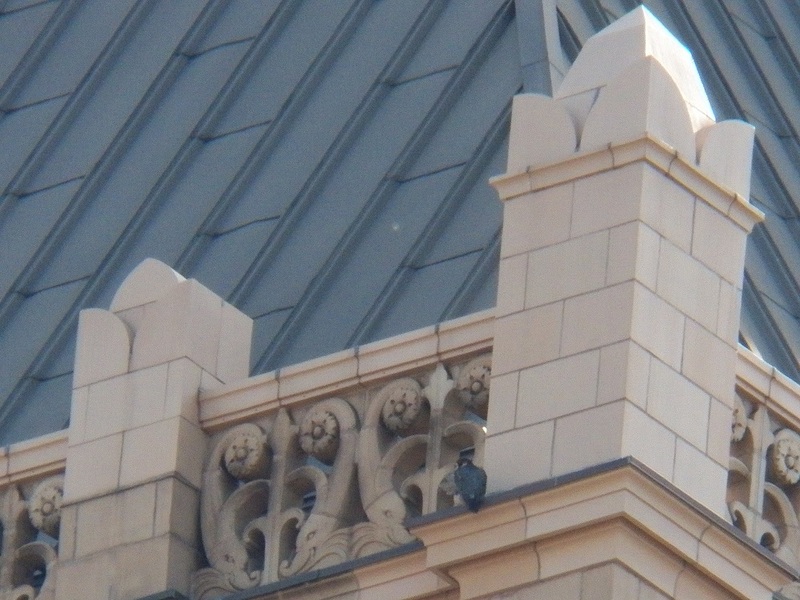 A couple minutes later as I was parked on Fitzhugh St. in front of City Hall, Genesee walked around the corner to the north side of the railing. 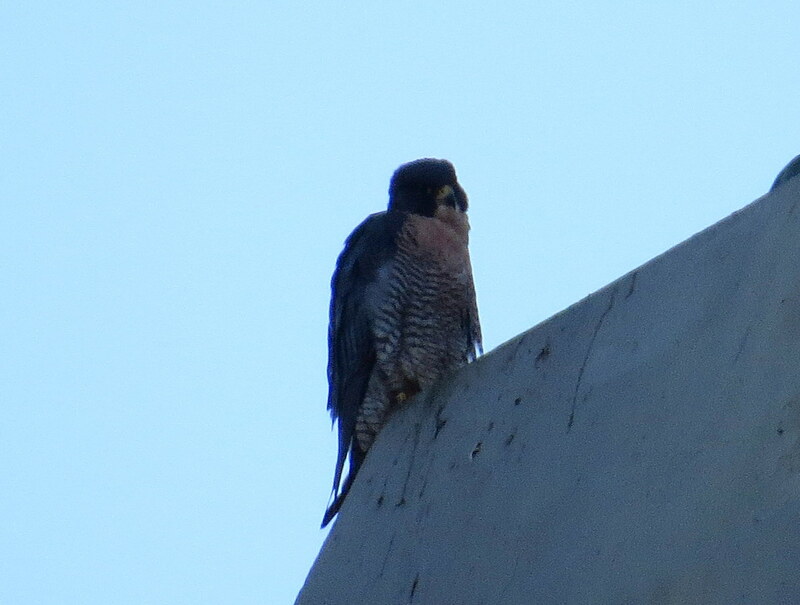 I had to move farther down t see all of him as a beam was blocking his face. 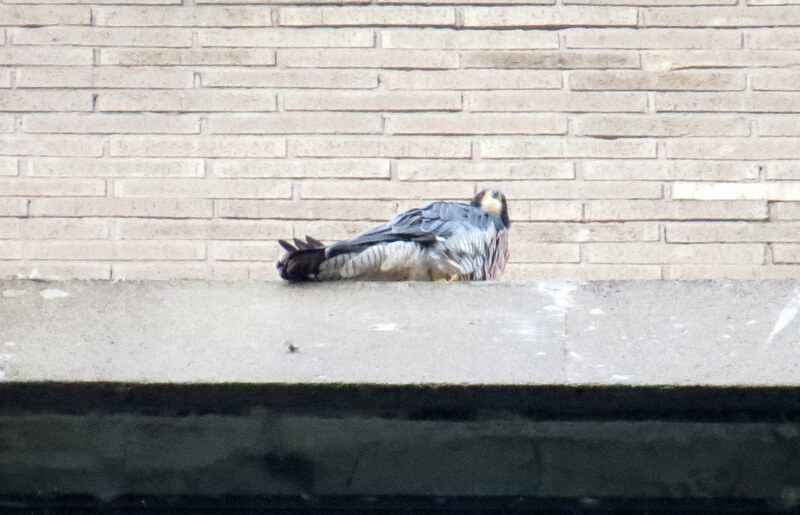 Genesee preened and pooped and preened some more. 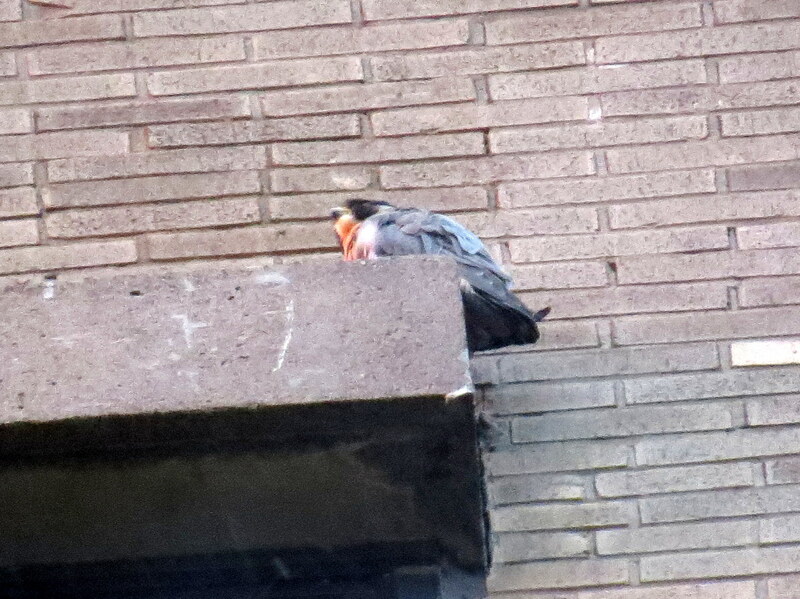 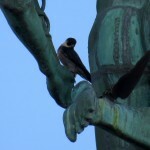 Just before 9am Beauty flew south and then it was father and son on FCT preening. 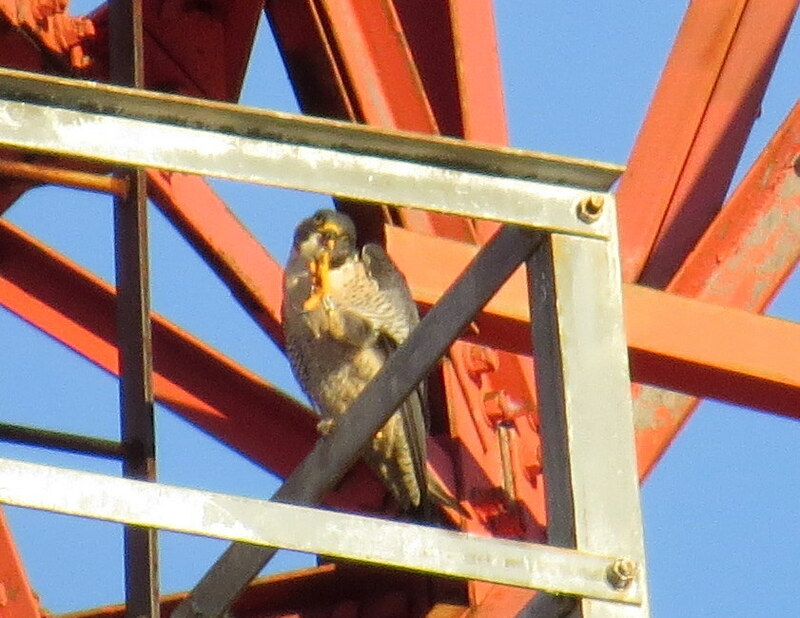 Genesee appeared to have a little food in his crop. 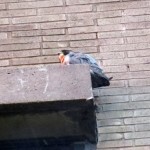 When I left them, Genesee was napping as I headed for the Medley Centre to try my luck at finding Big Frank. 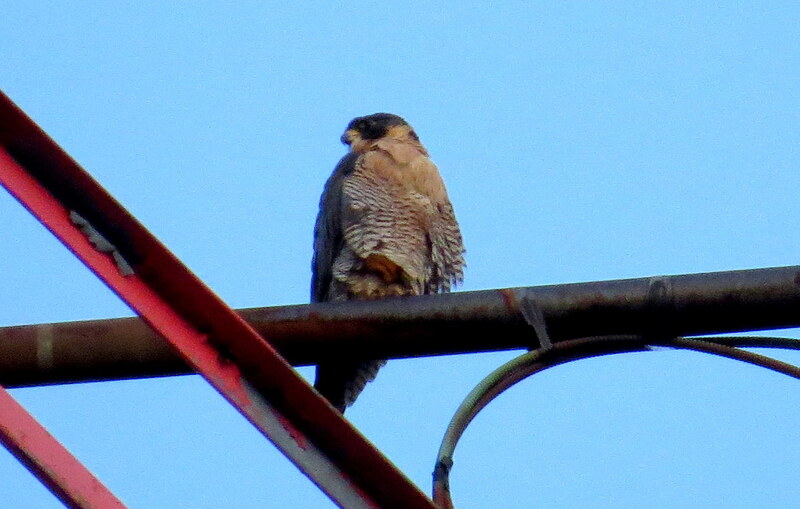 Well I didn’t find him but I did watch a couple crows fighting over a small bit of leftover prey. 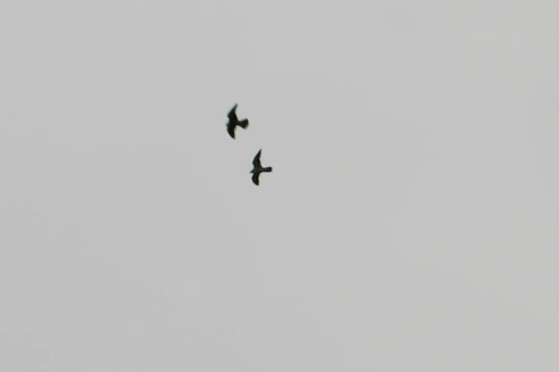 One of them flew off with it and then a bunch more followed behind out of view. 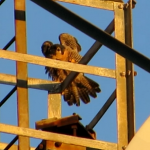 I had to be somewhere so I wrapped up my watch at 9:45am and left after a fun falcon watch which featured the return once again of Genesee, the juvie that keeps on giving me smiles!